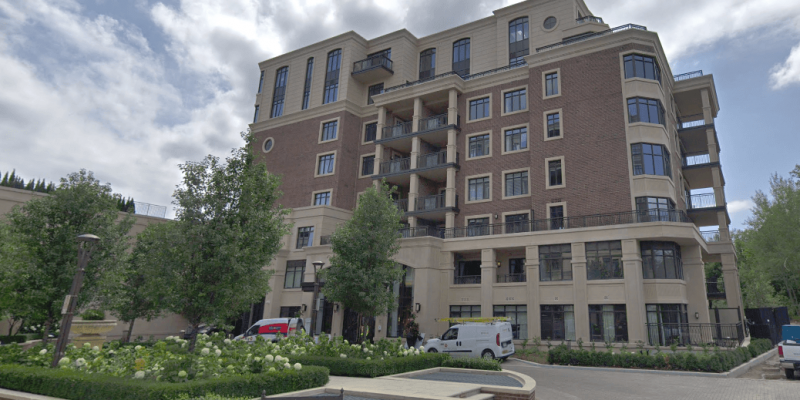 Colours of Emerald City – Phase IV is located at 52 Forest Manor Rd, near the intersection of Don Mills Rd and Sheppard Ave E. This condo was built in 2018 and has suites ranging from 495 to 840 square feet. Amenities include a Gym/Exercise Room, Pool, Concierge/Security Guard, Party Room, Guest Suites and Meeting/Function Room. 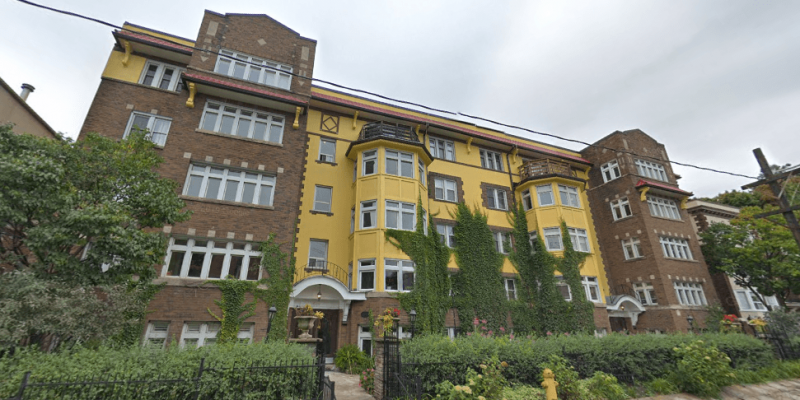 Heathwood Manor is located at 35 Raglan Ave, near the intersection of Bathurst and St Clair. This condo was built in 2013 and has suites ranging from 755 to 970 square feet. Monthly maintenance fees include hydro, building insurance, common element maintenance, heat and water. On the Avenue is located at 1044 Avenue Rd, near the intersection of Avenue and Eglinton. This condo was built in 2017 and has suites ranging from 1679 to 2329 square feet. Monthly maintenance fees include building insurance, common element maintenance and water. 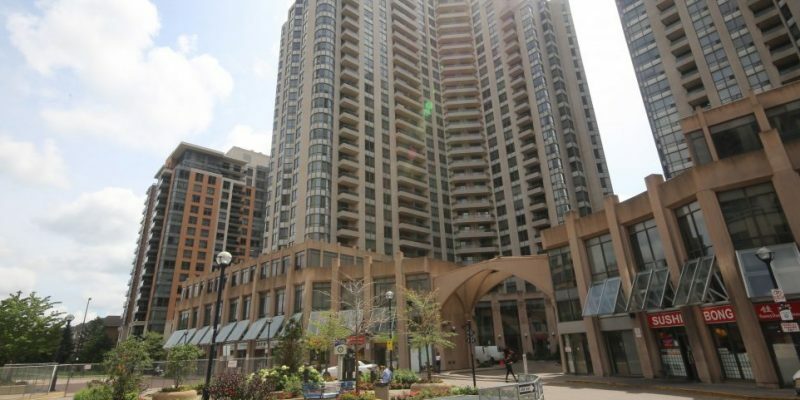 480 Oriole Pkwy is located near the intersection of Yonge and Eglinton. This condo was built in 2011. Monthly maintenance fees include building insurance, common element maintenance, heat and water. 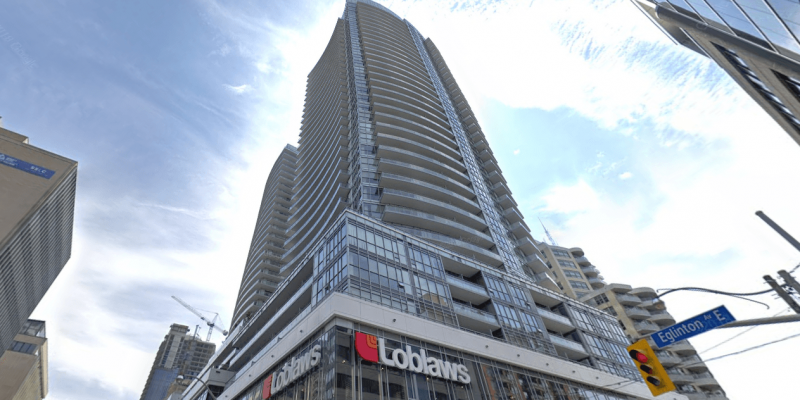 La Piazza Lofts is located at 39 Roehampton Ave, near the intersection of Yonge and Eglinton. 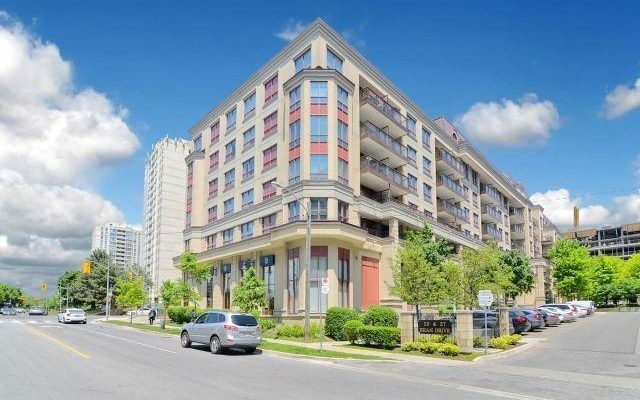 This condo was built in 1990 and has suites ranging from 613 to 1085 square feet. Monthly maintenance fees include hydro, common element maintenance, heat and water. 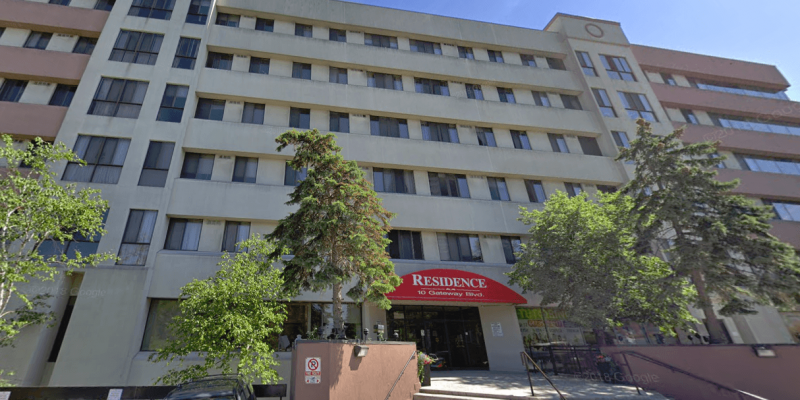 LA Courtyards is located at 639 Lawrence Ave W, near the intersection of Dufferin and Lawrence. This condo was built in 2017 and has suites ranging from 686 to 1035 square feet. Monthly maintenance fees include building insurance, common element maintenance and water. 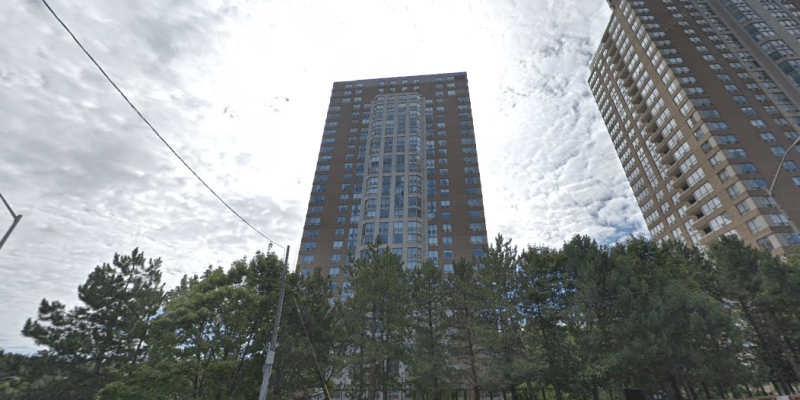 The Rio – Tower 2 is located at 253 Merton St, near the intersection of Mt Pleasant and Davisville. This condo was built in 2002 and has suites ranging from 387 to 1408 square feet. Amenities include a Gym/Exercise Room, Concierge/Security Guard, Party Room, Meeting/Function Room, Parking Garage and Sauna. The Republic North Tower is located at 25 Broadway Ave, near the intersection of Yonge and Eglinton. This condo was built in 2010 and has suites ranging from 555 to 3283 square feet. Amenities include a Gym/Exercise Room, Concierge/Security Desk, Party Room, Guest Suites, Media Room/Cinema, Meeting/Function Room, Parking Garage and Sauna. One Donwoods is located at 1 Donwoods Dr, near the intersection of Yonge and York Mills. This condo was built in 1992 and has suites ranging from 1646 to 3094 square feet. Monthly maintenance fees include cable TV, building insurance, common element maintenance, water and parking. 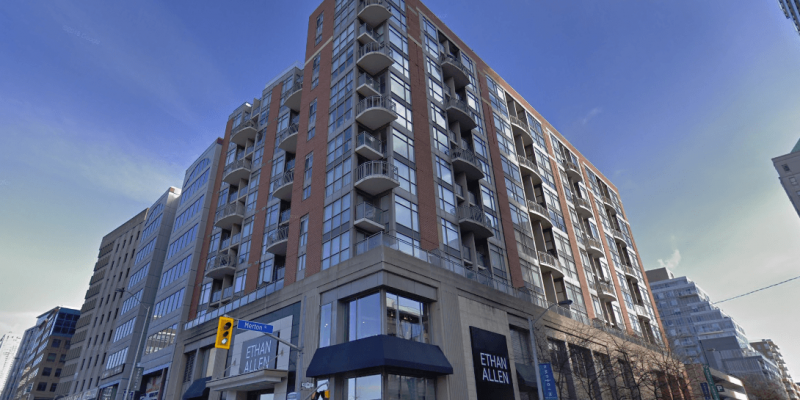 E Condos is located at 2263 Yonge St, near the intersection of Yonge and Eglinton. This condo was built in 2017 and has suites ranging from 466 to 1240 square feet. Amenities include a Gym/Exercise Room, Pool, Common Rooftop Deck, Party Room, BBQs, Guest Suites, Hot Tub/Jacuzzi, Media Room/Cinema, Meeting/Function Room, Parking Garage and Concierge/Security Guard. 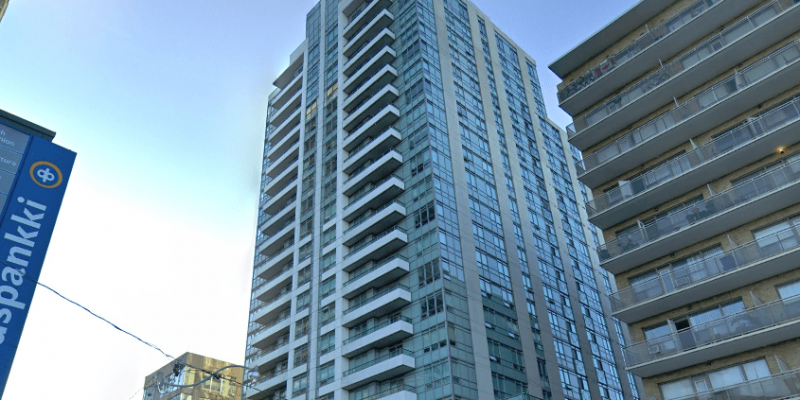 E Condos is located at 8 Eglinton Ave E, near the intersection of Yonge and Eglinton. This condo was built in 2017 and has suites ranging from 466 to 1240 square feet. Amenities include a Gym/Exercise Room, Pool, Common Rooftop Deck, Party Room, BBQs, Guest Suites, Hot Tub/Jacuzzi, Media Room/Cinema, Meeting/Function Room, Parking Garage and Concierge/Security Guard. CityLights on Broadway is located at 99 Broadway Ave, near the intersection of Eglinton and Mt Pleasant. This condo was built in 2018 and has suites ranging from 420 to 695 square feet. Amenities include a Pool, Party Room, Basketball Court, BBQs, Guest Suites, Media Room/Cinema and Badminton. 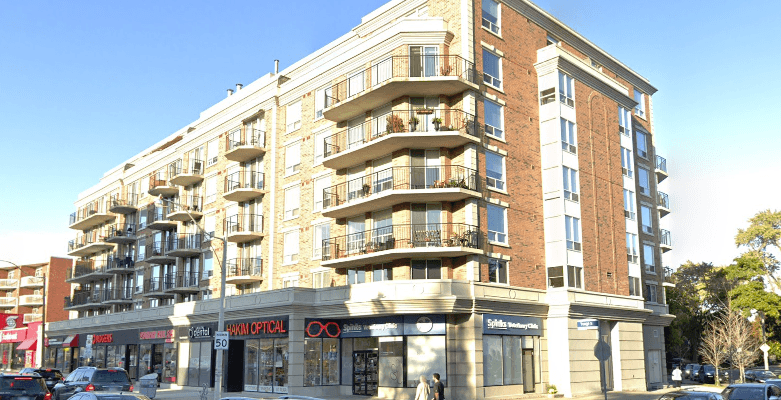 166 Sherwood Ave is located near the intersection of Eglinton and Mt Pleasant. This condo was built in 1979. Amenities include a Party Room, BBQs, Meeting/Function Room, Games/Recreation Room and Sauna. 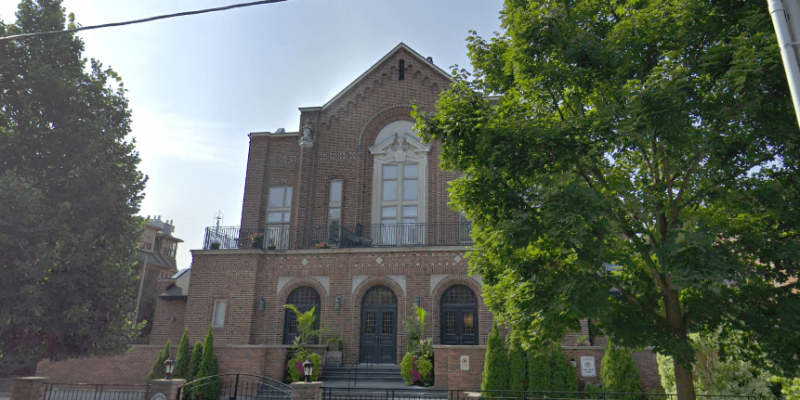 St George on Sheldrake is located at 65 Sheldrake Blvd, near the intersection of Yonge and Eglinton. This condo was built in 2005 and has suites ranging from 968 to 4349 square feet. Amenities include a Pool, Concierge/Security Guard, BBQs, Car Wash, Guest Suites and Parking Garage. 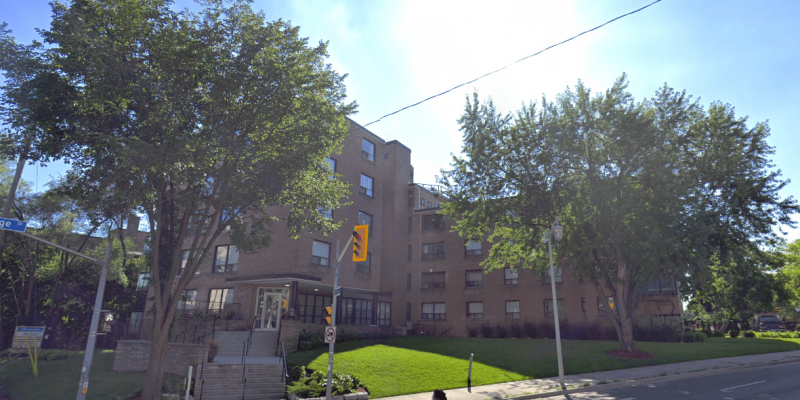 The Deloraine Residences is located at 3443 Bathurst St, near the intersection of Bathurst and Lawrence. This condo was built in 2012. Amenities include a Gym/Exercise Room, Party Room and Meeting/Function Room. 219 Wilson Ave Condos is located at 219 Wilson Ave, near the intersection of Wilson and Bathurst. This condo was built in 1970 and has suites ranging from 615 to 745 square feet. Monthly maintenance fees include heat, water, parking, building insurance and common element maintenance. The 228 Condominiums and Towns is located at 228 Wilson Ave, near the intersection of Avenue and Wilson. This condo was built in 2016. Amenities include a Gym/Exercise Room, Common Rooftop Deck, Concierge/Security Guard, Party Room, Guest Suites, Outdoor Patio/Garden, Games/Recreation Room and Spa. 1657 Bathurst St is located near the intersection of Bathurst and Eglinton. This condo was built in 2017. Monthly maintenance fees include building insurance, common element maintenance, heat and water. 2600 Bathurst Condos is located at 2600 Bathurst St, near the intersection of Bathurst St and Eglinton Ave W. This condo was built in 1970. Amenities include a Gym/Exercise Room, Concierge/Security Guard, Party Room, Meeting/Function Room, Games/Recreation Room, and Sauna. 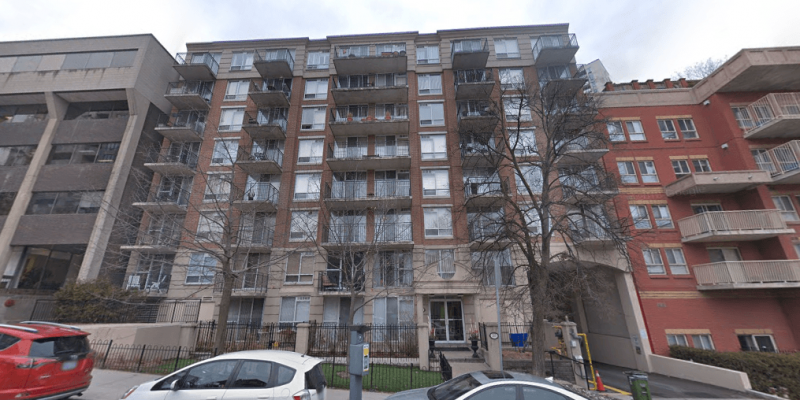 2400 Bathurst Condos is located at 2400 Bathurst St, near the intersection of Bathurst St and Eglinton Ave W. This condo was built in 2014 and has suites ranging from 739 to 1426 square feet. Amenities include a Gym/Exercise Room. 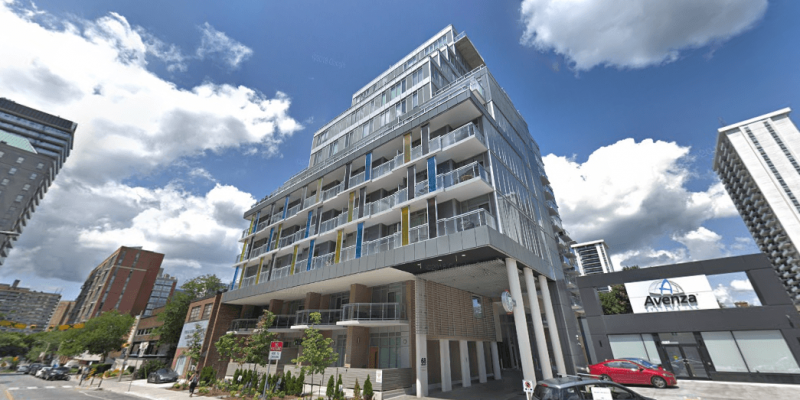 Ridelle Plaza is located at 2 Ridelle Ave, near the intersection of Bathurst St and Eglinton Ave W. This condo was built in 2011. Amenities include a Common Rooftop Deck, Games/Recreation Room. 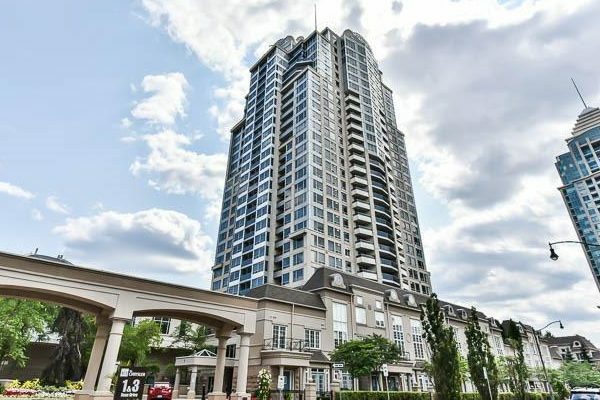 The Tapestry Condos is located at 225 The Donway W, near the intersection of Lawrence Ave E and Don Mills Rd. This condo was built in not on condos.ca and has suites ranging from 1700 to 2000 square feet. Amenities include a Gym/Exercise Room, Guest Suites, Pool, Media Room/Cinema, Car Wash, Concierge/Security Guard, Sauna and Parking Garage. 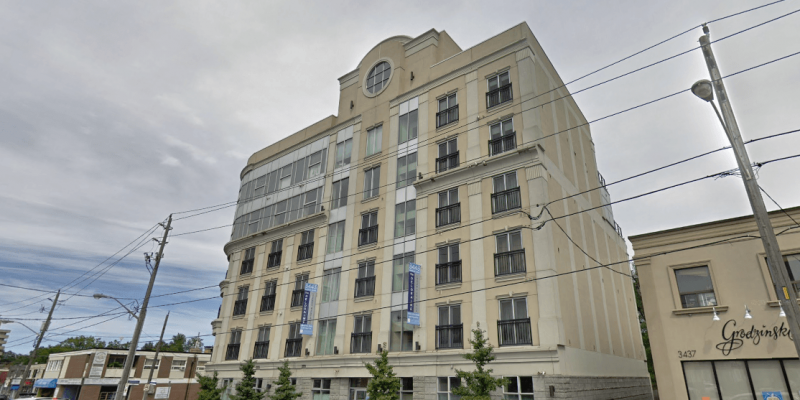 The Bayview is located at 1901 Bayview Ave, near the intersection of Bayview and Eglinton. This condo was built in 2011. Amenities include a Parking Garage. 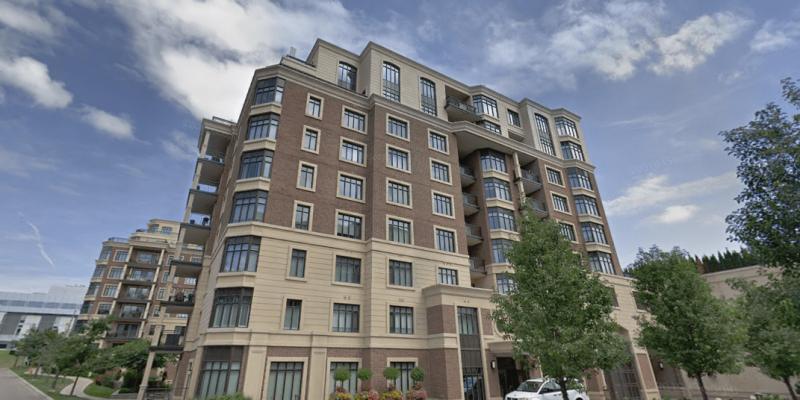 The Bayview is located at 1801 Bayview Ave, near the intersection of Bayview and Eglinton. This condo was built in 2003 and has suites ranging from 549 to 2265 square feet. Amenities include a Gym/Exercise Room, Concierge/Security Guard, Party Room, Parking Garage, Guest Suites, Meeting/Function Room. 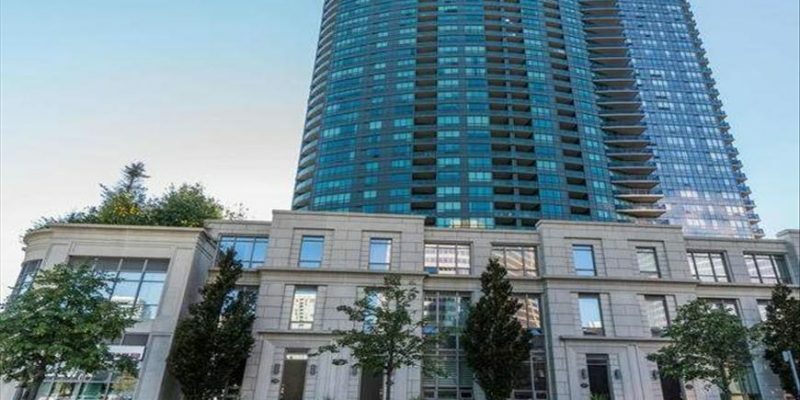 The Madison at Yonge and Eglinton is located at 98 Lillian St, near the intersection of Yonge and Eglinton. This condo was built in 2016 and has suites ranging from 395 to 1214 square feet. Amenities include a Gym/Exercise Room, Pool, Common Rooftop Deck, Party Room, Guest Suites, Media Room/Cinema and Outdoor Patio/Garden. The Madison at Yonge and Eglinton is located at 101 Eglinton Ave E, near the intersection of Yonge and Eglinton. This condo was built in 2016 and has suites ranging from 395 to 1214 square feet. Amenities include a Gym/Exercise Room, Pool, Common Rooftop Deck, Party Room, Guest Suites, Media Room/Cinema and Outdoor Patio/Garden. 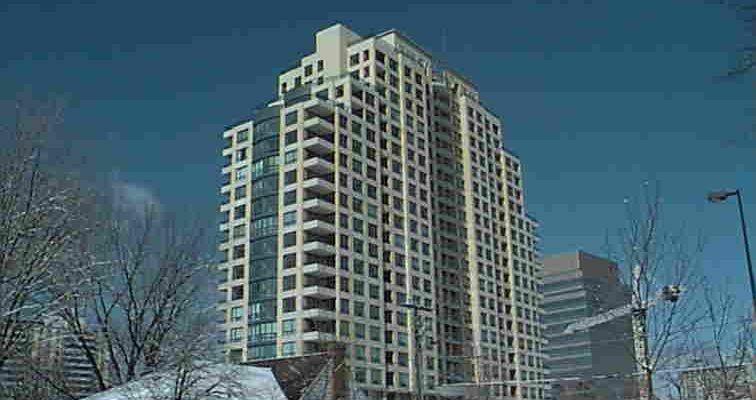 The Madison at Yonge and Eglinton is located at 89 Dunfield Ave, near the intersection of Eglinton and Mt Pleasant. This condo was built in 2016 and has suites ranging from 395 to 1214 square feet. Amenities include a Gym/Exercise Room, Pool, Common Rooftop Deck, Party Room, Guest Suites, Media Room/Cinema and Outdoor Patio/Garden. The Hemingway is located at 1599 Bathurst St, near the intersection of St Clair and Bathurst. 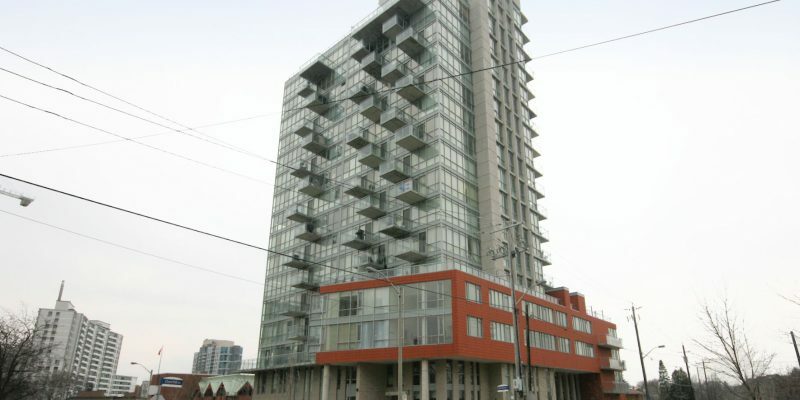 This condo was built in 2002 and has suites ranging from 1075 to 1171 square feet. Amenities include a Gym/Exercise Room and Parking Garage. The Hemingway is located at 205 The Donway W, near the intersection of DVP and Eglinton. This condo was built in 2005 and has suites ranging from 535 to 1716 square feet. Amenities include a Gym/Exercise Room, Pool, Common Rooftop Deck, Concierge/Security Guard, Party Room, Meeting/Function Room, Parking Garage and Sauna. Empire Midtown is located at 1603 Eglinton Ave W, near the intersection of Dufferin and Eglinton. This condo was built in 2018 and has suites ranging from 564 to 1275 square feet. Amenities include a Gym/Exercise Room, Common Rooftop Deck, Concierge/Security Guard, Party Room, BBQs, Bicycle Parking, Guest Suites, Media Room/Cinema, Meeting/Function Room, Parking Garage and Yoga Studio. 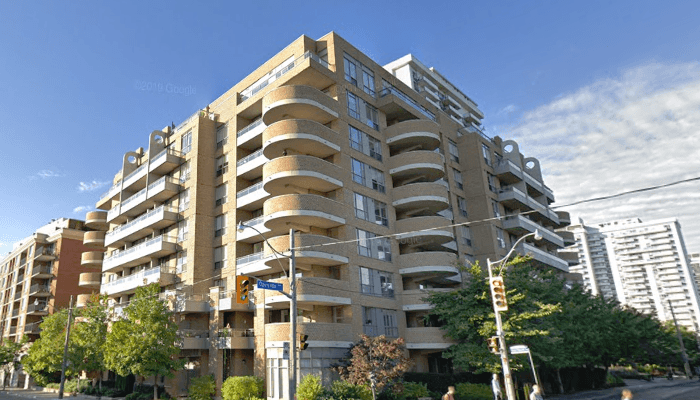 The Hill Condominiums in the Upper Village is located at 170 Chiltern Hill Rd, near the intersection of Bathurst St and Eglinton Ave W. This condo was built in 2018 and has suites ranging from 402 to 3519 square feet. Amenities include a Concierge/Security Guard, Party Room, BBQs, Guest Suites and Media Room/Cinema. 530 St Clair West is located near the intersection of St Clair W and Bathurst. This condo was built in 2013 and has suites ranging from 576 to 1327 square feet. Amenities include a Gym/Exercise Room, Pool, Concierge, Party Room, Business Centre, Media Room/Cinema, Meeting/Function Room, Outdoor Patio/Garden, Games/Recreation Room, Sauna, Spa and Visitor Lounge. Allure is located at 23 Glebe Rd W, near the intersection of Yonge and Eglinton. This condo was built in 2015 and has suites ranging from 467 to 2628 square feet. Amenities include a Gym/Exercise Room, Common Rooftop Deck, Concierge/Security Guard, Party Room, Parking Garage, Media Room/Cinema, Outdoor Patio/Garden, Games/Recreation Room and Visitor Lounge. Neon Condos is located at 58 Orchard View Blvd, near the intersection of Yonge and Eglinton. This condo was built in 2016 and has suites ranging from 310 to 1261 square feet. Amenities include a Gym/Exercise Room, Common Rooftop Deck, Concierge/Security Guard, Party Room, BBQs, Media Room/Cinema, Yoga Studio and FibreStream Internet. The Berwick is located at 60 Berwick Ave, near the intersection of Yonge and Eglinton. This condo was built in 2015 and has suites ranging from 478 to 2773 square feet. Amenities include a Gym/Exercise Room, Concierge/Security Guard, Party Room, Parking Garage, BBQs, Guest Suites, Media Room/Cinema, Meeting/Function Room, Outdoor Patio/Garden, Games/Recreation Room, Sauna and Visitor Lounge. Scenic on Eglinton II is located at 36 Brian Peck Cres, near the intersection of Leslie and Eglinton. This condo was built in 2013 and has suites ranging from 804 to 1260 square feet. Amenities include a Gym/Exercise Room, Pool, Concierge/Security Guard, Party Room, Outdoor Child Play Area, Games/Recreation Room, Sauna and FibreStream Internet. 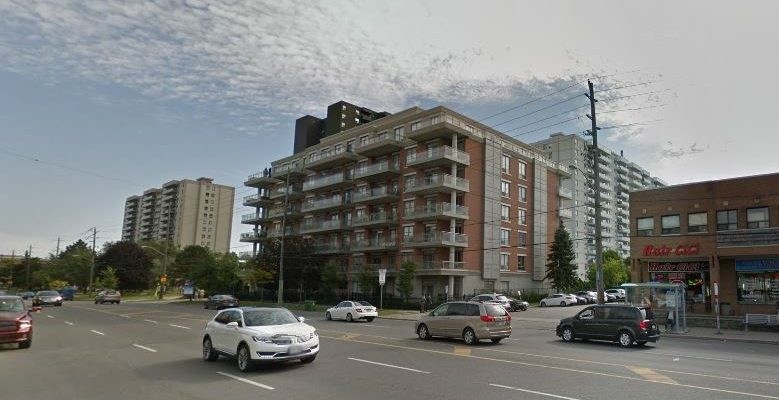 Scenic on Eglinton III is located at 160 Vanderhoof Ave, near the intersection of Leslie and Eglinton. This condo was built in 2017 and has suites ranging from 425 to 1528 square feet. Amenities include a Gym/Exercise Room, Party Room, Pool, Concierge/Security Guard, Guest Suites, Indoor Child Play Area, Media Room/Cinema, Outdoor Patio/Garden, Games/Recreation Room and Sauna. Scenic on Eglinton is located at 35 Brian Peck Cres, near the intersection of Leslie and Eglinton. This condo was built in 2014 and has suites ranging from 523 to 1417 square feet. Amenities include a Gym/Exercise Room, Pool, Common Rooftop Deck, Concierge/Security Guard, Party Room, Guest Suites, Indoor Child Play Area, Media Room/Cinema, Meeting/Function Room, Parking Garage, Games/Recreation Room, Sauna and FibreStream Internet. 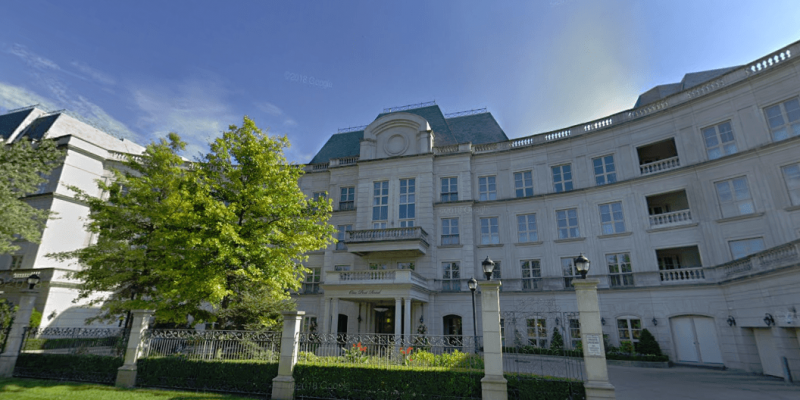 Argento is located at 18 Graydon Hall Dr, near the intersection of Don Mills and York Mills. This condo was built in 2018 and has suites ranging from 551 to 1553 square feet. Amenities include a Gym/Exercise Room, Concierge/Security Guard, Party Room, BBQs, Media Room/Cinema and Sauna. 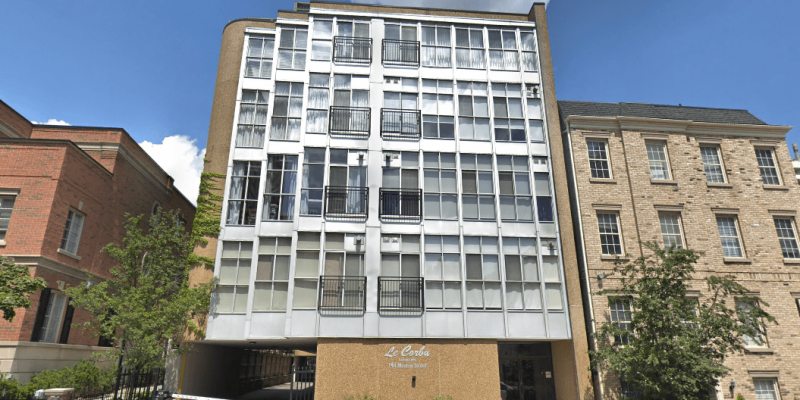 Le Corbu is located at 194 Merton St, near the intersection of Davisville and Mt Pleasant. This condo was built in 2003 and has suites ranging from 703 to 1343 square feet. Amenities include a Gym/Exercise Room, Common Rooftop Deck and Squash/Racquet Court. 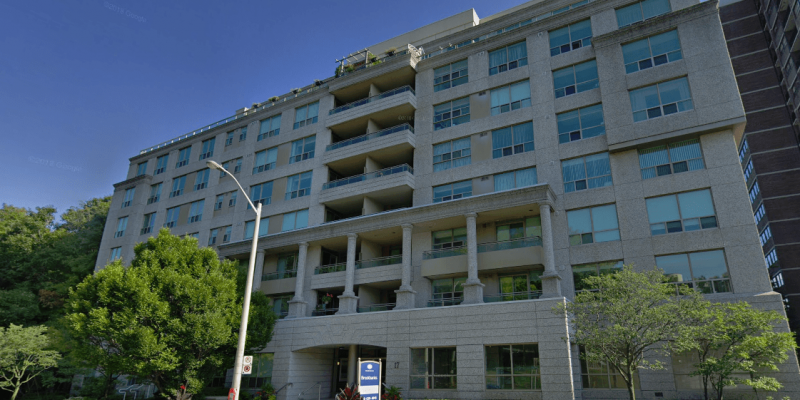 Greenwich Terrace is located at 111 Merton St, near the intersection of Yonge and Davisville. This condo was built in 1996 and has suites ranging from 415 to 1187 square feet. Amenities include a Gym/Exercise Room, Common Rooftop Deck, Party Room, Meeting/Function Room and Parking Garage. 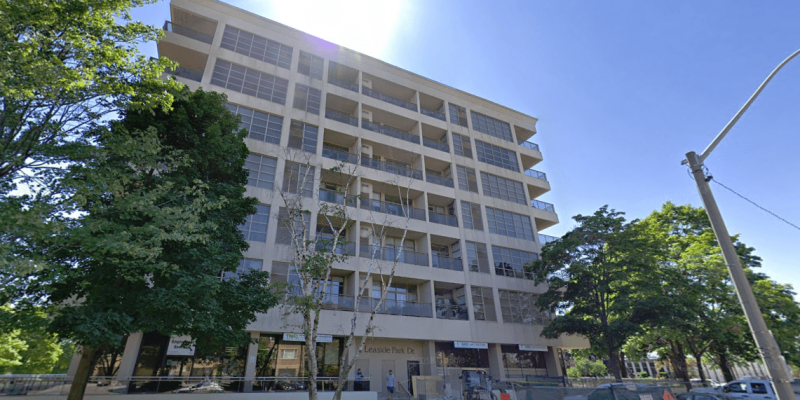 The Hampton Condos is located at 260 Merton St, near the intersection of Davisville and Mt Pleasant. This condo was built in 1999 and has suites ranging from 718 to 901 square feet. Amenities include a Common Rooftop Deck and Party Room. Redpath Residences is located at 188 Redpath Ave, near the intersection of Eglinton and Mt Pleasant. This condo was built in 2000 and has suites ranging from 545 to 1323 square feet. Amenities include a Party Room, Meeting/Function Room and Parking Garage. SoHo Lofts is located at 188 Eglinton Ave E, near the intersection of Eglinton and Mt Pleasant. This condo was built in 1999 and has suites ranging from 600 to 1158 square feet. 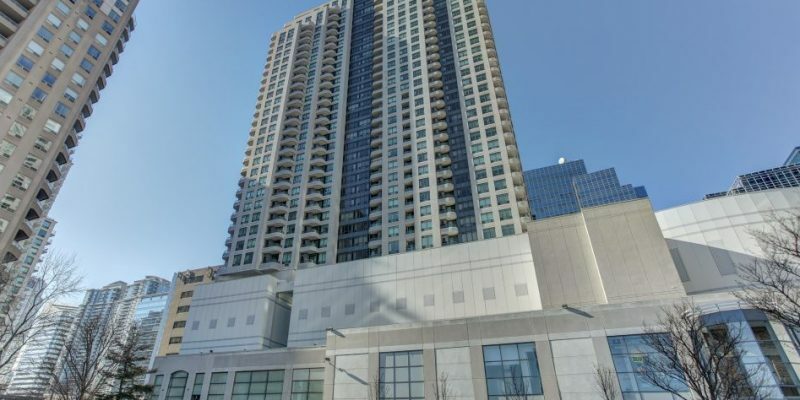 Amenities include a Gym/Exercise Room, Common Rooftop Deck, Party Room, Meeting/Function Room, Parking Garage, Sauna and Concierge/Security Guard. Chateau Royal is located at 650 Mount Pleasant Rd, near the intersection of Eglinton and Mt Pleasant. This condo was built in 2009 and has suites ranging from 626 to 2628 square feet. Amenities include a Gym/Exercise Room, Common Rooftop Deck, Concierge/Security Guard, Party Room, Guest Suites, Media Room/Cinema, Meeting/Function Room and Parking Garage. 10 Prue Ave is located near the intersection of Bathurst and Glencairn. This condo was built in 1980 and has suites ranging from 1492 to 2518 square feet. Amenities include a Parking Garage and Sauna. 35 Saranac Blvd is located near the intersection of Bathurst and Lawrence. This condo was built in 2014 and has suites ranging from 441 to 1082 square feet. Amenities include a Gym/Exercise Room, Common Rooftop Deck, Party Room, Meeting/Function Room, Games/Recreation Room and FibreStream Internet. 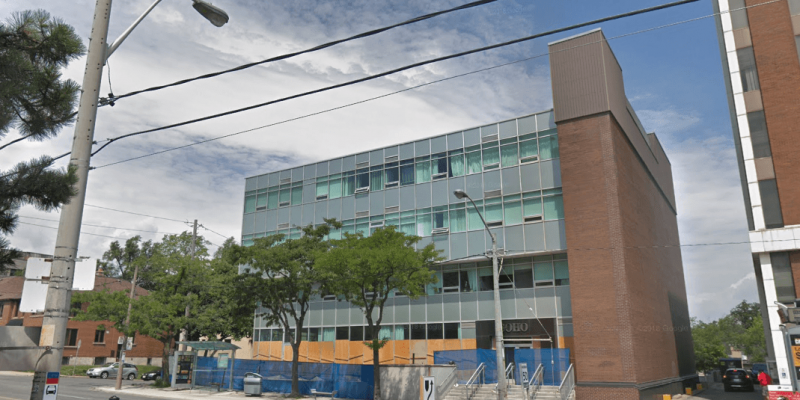 The Shermount is located at 650 Lawrence Ave W, near the intersection of Dufferin and Lawrence. This condo was built in 2003 and has suites ranging from 402 to 1463 square feet. 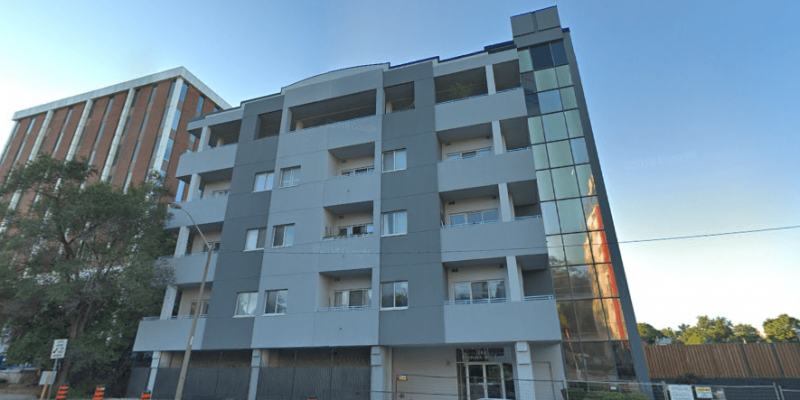 Amenities include a Concierge/Security Guard, Party Room, Meeting/Function Room, Parking Garage, Games/Recreation Room and FibreStream Internet. 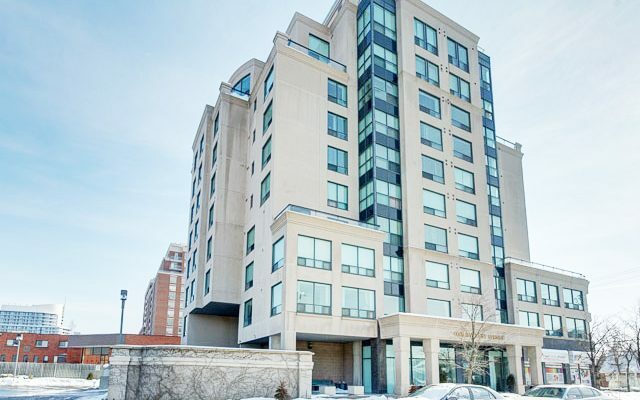 The Rio II is located at 225 Merton St, near the intersection of Mt Pleasant and Davisville. This condo was built in 2003 and has suites ranging from 406 to 1422 square feet. Amenities include a Gym/Exercise Room, Concierge/Security Guard, Party Room, Meeting/Function Room, Parking Garage and Sauna. 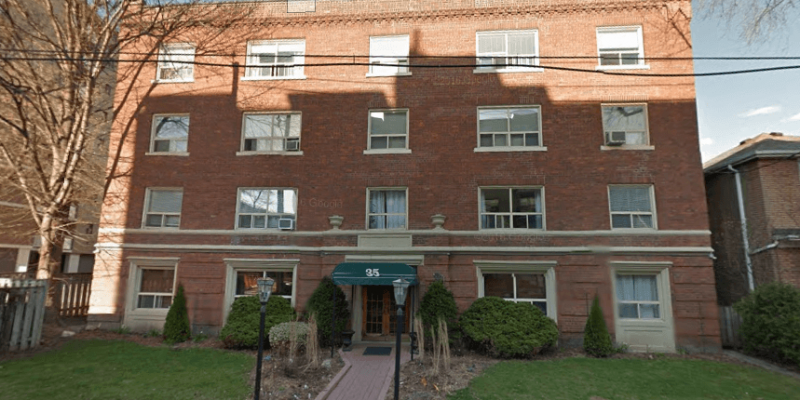 The Rio III is located at 197 Merton St, near the intersection of Mt Pleasant and Davisville. This condo was built in 2004 and has suites ranging from 400 to 1596 square feet. Amenities include a Gym/Exercise Room, Concierge/Security Guard, Party Room, Meeting/Funtion Room, Parking Garage and Sauna. 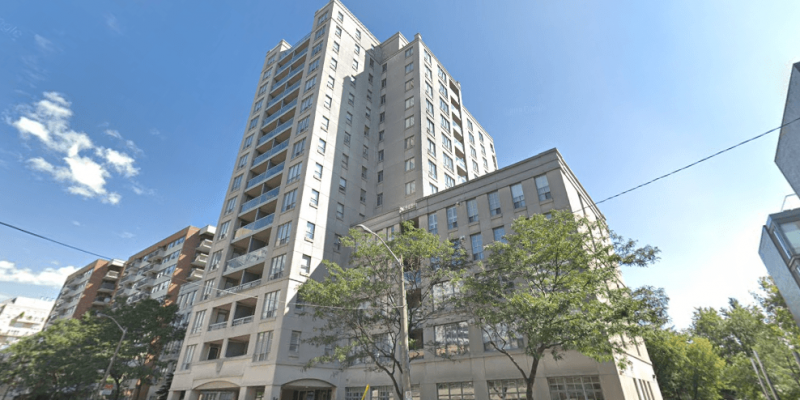 Life Condos is located at 68 Merton St, near the intersection of Yonge and Davisville. This condo was built in 2016 and has suites ranging from 481 to 2415 square feet. Amenities include a Gym/Exercise Room, Concierge/Security Guard, Party Room, BBQs, Guest Suites, Meeting/Function Room and Games/Recreation Room. MYC is located at 1815 Yonge St, near the intersection of Yonge and Davisville. This condo was built in 2014 and has suites ranging from 518 to 2016 square feet. Amenities include a Gym/Exercise Room, Common Rooftop Deck, Concierge/Security Guard, Party Room, BBQs, Guest Suites, Media Room/Cinema, Meeting/Function Room, Parking Garage, Visitor Lounge and FibreStream Internet. 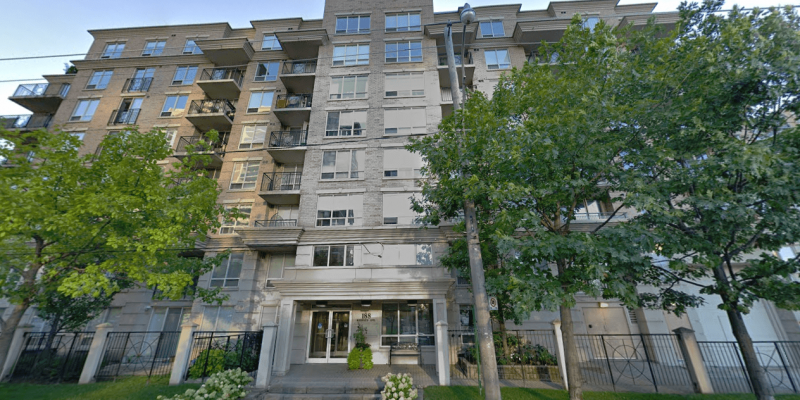 Minto 30 Roehampton is located at 30 Roehampton Ave, near the intersection of Yonge and Eglinton. This condo was built in 2016 and has suites ranging from 503 to 920 square feet. Amenities include a Gym/Exercise Room, Common Rooftop Deck, Concierge/Security Guard, Party Room, BBQs, Guest Suites, Media Room/Cinema, Meeting/Function Room, Games/Recreation Room and Sauna. 155 Redpath is located at 185 Roehampton Ave, near the intersection of Eglinton and Mt Pleasant. This condo was built in 2018 and has suites ranging from 330 to 1403 square feet. Amenities include a Gym/Exercise Room, Pool, Common Rooftop Deck, Concierge/Security Guard, Outdoor Patio/Garden and Sauna. The Bungalows at Kilgour Estates is located at 11 Burkebrook Pl, near the intersection of Bayview and Eglinton. This condo was built in 2010 and has suites ranging from to square feet. Amenities include a Gym/Exercise Room, Pool, Concierge/Security Guard, Party Room, BBQs, Meeting/Function Room and Sauna. 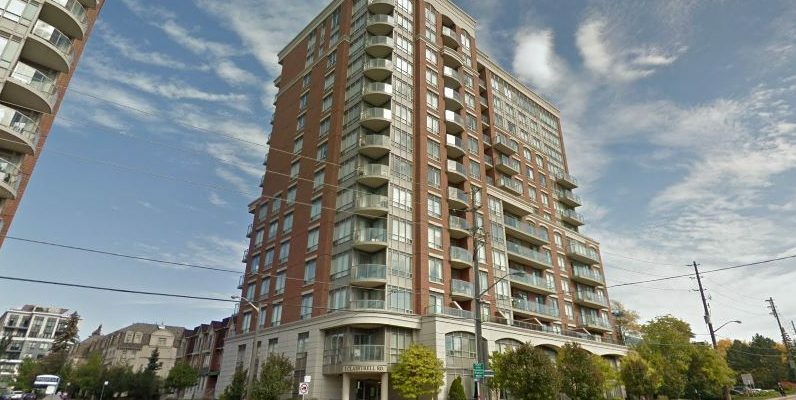 The Chedington is located at 1 Chedington Pl, near the intersection of Bayview and Lawrence. This condo was built in 1995 and has suites ranging from 914 to 4740 square feet. Amenities include a Gym/Exercise Room, Pool, Concierge/Security Guard, Parking Garage and Sauna. 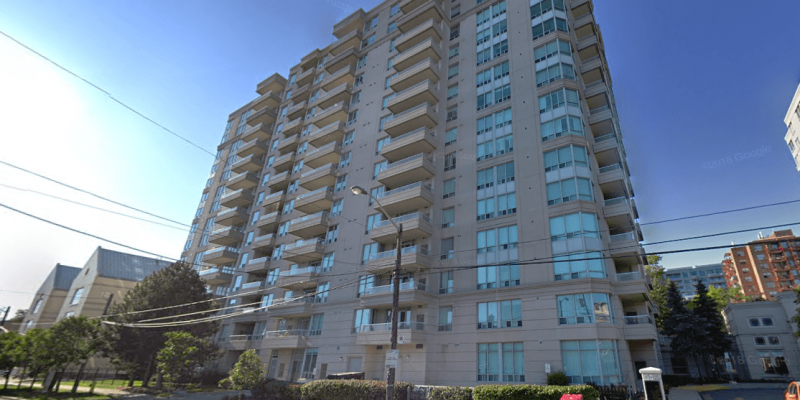 Sherwood at Huntington is located at 1900 Bayview Ave, near the intersection of Bayview and Eglinton. 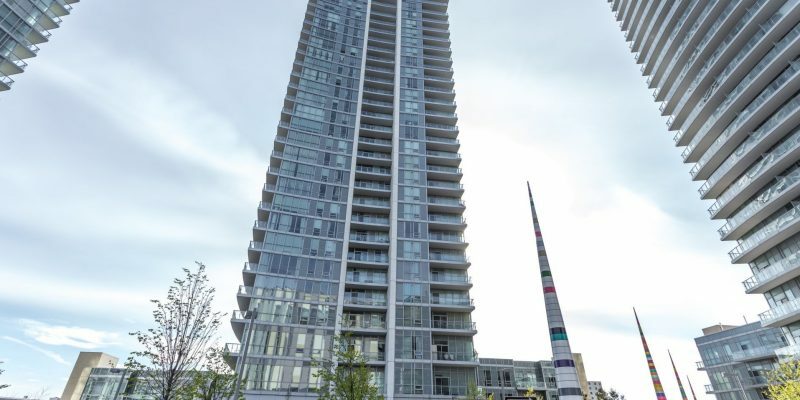 This condo was built in 2018 and has suites ranging from 870 to 3421 square feet. Amenities include a Gym/Exercise Room, Pool, Common Rooftop Deck, Concierge/Security Guard, Party Room, BBQs, Car Wash, Guest Suites, Hot Tub/Jacuzzi, Media Room/Cinema, Meeting/Function Room, Outdoor Patio/Garden, Parking Garage, Sauna and Yoga Studio. Governor’s Hill II is located at 3600 Yonge St, near the intersection of Yonge and Wilson. This condo was built in 2000 and has suites ranging from 1087 to 5376 square feet. Amenities include a Gym/Exercise Room, Pool, Concierge/Security Guard, Guest Suites, Parking Garage and Sauna. 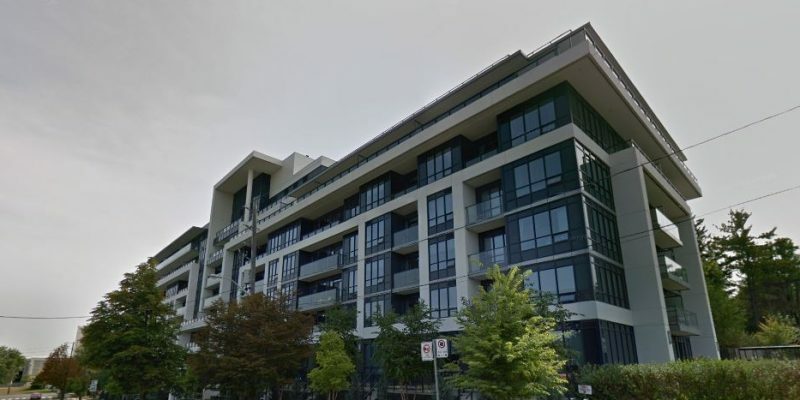 Brookdale on Avenue Road is located at 1700 Avenue Rd, near the intersection of Avenue Rd and Lawrence Ave W. This condo was built in 2018 and has suites ranging from 613 to 2602 square feet. Amenities include a Gym/Exercise Room, Concierge/Security Guard, Party Room, BBQs and Outdoor Patio/Garden. 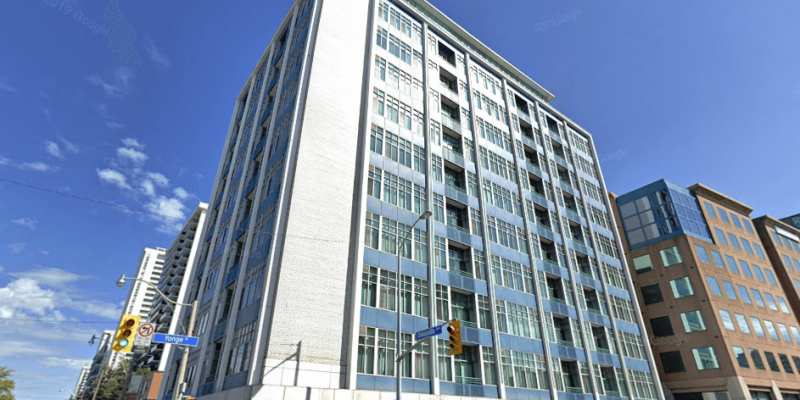 Soho Bayview Lofts is located at 562 Eglinton Ave E, near the intersection of Bayview and Eglinton. This condo was built in 2003 and has suites ranging from 453 to 1171 square feet. Amenities include a Gym/Exercise Room, Party Room, Parking Garage, Buisness Centre and Meeting/Function Room. La Costa is located at 600 Eglinton Ave E, near the intersection of Bayview and Eglinton. This condo was built in 1996 and has suites ranging from 583 to 987 square feet. Amenities include a Gym/Exercise Room, Party Room, Meeting/Function Room and Parking Garage. 928 Millwood Rd is located near the intersection of Bayview and Eglinton. This condo was built in 1989 and has suites ranging from 674 to 1124 square feet. Amenities include a Common Rooftop Deck, Party Room, Parking Garage and Meeting/Function Room. Bayview Walk is located at 1818 Bayview Ave, near the intersection of Bayview and Eglinton. This condo was built in 1992 and has suites ranging from 850 to 2392 square feet. Amenities include a Gym/Exercise Room, Common Rooftop Deck, Concierge, Party Room, Meeting/Function Room, Outdoor Patio/Garden, Parking Garage and Sauna. The Upper House is located at 25 Malcolm Rd, near the intersection of Bayview and Eglinton. This condo was built in 2018 and has suites ranging from 439 to 1509 square feet. Amenities include a Gym/Exercise Room, Common Rooftop Deck, Concierge/Security Guard, Party Room, BBQs, Guest Suites, and Meeting/Function Room. 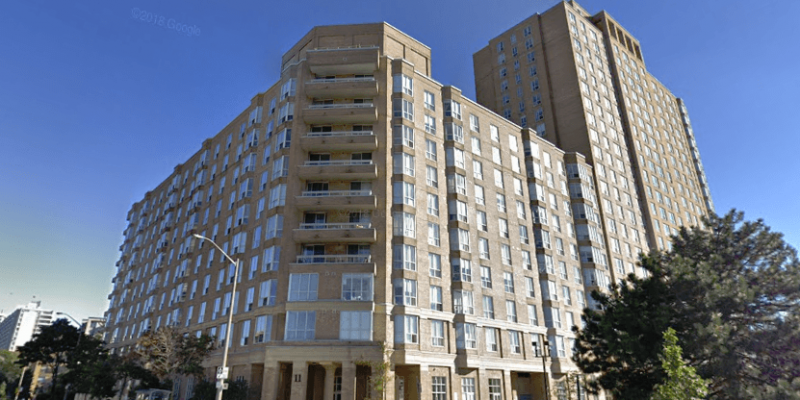 The Lawrence Park Condominiums is located at 2727 Yonge St, near the intersection of Yonge and Lawrence. This condo was built in 1997 and has suites ranging from 803 to 2656 square feet. Amenities include a Gym/Exercise Room, Pool, Common Rooftop Deck, Concierge/Security Guard, Party Room, Meeting/Function Room, Parking Garage and Sauna. 70 Elmsthorpe Ave is located near the intersection of Avenue and Eglinton. 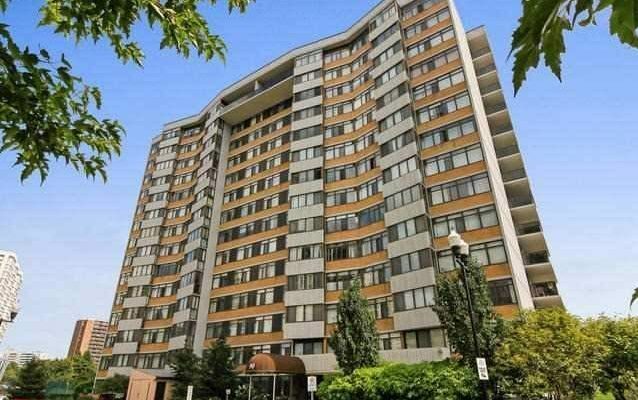 This condo was built in 1989 and has suites ranging from 1267 to 1781 square feet. Amenities include a Gym/Exercise Room, Parking Garage, Sauna, Concierge/Security Guard and Tennis Court. 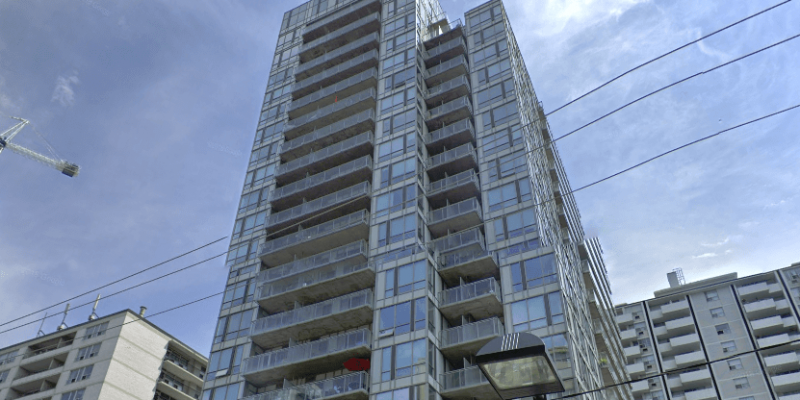 425 Walmer Road Condos is located near the intersection of St Clair and Spadina. This condo was built in 1986 and has suites ranging from 1654 to 3212 square feet. Amenities include a Gym/Exercise Room, Concierge/Security Guard and Parking Garage. St Regis is located at 800 Spadina Rd, near the intersection of Spadina and Eglinton. This condo was built in 1999 and has suites ranging from 730 to 2230 square feet. Amenities include a Gym/Exercise Room, Common Rooftop Deck and Parking Garage. 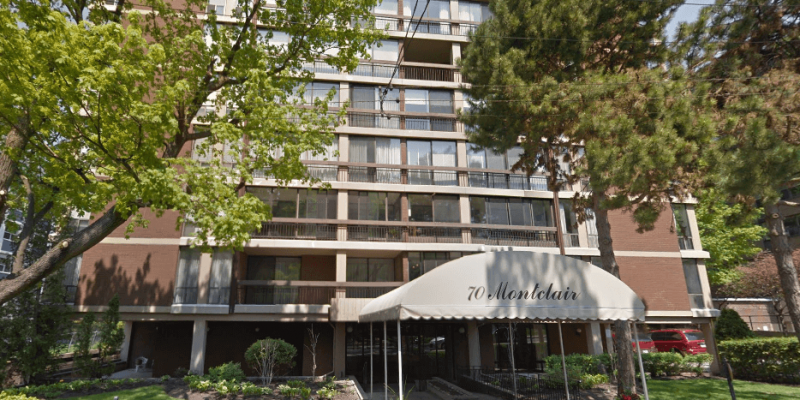 447 Walmer Road Condos is located near the intersection of Spadina Rd and St Clair Ave W. This condo was built in 1983 and has suites ranging from 949 to 1688 square feet. Amenities include a Gym/Exercise Room, Pool, Parking Garage, Sauna and Concierge/Security Guard. Village Gate is located at 18 Lower Village Gate, near the intersection of St Clair and Spadina. 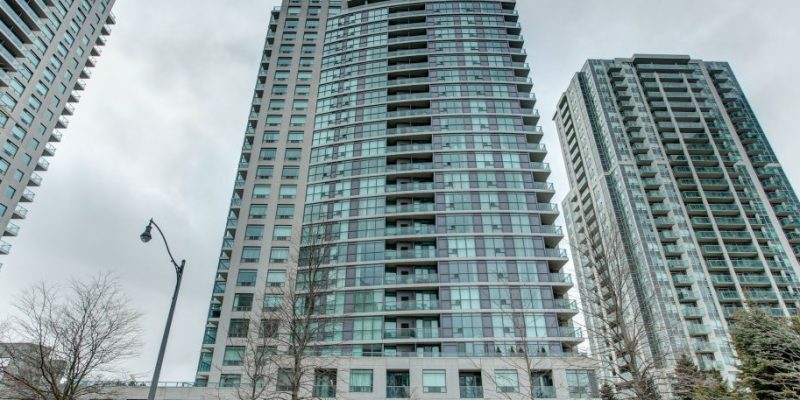 This condo was built in 1988 and has suites ranging from 1048 to 2019 square feet. Amenities include a Gym/Exercise Room, Pool, Parking Garage, Sauna and Concierge/Security Guard. Village Gate II is located at 19 Lower Village Gate, near the intersection of St Clair and Spadina. 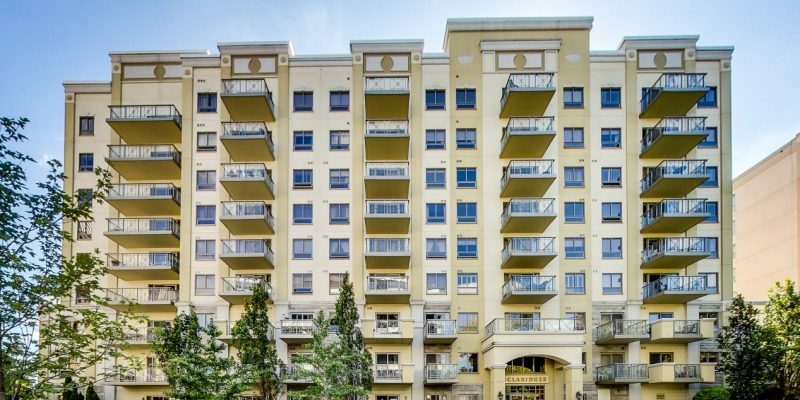 This condo was built in 1988 and has suites ranging from 1048 to 2017 square feet. Amenities include a Gym/Exercise Room, Pool, Parking Garage, Sauna and Concierge/Security Guard. One Post Road is located at 1 Post Rd, near the intersection of Bayview and Lawrence. This condo was built in 2001 and has suites ranging from 1515 to 4435 square feet. Amenities include a Gym/Exercise Room, Parking Garage, Concierge/Security Guard, Pool and Sauna. 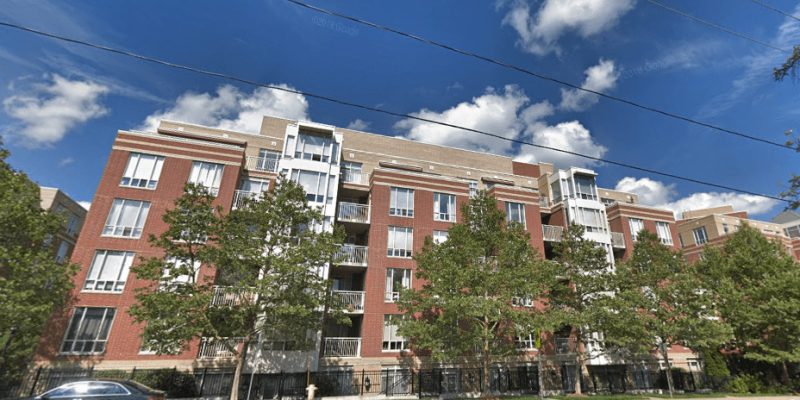 The Courtyards of Upper Forest Hill is located at 2603 Bathurst St, near the intersection of Bathurst St and Eglinton Ave W. This condo was built in 2018 and has suites ranging from 818 to 1302 square feet. Amenities include a Gym/Exercise Room, Party Room, BBQs, Guest Suites, Media Room/Cinema and Outdoor Patio/Garden. 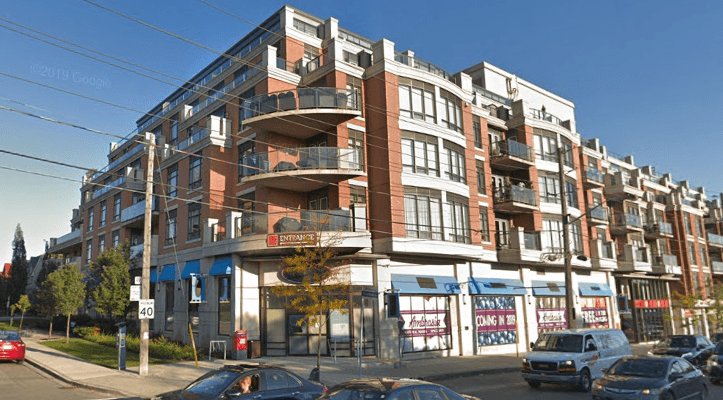 Academy Arms is located at 22 Shallmar Blvd, near the intersection of Bathurst St and Eglinton Ave W. This condo was built in 2006 and has suites ranging from 495 to 1917 square feet. Amenities include a Pool, Parking Garage and Sauna. 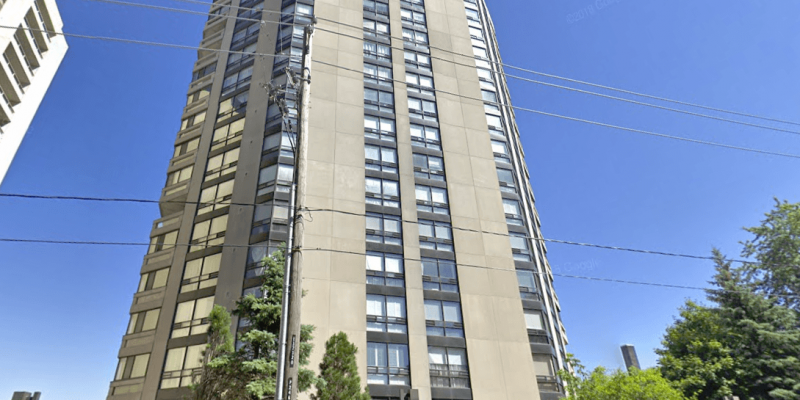 Victoria Town is located at 20 Sunrise Ave, near the intersection of Victoria Park Ave and Eglinton Ave E. This condo was built in 1977 and has suites ranging from 800 to 3013 square feet. Amenities include a Pool, Party Room, Parking Garage, Meeting/Function Room, Games/Recreation Room, Sauna and Tennis Court. 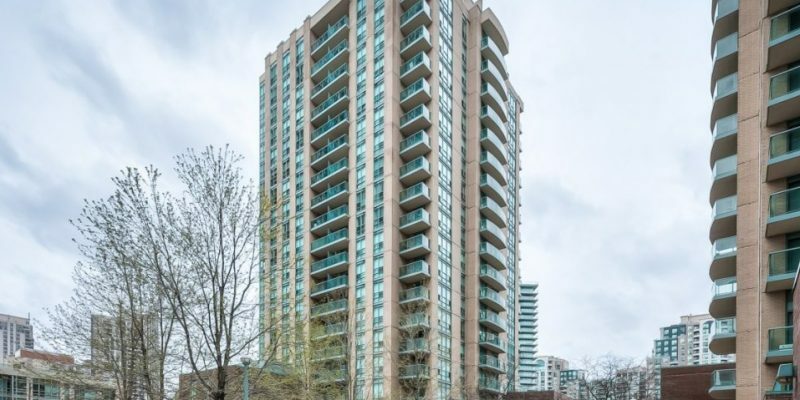 Victoria Town is located at 10 Sunrise Ave, near the intersection of Victoria Park Ave and Eglinton Ave E. This condo was built in 1977 and has suites ranging from 800 to 3013 square feet. Amenities include a Pool, Party Room, Parking Garage, Meeting/Function Room, Games/Recreation Room, Sauna and Tennis Court. 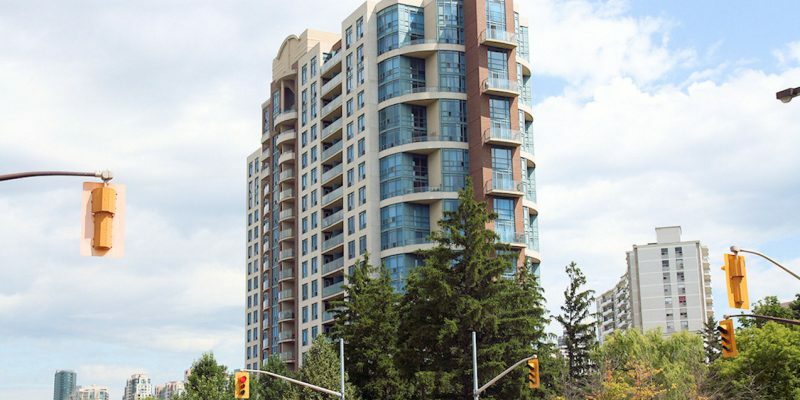 The Rosewood is located at 135 Wynford Dr, near the intersection of DVP and Eglinton. This condo was built in 2010 and has suites ranging from 611 to 2549 square feet. Amenities include a Gym/Exercise Room, Parking Garage, Concierge/Security Guard, Guest Suites, Party Room and Meeting/Function Room. 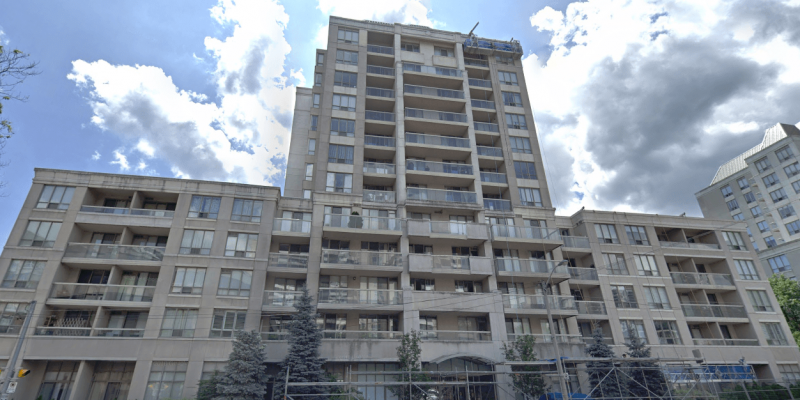 Highgate is located at 3 Concorde Pl, near the intersection of DVP and Eglinton. This condo was built in 1984 and has suites ranging from 1006 to 2196 square feet. Amenities include a Gym/Exercise Room, Parking Garage, Concierge/Security Guard, Pool, Sauna and Tennis Court. 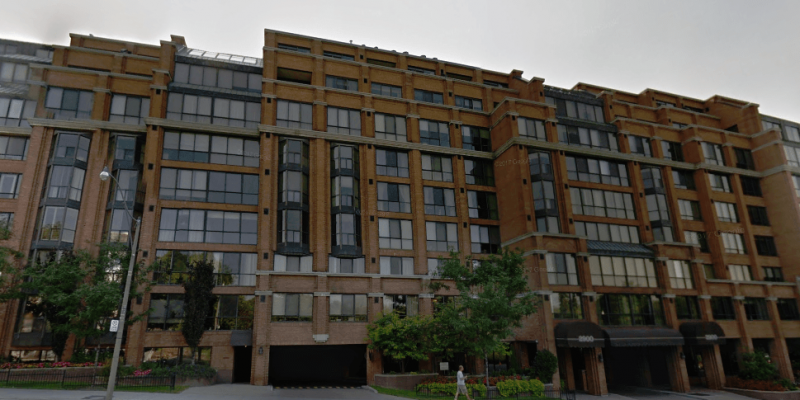 Highgate is located at 1 Concorde Pl, near the intersection of DVP and Eglinton. This condo was built in 1984 and has suites ranging from 1006 to 2196 square feet. Amenities include a Gym/Exercise Room, Parking Garage, Concierge/Security Guard, Pool, Sauna and Tennis Court. 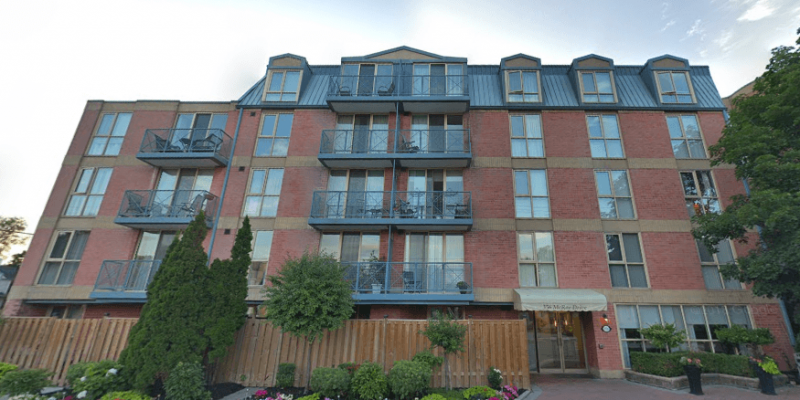 Village Mews is located at 255 The Donway W, near the intersection of Lawrence Ave E and Don Mills Rd. This condo was built in 1985 and has suites ranging from 598 to 1890 square feet. Amenities include a Party Room, Parking Garage, Car Wash, Meeting/Function Room, Games/Recreation Room and Visitor Lounge. 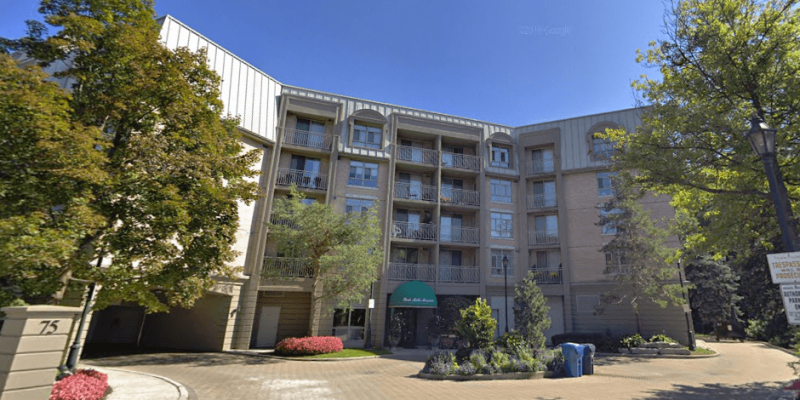 Village Mews is located at 245 The Donway W, near the intersection of Lawrence Ave E and Don Mills Rd. This condo was built in 1985 and has suites ranging from 598 to 1890 square feet. Amenities include a Party Room, Parking Garage, Car Wash, Meeting/Function Room, Games/Recreation Room and Visitor Lounge. Reflections Residences at Don Mills is located at 85 The Donway W, near the intersection of Don Mills Rd and Lawrence Ave E. This condo was built in 2014 and has suites ranging from 594 to 1806 square feet. Amenities include a Gym/Exercise Room, Common Rooftop Deck, Concierge/Security Guard, Party Room, Parking Garage, Meeting/Function Room, Sauna and Visitor Lounge. 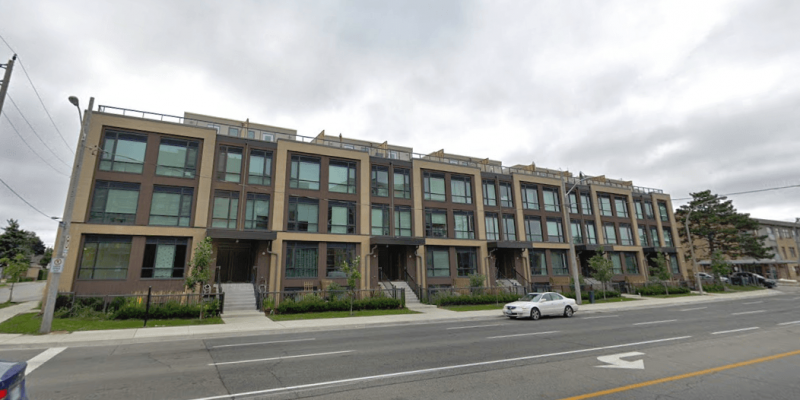 Liv Lofts is located at 75 The Donway W, near the intersection of Don Mills Rd and Lawrence Ave E. This condo was built in 2015 and has suites ranging from 394 to 1325 square feet. Amenities include a Gym/Exercise Room, Common Rooftop Deck, Concierge/Security Guard, Party Room, Parking Garage, BBQs, Bicycle Parking, Guest Suites, Hot Tub/Jacuzzi, Media Room/Cinema, Meeting/Function Room, Outdoor Patio/Garden, Games/Recreation Room and Visitor Lounge. 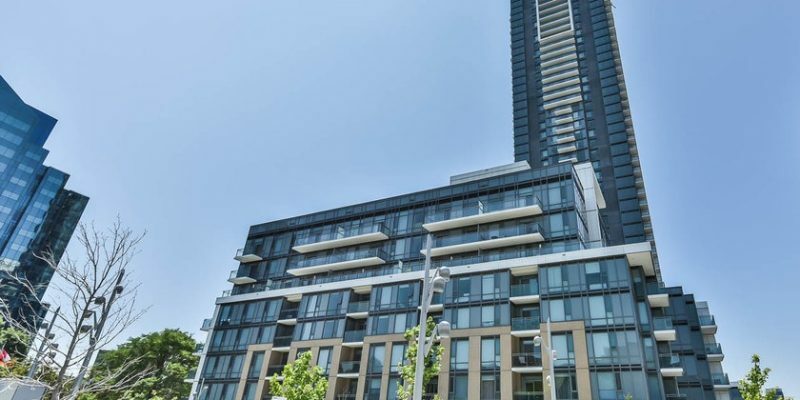 Flaire Condos is located at 99 The Donway W, near the intersection of Don Mills Rd and Lawrence Ave E. This condo was built in 2017 and has suites ranging from 452 to 1337 square feet. Amenities include a Gym/Exercise Room, Common Rooftop Deck, Concierge/Security Guard, Party Room, Media Room/Cinema, Meeting/Function Room and Parking Garage. 1360 York Mills Rd is located at 1360 York Mills Rd, near the intersection of York Mills Rd and Victoria Park Ave. This condo was built in 1972 and has suites ranging from 619 to 845 square feet. Amenities include a Gym/Exercise Room, Pool, Parking Garage and Sauna. 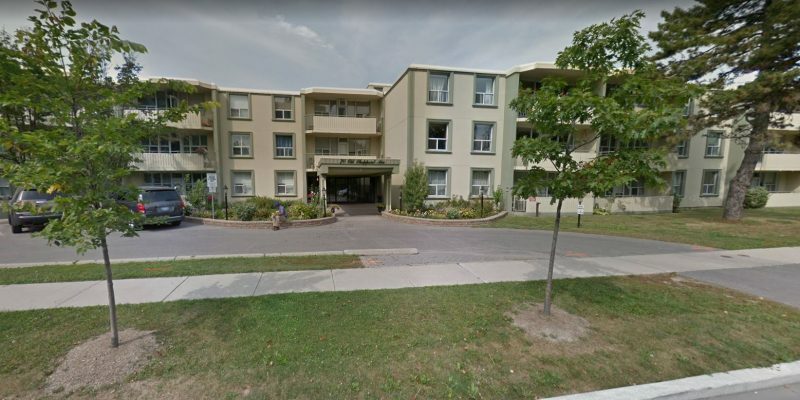 Wynford Place is located at 75 Wynford Heights Cres, near the intersection of Don Mills Rd and Eglinton Ave E. This condo was built in 1982 and has suites ranging from 1125 to 1823 square feet. Amenities include a Gym/Exercise Room, Pool, Concierge/Security Guard, Party Room, Meeting/Function Room, Parking Garage, Sauna and Tennis Court. Windfield Terrace is located at 1210 Don Mills Rd, near the intersection of Lawrence Ave E and Don Mills Rd. This condo was built in 1989 and has suites ranging from 530 to 1701 square feet. Amenities include a Gym/Exercise Room, Pool, Concierge/Security Guard, Parking Garage, Sauna and Squash Racquet Court. 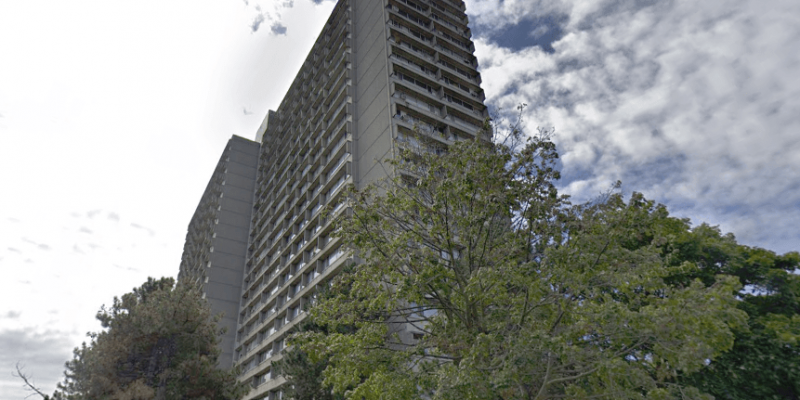 Windfield Terrace II is located at 1200 Don Mills Rd, near the intersection of Lawrence Ave E and Don Mills Rd. This condo was built in 1990 and has suites ranging from 751 to 2626 square feet. Amenities include a Gym/Exercise Room, Pool, Concierge/Security Guard, Parking Garage, Sauna and Squash Racquet Court. 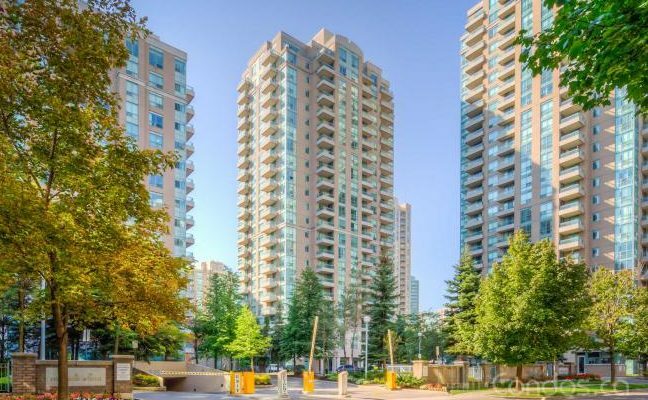 Paradise at The Oasis is located at 1720 Eglinton Ave E, near the intersection of Victoria Park Ave and Eglinton Ave E. This condo was built in 2003 and has suites ranging from 618 to 1134 square feet. Amenities include a Gym/Exercise Room, Pool, Concierge/Security Guard, Party Room, Guest Suites, Meeting/Function Room, Parking Garage, Sauna and Tennis Court. 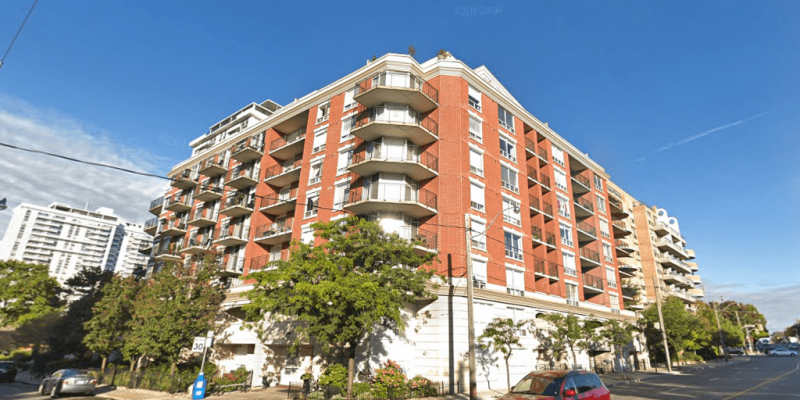 Oasis is located at 1700 Eglinton Ave E, near the intersection of Victoria Park Ave and Eglinton Ave E. This condo was built in 2000 and has suites ranging from 580 to 1261 square feet. Amenities include a Gym/Exercise Room, Pool, Concierge/Security Guard, Parking Garage, Sauna and Tennis Court. 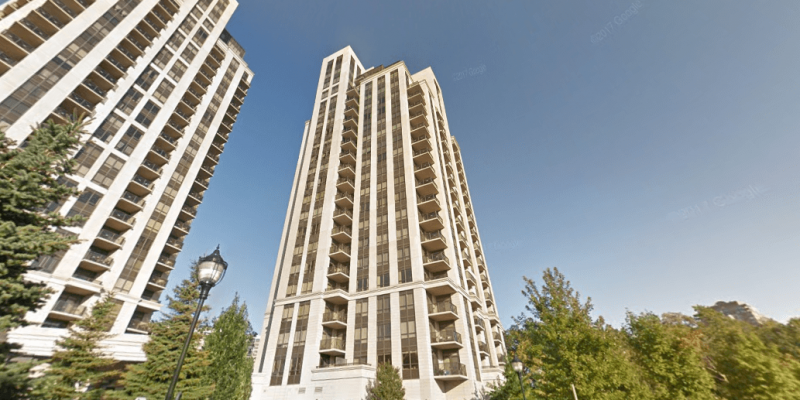 Oasis – Soleil is located at 1730 Eglinton Ave E, near the intersection of Victoria Park Ave and Eglinton Ave E. This condo was built in 2005 and has suites ranging from 636 to 1075 square feet. Amenities include a Gym/Exercise Room, Pool, Concierge/Security Guard, Party Room, Guest Suites, Meeting/Function Room, Parking Garage and Sauna. 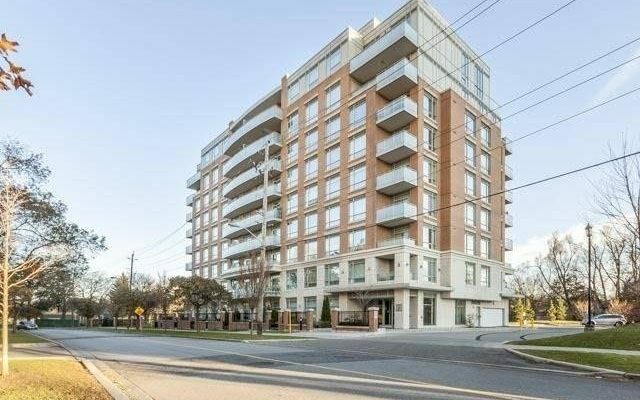 45 Sunrise Ave is located near the intersection of Victoria Park Ave and Eglinton Ave E. This condo was built in 1980 and has suites ranging from 969 to 970 square feet. Amenities include a Gym/Exercise Room, Pool, Parking Garage, Sauna and Tennis Court. 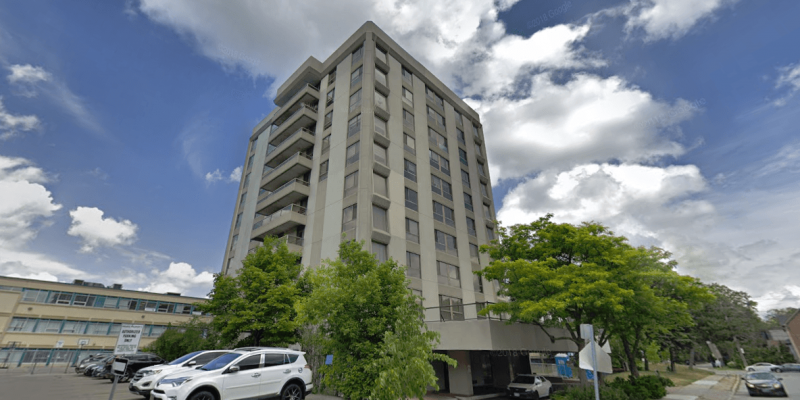 40 Sunrise Ave is located near the intersection of Victoria Park Ave and Eglinton Ave E. This condo was built in 1977 and has suites ranging from 812 to 1218 square feet. Amenities include a Gym/Exercise Room, Pool, Parking Garage, Sauna and Tennis Court. 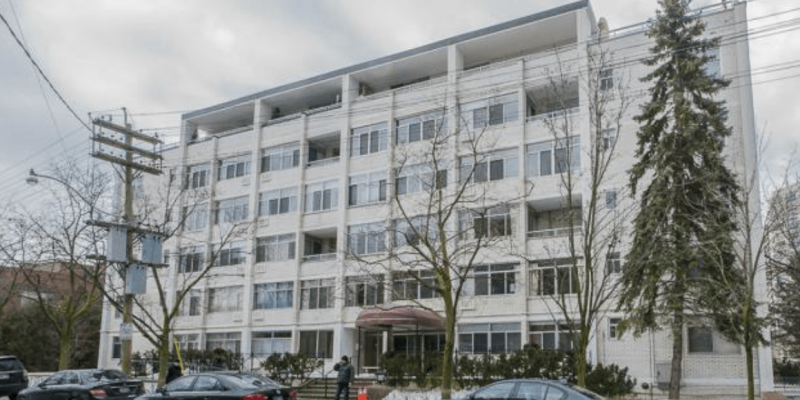 30 Sunrise Ave is located near the intersection of Victoria Park Ave and Eglinton Ave E. This condo was built in 1977 and has suites ranging from 812 to 1218 square feet. Amenities include a Gym/Exercise Room, Pool, Parking Garage, Sauna and Tennis Court. 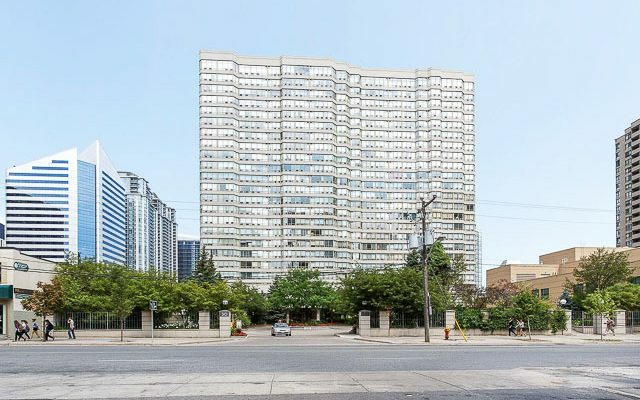 Concordia is located at 25 Sunrise Ave, near the intersection of Victoria Park Ave and Eglinton Ave E. This condo was built in 1978 and has suites ranging from 958 to 970 square feet. Amenities include a Gym/Exercise Room, Pool, Parking Garage, Sauna and Concierge/Security Guard. 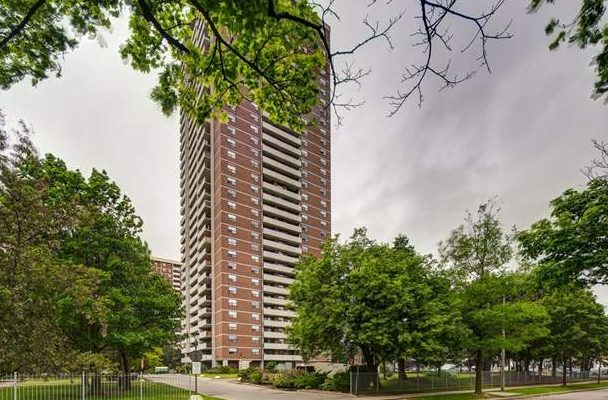 1815 O’Connor Dr is located near the intersection of Victoria Park Ave and Eglinton Ave E. This condo was built in 1977 and has suites ranging from 756 to 1163 square feet. Amenities include a Gym/Exercise Room, Pool, Parking Garage, Sauna and Tennis Court. 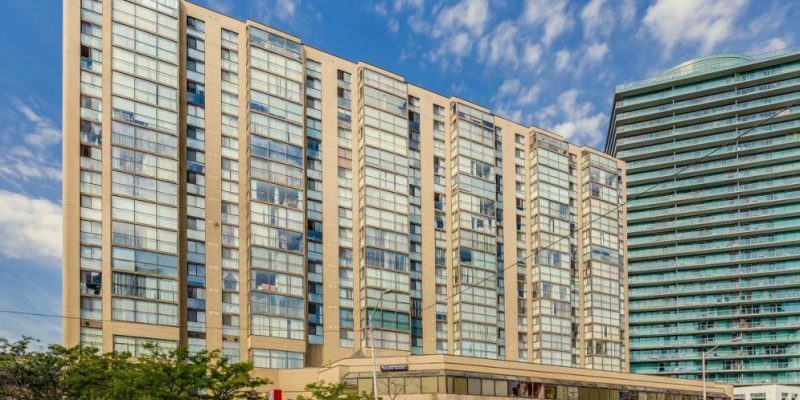 1801 O’Connor Dr is located near the intersection of Victoria Park Ave and Eglinton Ave E. This condo was built in 1977 and has suites ranging from 756 to 1163 square feet. Amenities include a Gym/Exercise Room, Pool, Parking Garage, Sauna and Tennis Court. 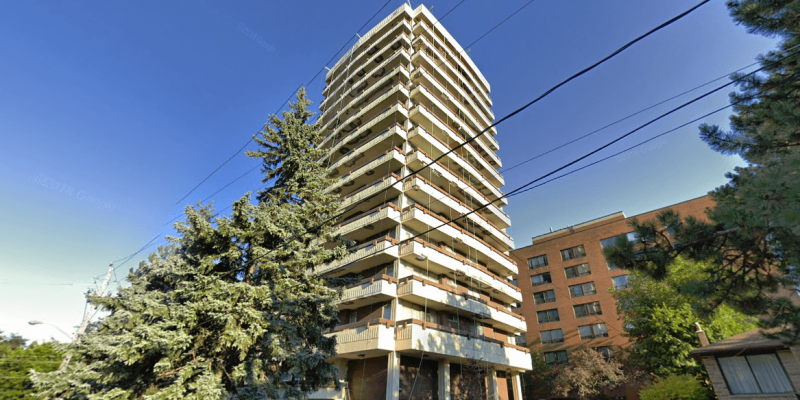 1690 Victoria Park Ave is located near the intersection of Victoria Park Ave and Eglinton Ave E. This condo was built in 1973 and has suites ranging from to square feet. Amenities include a Gym/Exercise Room, Party Room, Parking Garage, BBQs and Meeting/Function Room. The Tapestry is located at 215 The Donway W, near the intersection of Lawrence Ave E and Don Mills Rd. This condo was built in 1991 and has suites ranging from 523 to 2099 square feet. Amenities include a Gym/Exercise Room, Pool, Parking Garage, Sauna and Concierge/Security Guard. The Edwardian is located at 801 Lawrence Ave E, near the intersection of Lawrence and Leslie. This condo was built in 1997 and has suites ranging from 981 to 2965 square feet. Amenities include a Gym/Exercise Room and Parking Garage. Savoy at Camelot is located at 16 Dallimore Circ, near the intersection of DVP and Eglinton. This condo was built in 2005 and has suites ranging from 441 to 2130 square feet. Amenities include a Gym/Exercise Room, Concierge/Security Guard, Party Room, Parking Garage, Guest Suites, Meeting/Function Room and Sauna. Red Hot Condos is located at 120 Dallimore Circ, near the intersection of DVP and Eglinton. This condo was built in 2010 and has suites ranging from 450 to 760 square feet. Amenities include a Gym/Exercise Room, Pool, Concierge/Security Guard, Party Room, Parking Garage, BBQs, Guest Suites, Media Room/Cinema, Meeting/Function Room, Sauna and FibreStream Internet. 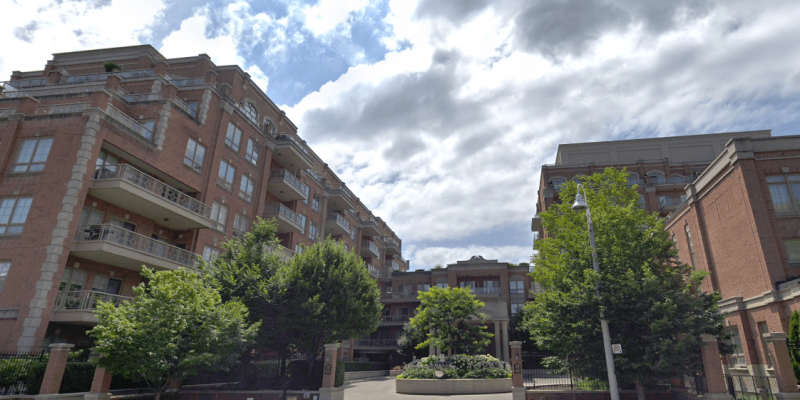 Courtyards of Concorde is located at 18 Concorde Pl, near the intersection of DVP and Eglinton. This condo was built in 1995 and has suites ranging from 744 to 2353 square feet. Amenities include a Gym/Exercise Room, Parking Garage, Pool, Party Room, Tennis Court, Concierge/Security Guard and Meeting/Function Room. 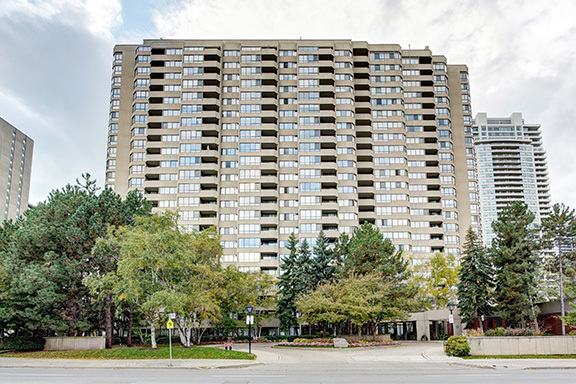 Concorde Park I is located at 5 Concorde Pl, near the intersection of DVP and Eglinton. This condo was built in 1989 and has suites ranging from 585 to 1392 square feet. Amenities include a Gym/Exercise Room, Pool, Sauna, Parking Garage and Concierge/Security Guard. 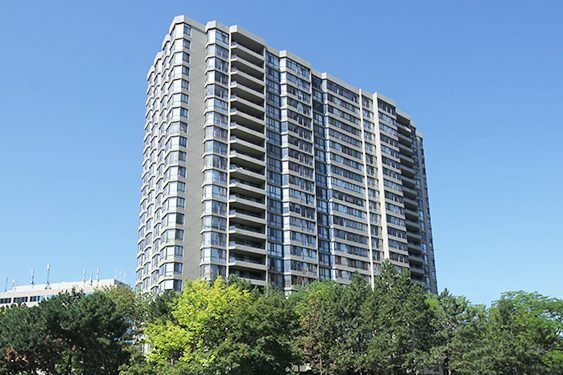 Concorde Park II is located at 7 Concorde Pl, near the intersection of DVP and Eglinton. This condo was built in 1992 and has suites ranging from 652 to 1497 square feet. Amenities include a Gym/Exercise Room, Pool, Sauna, Parking Garage and Concierge/Security Guard. 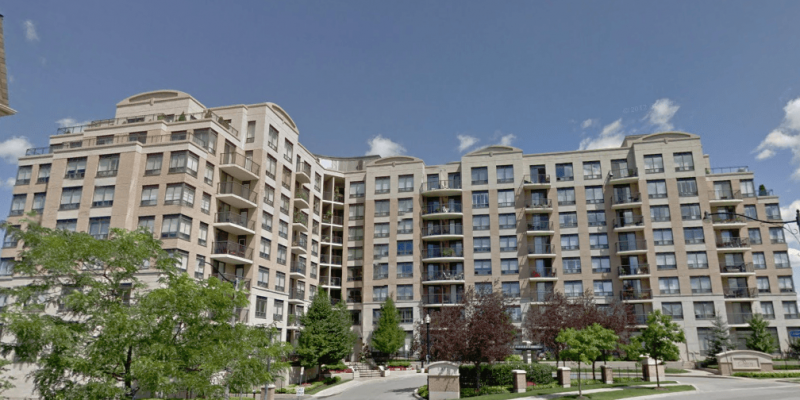 The Brookbanks is located at 17 Brookbanks Dr, near the intersection of Don Mills and York Mills. This condo was built in 1999 and has suites ranging from 730 to 1892 square feet. Amenities include a Gym/Exercise Room, Concierge/Security Guard, Party Room, Parking Garage and Meeting/Function Room. 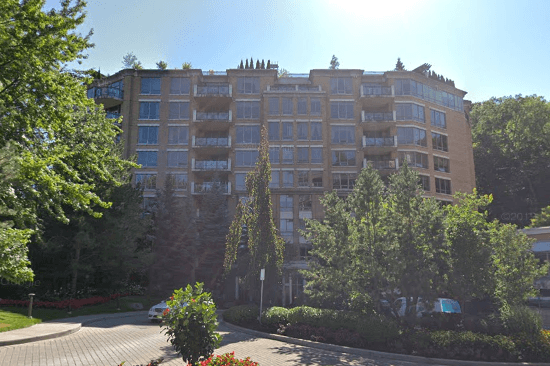 Bellair Gardens is located at 18 Valley Woods Rd, near the intersection of Don Mills and York Mills. This condo was built in 2007 and has suites ranging from 454 to 1716 square feet. Amenities include a Gym/Exercise Room, Concierge/Security Guard, Party Room, Parking Garage, Media Room/Cinema and Meeting Room/Function Room. Accolade is located at 181 Wynford Dr, near the intersection of Don Mills and Eglinton. This condo was built in 2009 and has suites ranging from 625 to 2079 square feet. Amenities include a Gym/Exercise Room, Concierge/Security Guard, Party Room, Parking Garage, Guest Suites and Meeting/Function Room. 1350 York Mills Rd is located near the intersection of York Mills and Victoria Park. This condo was built in 1972 and has suites ranging from 619 to 845 square feet. Amenities include a Gym/Exercise Room, Pool, Parking Garage and Sauna. 75 Graydon Hall Drive is located near the intersection of Don Mills and York Mills. 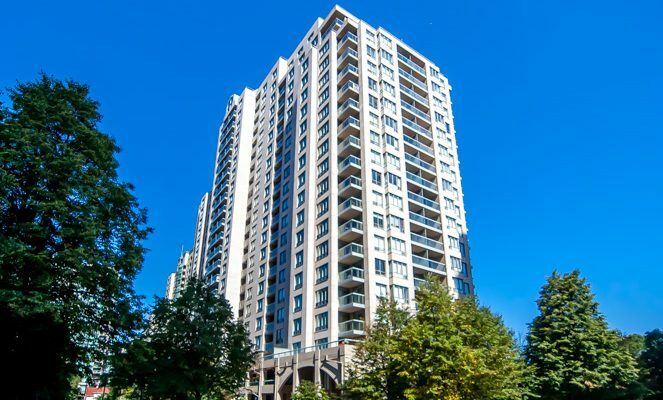 This condo was built in 1976 and has suites ranging from 1299 to 1300 square feet. Amenities include a Gym/Exercise Room, Party Room, Parking Garage, Meeting/Function Room, Sauna and Concierge/Security Guard. York Mills Heights is located at 1338 York Mills Rd, near the intersection of York Mills and Victoria Park. This condo was built in 1975 and has suites ranging from 795 to 1036 square feet. Amenities include a Gym/Exercise Room, Pool, Parking Garage, Sauna and Concierge/Security Guard. York Mills Mansions is located at 75 York Mills RD, near the intersection of Yonge and York Mills. This condo was built in 1994 and has suites ranging from 707 to 1446 square feet. Amenities include a Gym/Exercise Room, Party Room, Parking Garage, Meeting/Function Room and Games/Recreation Room. Hillside – Ravines is located at 38 William Carson Cres, near the intersection of Yonge and York Mills. This condo was built in 2006 and has suites ranging from 707 to 1911 square feet. Amenities include a Gym/Exercise Room, Pool, Concierge/Security Guard, Party Room, Parking Garage, Guest Suites, Meeting/Function Room and Sauna. Hillside at York Mills II is located at 28 William Carson Cres, near the intersection of Yonge and York Mills. This condo was built in 2002 and has suites ranging from 700 to 2294 square feet. Amenities include a Gym/Exercise Room, Pool, Concierge/Security Guard, Parking Garage, Guest Suites and Sauna. Hillside at York Mills is located at 18 William Carson Cres, near the intersection of Yonge and York Mills. This condo was built in 2000 and has suites ranging from 633 to 2413 square feet. Amenities include a Gym/Exercise Room, Pool, Parking Garage, Sauna and Concierge/Security Guard. The Antiquary is located at 11 William Carson Cres, near the intersection of Yonge and York Mills. This condo was built in 2001 and has suites ranging from 888 to 4390 square feet. Amenities include a Gym/Exercise Room, Pool, Concierge/Security Guard, Party Room, Meeting/Function Room, Parking Garage and Sauna. 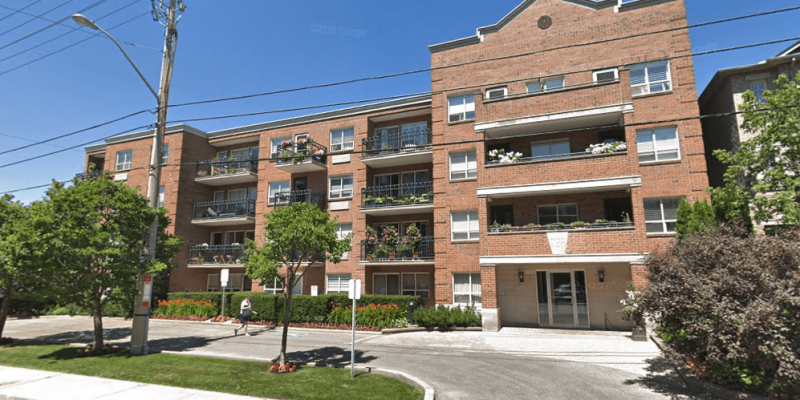 Fifeshire Gardens is located at 96 Fifeshire Rd, near the intersection of Bayview and Sheppard. This condo was built in 1985 and has suites ranging from 1246 to 2053 square feet. Amenities include a Gym/Exercise Room, Parking Garage and Sauna. 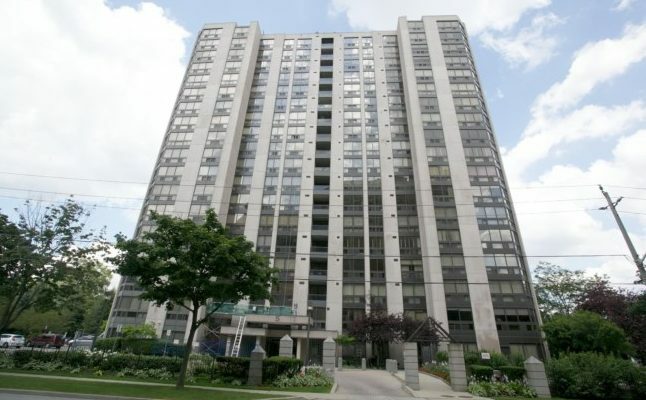 Blythwood at Huntington is located at 1888 Bayview Ave, near the intersection of Bayview and Eglinton. This condo was built in 2014 and has suites ranging from 790 to 4180 square feet. Amenities include a Gym/Exercise Room, Pool, Concierge/Security Guard, Party Room, Parking Garage, Bicycle Parking, Guest Suites, Hot Tub/Jacuzzi, Meeting/Function Room, Outdoor Patio/Garden, Sauna, Spa and Visitor Lounge. The Chedington II is located at 2 Chedington Place, near the intersection of Bayview and Lawrence. This condo was built in 1998 and has suites ranging from 2130 to 5268 square feet. Amenities include a Gym/Exercise Room, Parking Garage, Pool, Sauna and Concierge/Security Guard. Kilgour Estate II is located at 21 Burkebrook Pl, near the intersection of Bayview and Eglinton. This condo was built in 2008 and has suites ranging from 570 to 3148 square feet. Amenities include a Gym/Exercise Room, Pool, Concierge/Security Guard, Party Room, Parking Garage, BBQs, Guest Suites, Media Room/Cinema, Meeting/Function Room and Sauna. 10 Old York Mills Rd is located near the intersection of Yonge and York Mills. This condo was built in 2001 and has suites ranging from 703 to 4209 square feet. Amenities include a Gym/Exercise Room, Guest Suites, Pool, Party Room, Meeting/Function Room, Sauna, Concierge/Security Guard and Parking Garage. 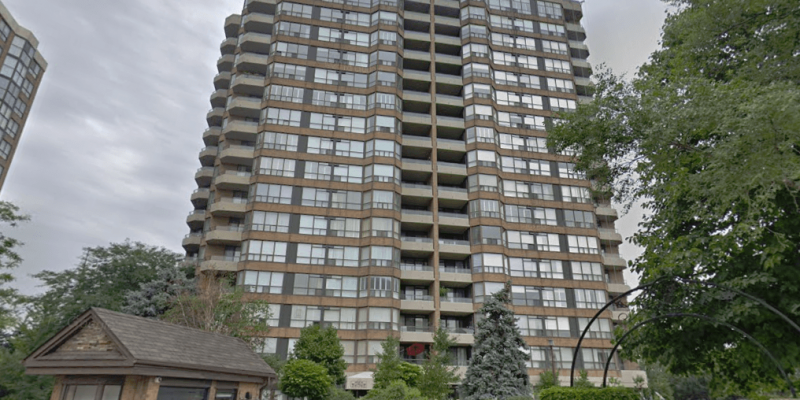 Kilgour Estate I is located at 20 Burkebrook Pl, near the intersection of Bayview and Eglinton. This condo was built in 2007 and has suites ranging from 569 to 3015 square feet. Amenities include a Gym/Exercise Room, Pool, Concierge/Security Guard, Party Room, Parking Garage, BBQs, Guest Suites, Media Room/Cinema, Meeting/Function Room and Sauna. The Gateway is located at 10 Gateway Blvd, near the intersection of Eglinton and Don Mills. This condo was built in 1999 and has suites ranging from 796 to 1220 square feet. Amenities include a Gym/Exercise Room, Parking Garage, Sauna and Concierge/Security Guard. 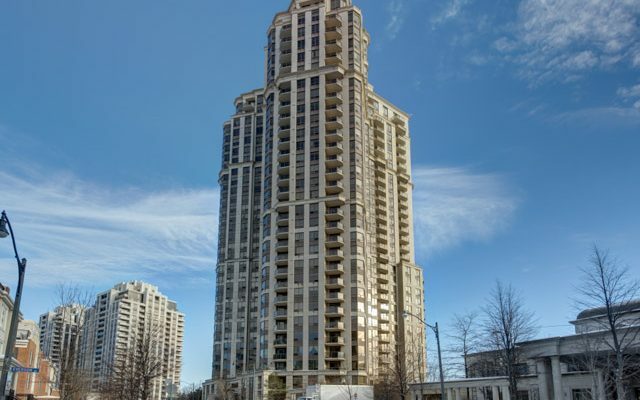 The Palisades II is located at 205 Wynford Dr, near the intersection of DVP and Eglinton. 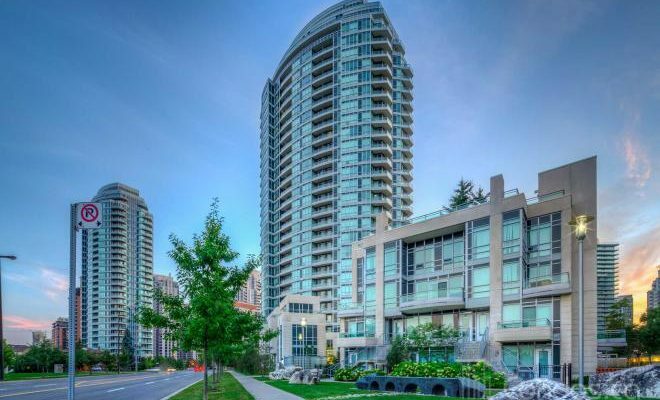 This condo was built in 1990 and has suites ranging from 1368 to 2881 square feet. Amenities include a Gym/Exercise Room, Pool, Parking Garage, Sauna and Concierge/Security Guard. 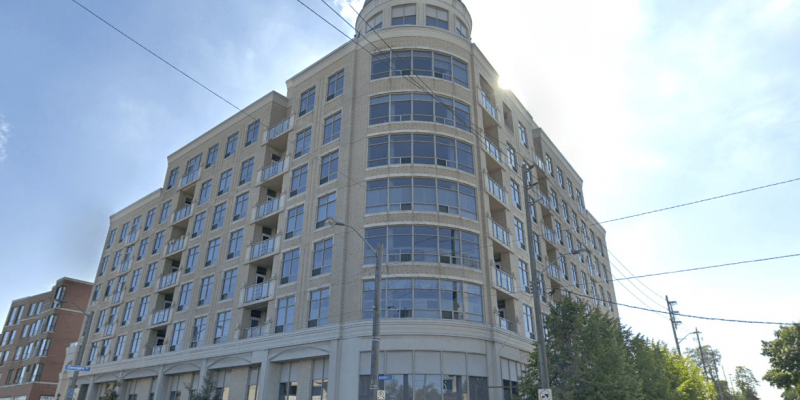 15 Vicora Linkway is located near the intersection of DVP and Eglinton. 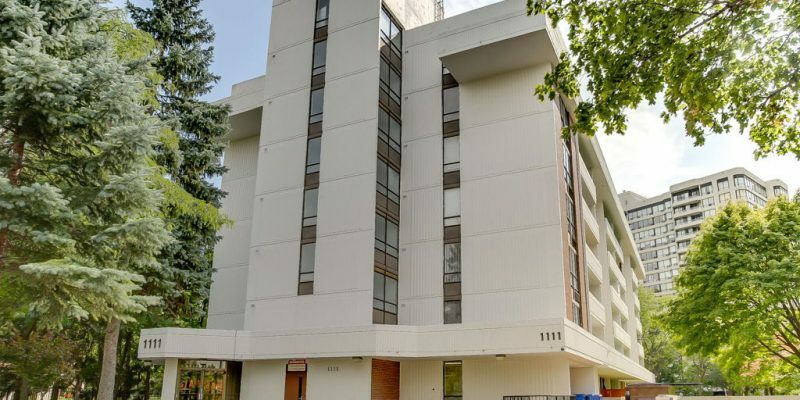 This condo was built in 1972 and has suites ranging from 1016 to 1150 square feet. Amenities include a Gym/Exercise Room, Pool, Parking Garage, Sauna and Concierge/Security Guard. 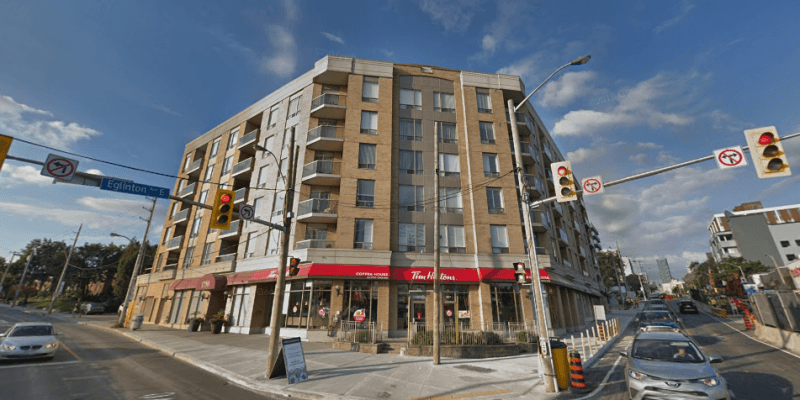 5 Vicora Linkway is located near the intersection of DVP and Eglinton. 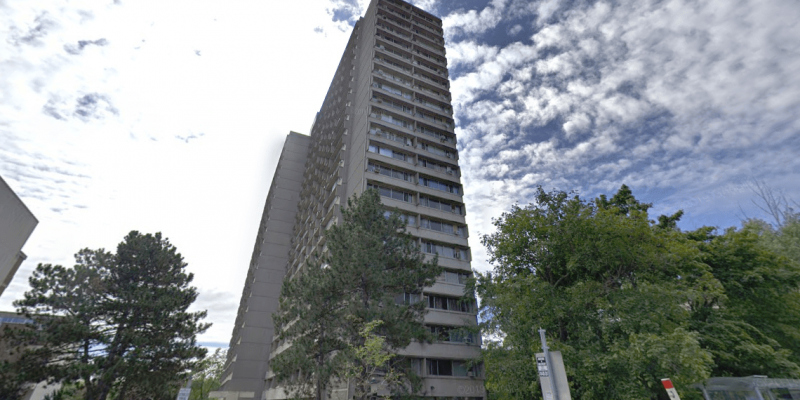 This condo was built in 1971 and has suites ranging from 1016 to 1150 square feet. Amenities include a Gym/Exercise Room, Pool, Parking Garage, Sauna and Concierge/Security Guard. 5 Shady Golfway is located near the intersection of DVP and Eglinton. This condo was built in 1975 and has suites ranging from 994 to 1100 square feet. Amenities include a Gym/Exercise Room, Pool, Parking Garage, Sauna and Concierge/Security Guard. 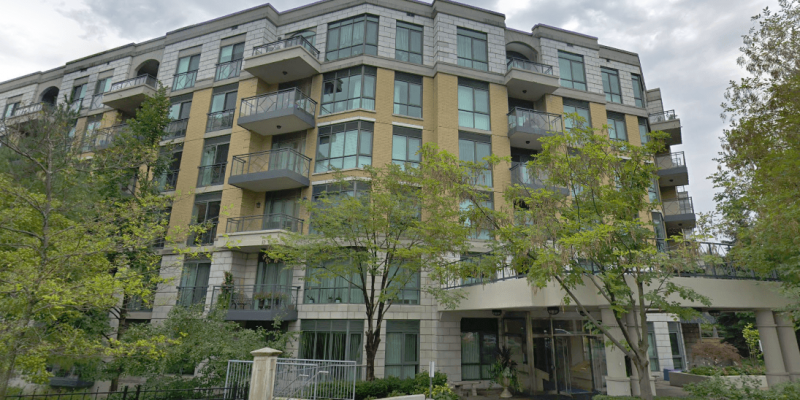 60 Pavane Linkway is located near the intersection of DVP and Eglinton. This condo was built in 1972 and has suites ranging from 1030 to 1165 square feet. Amenities include a Gym/Exercise Room, Pool, Parking Garage, Sauna and Concierge/Security Guard. 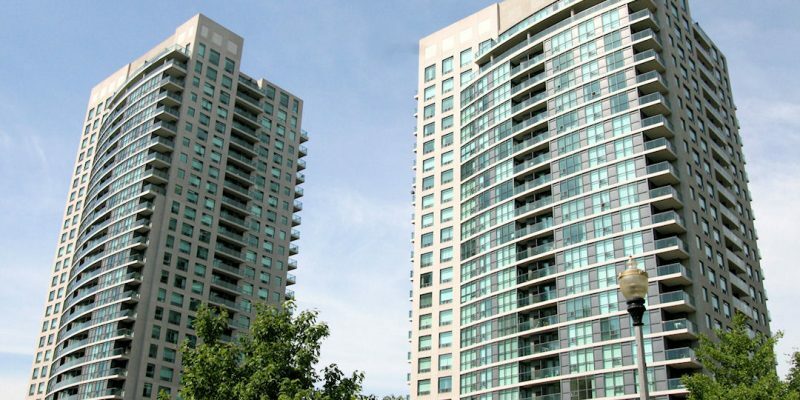 Wynford Condominiums is located at 20 Edgecliff Golfway, near the intersection of DVP and Eglinton. 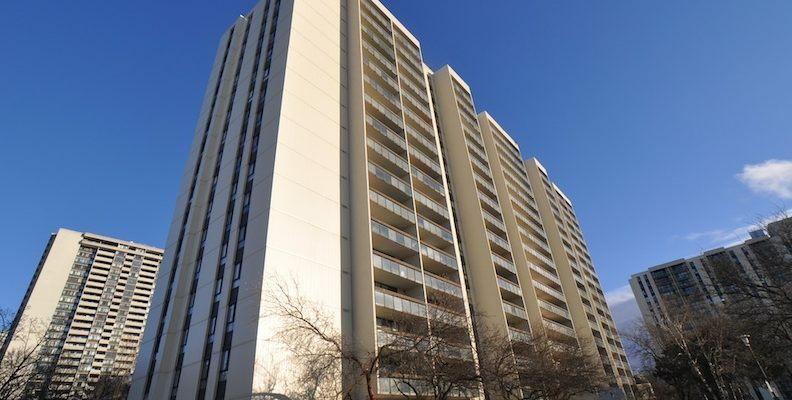 This condo was built in 1974 and has suites ranging from 1021 to 1130 square feet. Amenities include a Gym/Exercise Room, Pool, Sauna, Parking Garage and Concierge/Security Guard. 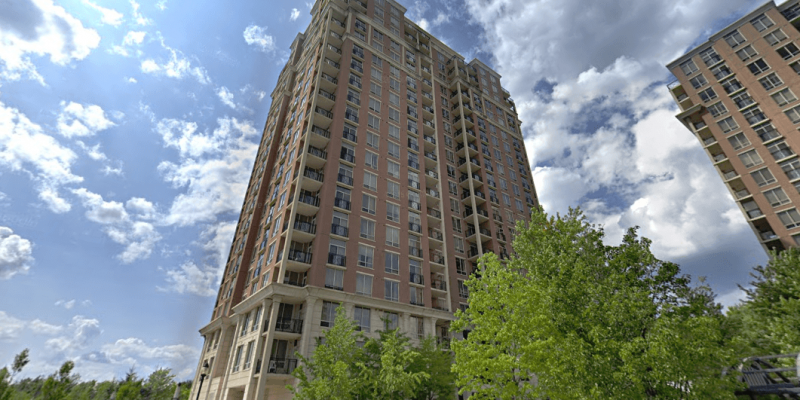 Wynford Park Condominiums is located at 10 Edgecliff Golfway, near the intersection of DVP and Eglinton. This condo was built in 1974 and has suites ranging from 904 to 1000 square feet. Amenities include a Gym/Exercise Room, Pool, Sauna, Parking Garage and Concierge/Security Guard. 10 Sunny Glenway is located near the intersection of DVP and Don Mills. This condo was built in 1973 and has suites ranging from to square feet. Amenities include a Gym/Exercise Room, Concierge/Security Guard, Pool and Sauna. 100 Leeward Glenway is located near the intersection of Don Mills and Eglinton. This condo was built in 1974 and has suites ranging from 586 to 1173 square feet. Monthly maintenance fees include Common Element Maintenance, Building Insurance, Heat, Parking and Hydro. 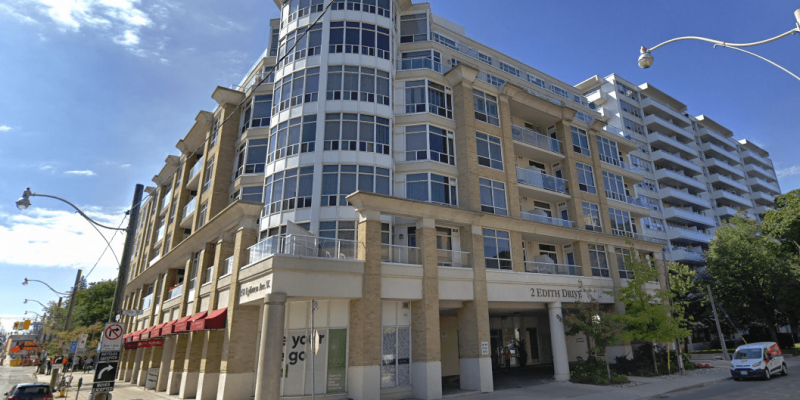 Tribeca Lofts is located at 797 Don Mills Rd, near the intersection of Don Mills and Eglinton. This condo was built in 2001 and has suites ranging from 585 to 1178 square feet. Amenities include a Gym/Exercise Room, Party Room, Parking Garage, Meeting/Function Room and Concierge/Security Guard. Glen Valley Condominiums is located at 735 Don Mills Rd, near the intersection of Don Mills and Eglinton. 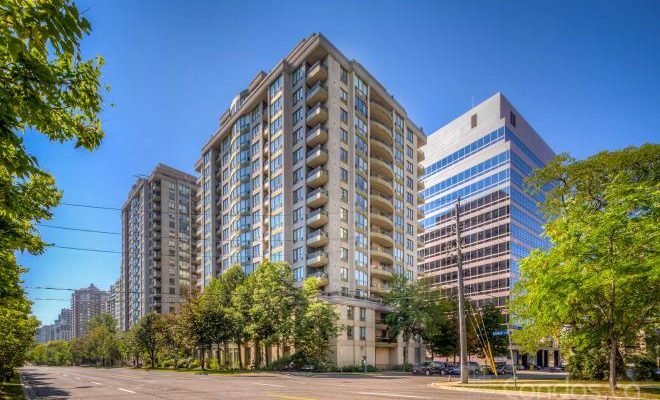 This condo was built in 1972 and has suites ranging from 606 to 804 square feet. Amenities include a Gym/Exercise Room, Pool, Parking Garage, Sauna and Concierge/Security Guard. Glen Valley Condominiums is located at 725 Don Mills Rd, near the intersection of Don Mills and Eglinton. 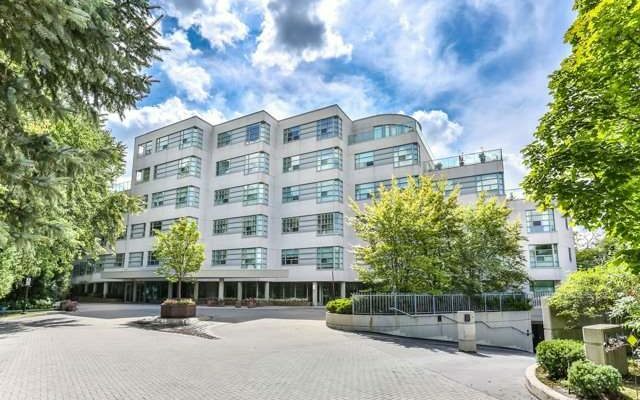 This condo was built in 1972 and has suites ranging from 606 to 804 square feet. Amenities include a Gym/Exercise Room, Pool, Parking Garage, Sauna and Concierge/Security Guard. Glen Valley Condominiums is located at 715 Don Mills Rd, near the intersection of Don Mills and Eglinton. This condo was built in 1972 and has suites ranging from 606 to 804 square feet. Amenities include a Gym/Exercise Room, Pool, Parking Garage, Sauna and Concierge/Security Guard. 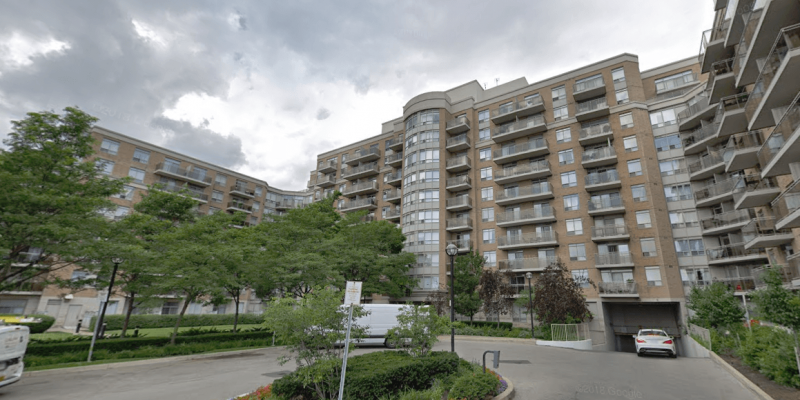 Leaside Park Terrace is located at 1 Leaside Park Dr, near the intersection of Bayview and Eglinton. This condo was built in 1998 and has suites ranging from 689 to 923 square feet. Amenities include a Gym/Exercise Room, Party Room, Meeting/Function Room and Parking Garage. Leaside Park is located at 11 Thorncliffe Pk Dr, near the intersection of Bayview and Eglinton. This condo was built in 1991 and has suites ranging from 601 to 1269 square feet. Amenities include a Gym/Exercise Room, Pool, Party Room, Parking Garage, Meeting/Function Room, Sauna and Concierge/Security Guard. Jockey Club is located at 21 Overlea Blvd, near the intersection of Bayview and Eglinton. This condo was built in 1991 and has suites ranging from 600 to 1154 square feet. Amenities include a Gym/Exercise Room, Parking Garage, Sauna, Concierge/Security Guard and Squash/Racquet Court. Leaside Gate is located at 955 Millwood Rd, near the intersection of Bayview and Eglinton. This condo was built in 1988 and has suites ranging from 773 to 1755 square feet. Amenities include a Gym/Exercise Room, Pool, Parking Garage and Sauna. The Metro is located at 119 Merton st, near the intersection of Yonge and Davisville. This condo was built in 2000 and has suites ranging from 563 to 1288 square feet. Amenities include a Party Room, Parking Garage, BBQs, Car Wash, Meeting/Function Room and FibreStream Internet. The Phoenix is located at 1901 Yonge St, near the intersection of Yonge and Davisville. This condo was built in 1995 and has suites ranging from 632 to 1292 square feet. Amenities include a Gym/Exercise Room, Parking Garage and Concierge/Security Guard. 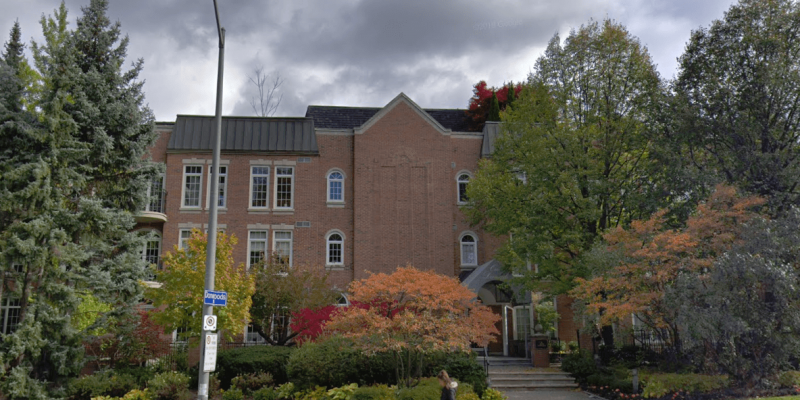 Chaplin Place is located at 20 Glebe Rd W, near the intersection of Yonge and Davisville. This condo was built in 1984 and has suites ranging from 816 to 1557 square feet. Monthly maintenance fees include Common Element Maintenance, Building Insurance, Parking and Water. Panache is located at 212 Eglinton Ave E, near the intersection of Mt Pleasant and Eglinton. This condo was built in 2008 and has suites ranging from 423 to 1495 square feet. Amenities include a Gym/Exercise Room, Pool, Concierge/Security Guard, Party Room, Parking Garage, Guest Suites, Meeting/Function Room and FibreStream Internet. 43 Eglinton Ave E is located near the intersection of Yonge and Eglinton. This condo was built in 2002 and has suites ranging from 238 to 1302 square feet. Amenities include a Gym/Exercise Room, Party Room, Meeting/Function Room, Sauna, Concierge/Security Guard, Parking Garage and Media Room/Cinema. Broadway Plaza is located at 7 Broadway AVE, near the intersection of Yonge and Eglinton. This condo was built in 1991 and has suites ranging from 498 to 1536 square feet. Amenities include a Gym/Exercise Room, Pool, Sauna, Parking Garage and Concierge/Security Guard. 88 on Broadway is located at 88 Broadway AVE, near the intersection of Mt Pleasant and Eglinton. This condo was built in 2009 and has suites ranging from 508 to 1489 square feet. Amenities include a Gym/Exercise Room, Concierge/Security Guard, Media Room/Cinema, Pool, Party Room, Meeting/Function Room, Common Rooftop Deck and Parking Garage. The Republic South Tower is located at 70 ROEHAMPTON AVE, near the intersection of Yonge and Eglinton. This condo was built in 2010 and has suites ranging from 641 to 2526 square feet. Amenities include a Gym/Exercise Room, Party Room, Media Room/Cinema, Pool, Parking Garage, Meeting/Function Room, Sauna, Concierge/Security Guard and Guest Suites. 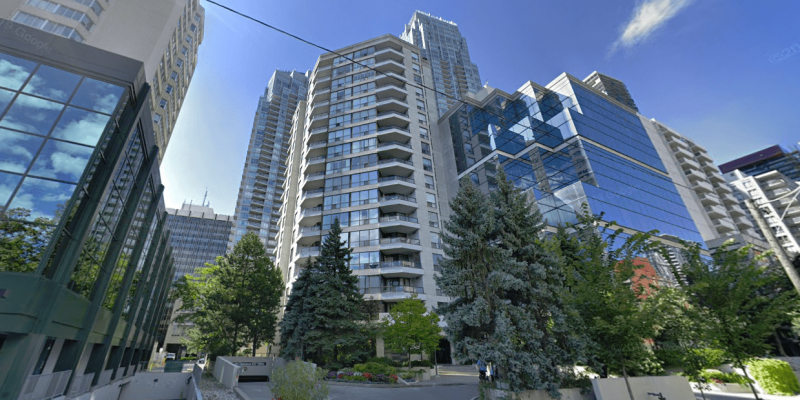 83 Redpath Residences is located at 83 REDPATH AVE, near the intersection of Mt Pleasant and Eglinton. This condo was built in 2010 and has suites ranging from 543 to 1233 square feet. Amenities include a Gym/Exercise Room, Party Room, Media Room/Cinema, Common Rooftop Deck, Parking Garage, Meeting/Function Room, Concierge/Security Guard and Guest Suites. 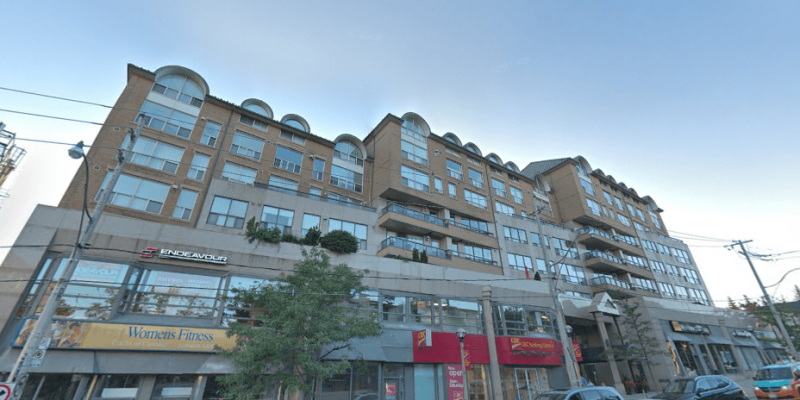 The Metro is located at 139 MERTON ST, near the intersection of Yonge and Davisville. This condo was built in 2000 and has suites ranging from 569 to 1288 square feet. Amenities include a BBQs, Parking Garage, FibreStream Internet, Party Room, Car Wash, Parking Garage and Meeting/Function Room. 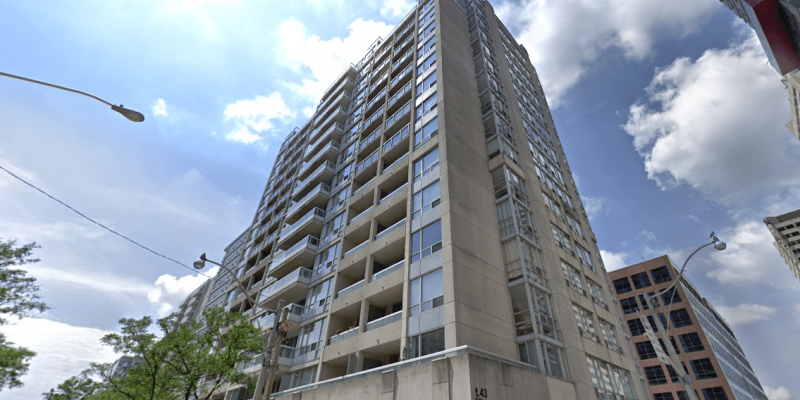 Rio is located at 35 MERTON ST, near the intersection of Yonge and Davisville. This condo was built in 2000 and has suites ranging from 581 to 1334 square feet. 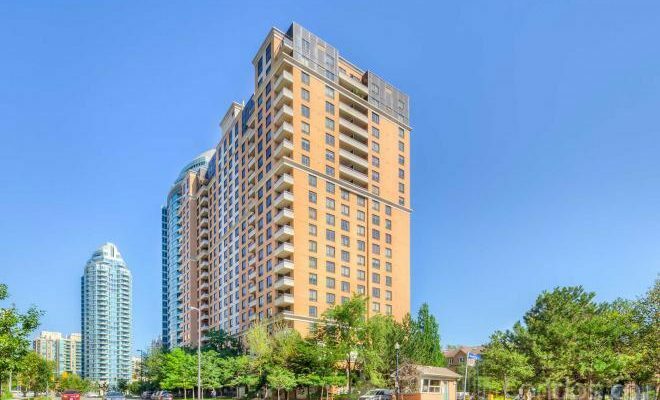 Amenities include a Gym/Exercise Room, Sauna, Parking Garage and Concierge/Security Guard. Radius is located at 18 MERTON ST, near the intersection of Yonge and Davisville. This condo was built in 2001 and has suites ranging from 623 to 1266 square feet. Amenities include a Gym/Exercise Room, Parking Garage, Meeting/Function Room and Party Room. Eglinton Place is located at 123 EGLINTON AVE E, near the intersection of Yonge and Eglinton. This condo was built in 2001 and has suites ranging from 614 to 3170 square feet. Amenities include a Gym/Exercise Room, Guest Suites, Pool, Party Room, Meeting/Function Room, Sauna, Concierge/Security Guard and Parking Garage. 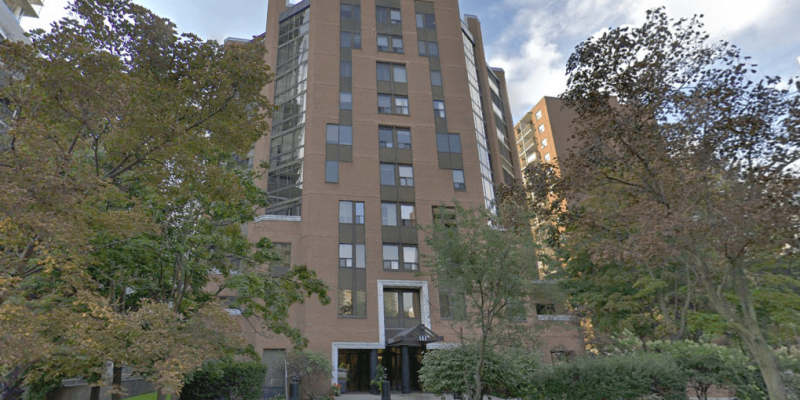 The Parkside is located at 245 DAVISVILLE AVE, near the intersection of Mt Pleasant and Davisville. This condo was built in 2003 and has suites ranging from 570 to 1070 square feet. Amenities include a Gym/Exercise Room, Party Room, Guest Suites, Parking Garage and Meeting/Function Room. The Radley is located at 141 ROEHAMPTON AVE, near the intersection of Yonge and Eglinton. This condo was built in 1984 and has suites ranging from 1487 to 1946 square feet. Amenities include a Gym/Exercise Room, Party Room, Parking Garage, Sauna and Meeting/Function Room. 30 Holly St is located near the intersection of Yonge and Eglinton. This condo was built in 1987 and has suites ranging from 1125 to 1269 square feet. Amenities include a Gym/Exercise Room, Meeting/Function Room, Concierge/Security Guard, Parking Garage, Party Room and Sauna. 70 Erskine Ave is located near the intersection of Yonge and Eglinton. This condo was built in 1978 and has suites ranging from 949 to 1641 square feet. Monthly maintenance fees include Cable TV, Hydro, Water, Common Element Maintenance, Building Insurance, Heat and Parking. 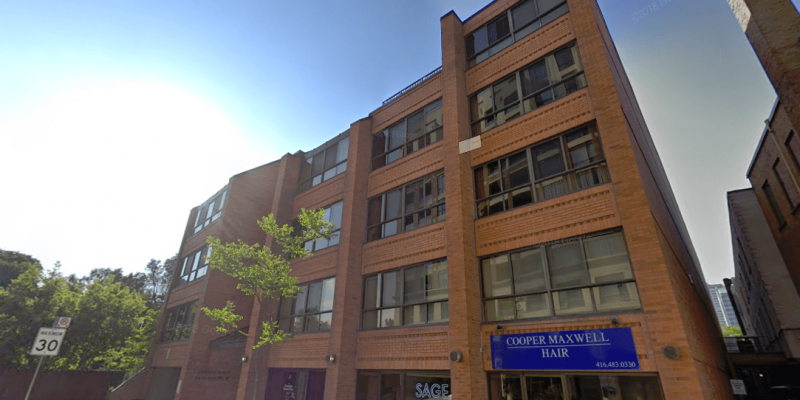 Maxim is located at 398 Eglinton AVE E, near the intersection of Mt Pleasant and Eglinton. This condo was built in 1998 and has suites ranging from 539 to 1871 square feet. Amenities include a Gym/Exercise Room, Meeting/Function Room, Sauna, Party Room and Parking Garage. 3018 Yonge St is located near the intersection of Yonge and Lawrence. This condo was built in 2016 and has suites ranging from 552 to 1277 square feet. Amenities include a Gym/Exercise Room, Party Room, Meeting/Function Room, Pool, BBQs, Outdoor Patio/Garden, Concierge/Security Guard, Hot Tub/Jacuzzi and Sauna. Lawrence Park on Rosewell is located at 485 ROSEWELL AVE, near the intersection of Avenue and Lawrence. This condo was built in 2005 and has suites ranging from 468 to 2093 square feet. Amenities include a Gym/Exercise Room, Party Room, Guest Suites, Parking Garage, Concierge/Security Guard, Media Room/Cinema and Meeting/Function Room. Lawrence Park on Rosewell is located at 481 ROSEWELL AVE, near the intersection of Avenue and Lawrence. This condo was built in 2005 and has suites ranging from 468 to 2093 square feet. Amenities include a Gym/Exercise Room, Party Room, Guest Suites, Parking Garage, Concierge/Security Guard, Media Room/Cinema and Meeting/Function Room. Lawrence Park on Rosewell is located at 451 ROSEWELL AVE, near the intersection of Avenue and Lawrence. This condo was built in 2005 and has suites ranging from 468 to 2093 square feet. Amenities include a Gym/Exercise Room, Party Room, Guest Suites, Parking Garage, Concierge/Security Guard, Media Room/Cinema and Meeting/Function Room. Residences of Muir Park is located at 2900 YONGE ST, near the intersection of Yonge and Lawrence. This condo was built in 1987 and has suites ranging from 1470 to 3786 square feet. Amenities include a Gym/Exercise Room, Concierge/Security Guard, Parking Garage, Pool, Common Rooftop Deck, Party Room, Meeting/Function Room and Sauna. 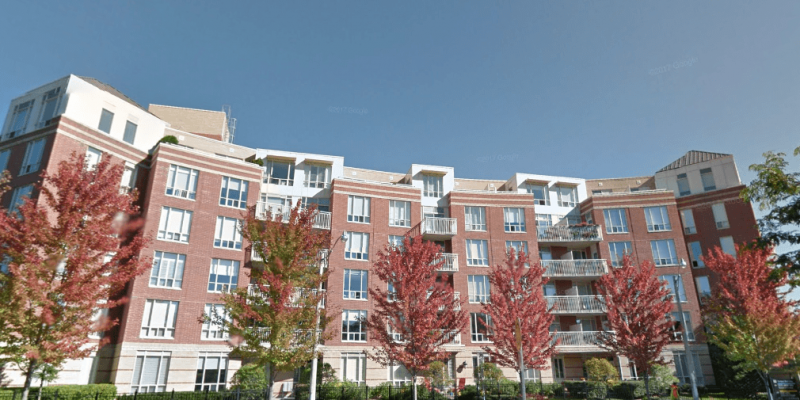 Lawrence Park Residences is located at 3130 Yonge St, near the intersection of Yonge and Lawrence. This condo was built in 2002 and has suites ranging from 657 to 2152 square feet. Amenities include a Gym/Exercise Room, Parking Garage, Party Room and Meeting/Function Room. 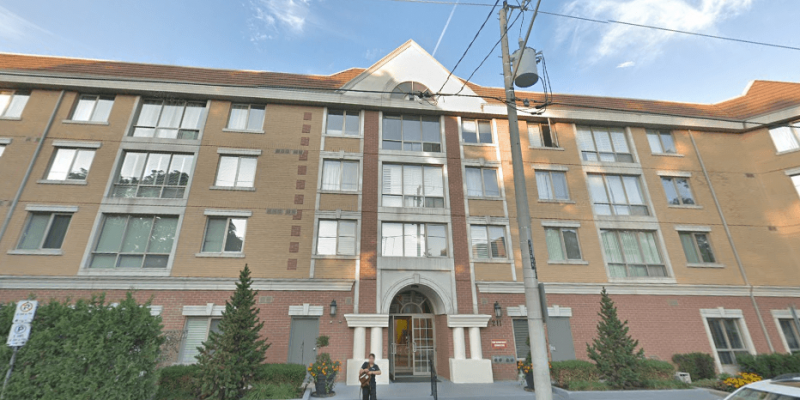 The Residences of Wanless Park is located at 18 WANLESS AVE, near the intersection of Yonge and Lawrence. This condo was built in 2001 and has suites ranging from 622 to 1419 square feet. Amenities include a Gym/Exercise Room, Party Room, Parking Garage, Common Rooftop Deck and Meeting/Function Room. 1717 Avenue Rd is located near the intersection of Avenue and Lawrence. This condo was built in 2011 and has suites ranging from 769 to 3019 square feet. Amenities include a Gym/Exercise Room, Parking Garage, Media Room/Cinema, Concierge/Security Guard, BBQs, Meeting/Function Room, Party Room and Guest Suites. Bedford Glen is located at 1555 AVENUE RD, near the intersection of Avenue and Lawrence. This condo was built in 1980 and has suites ranging from 605 to 1685 square feet. Amenities include a Gym/Exercise Room, BBQs, Squash/Racquet Court, Party Room, Meeting/Function Room, Sauna and Parking Garage. 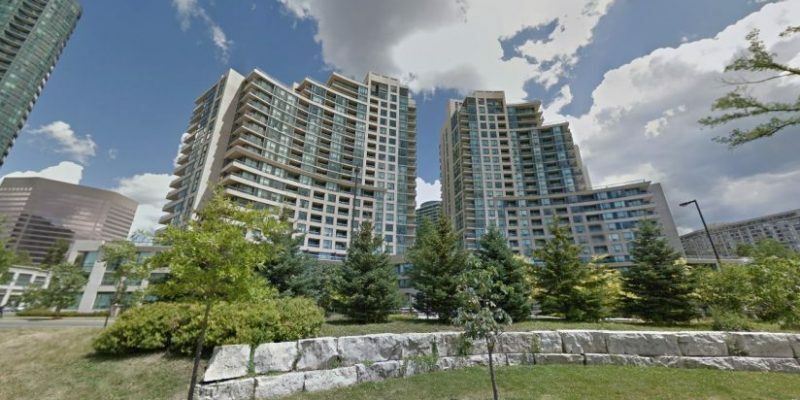 Governor’s Hill I is located at 3800 YONGE ST, near the intersection of Yonge and York Mills. 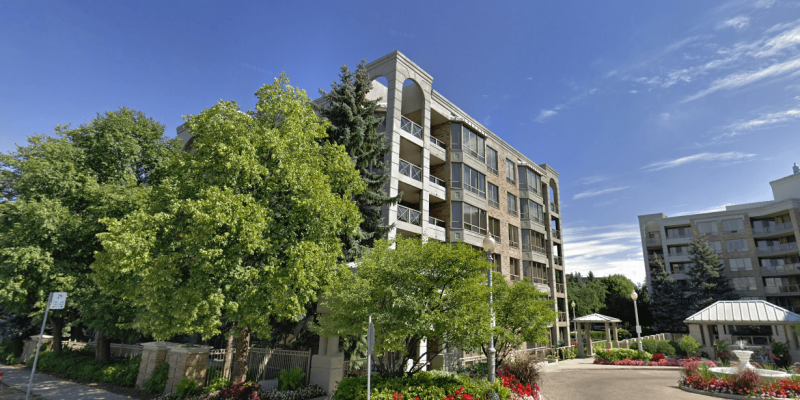 This condo was built in 1990 and has suites ranging from 1000 to 4277 square feet. Amenities include a Gym/Exercise Room, Parking Garage, Concierge/Security Guard, Pool and Sauna. Bedford Glen is located at 40 SYLVAN VALLEY WAY, near the intersection of Avenue and Lawrence. This condo was built in 1980 and has suites ranging from 605 to 1685 square feet. Amenities include a Gym/Exercise Room, BBQs, Squash/Racquet Court, Party Room, Meeting/Function Room, Sauna and Parking Garage. 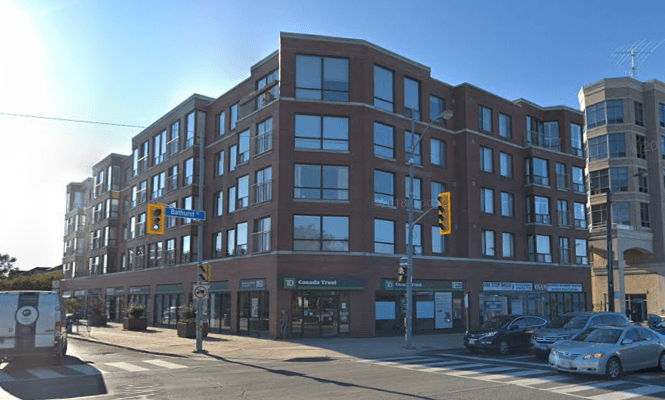 3555 Bathurst St is located near the intersection of 401 and Bathurst. 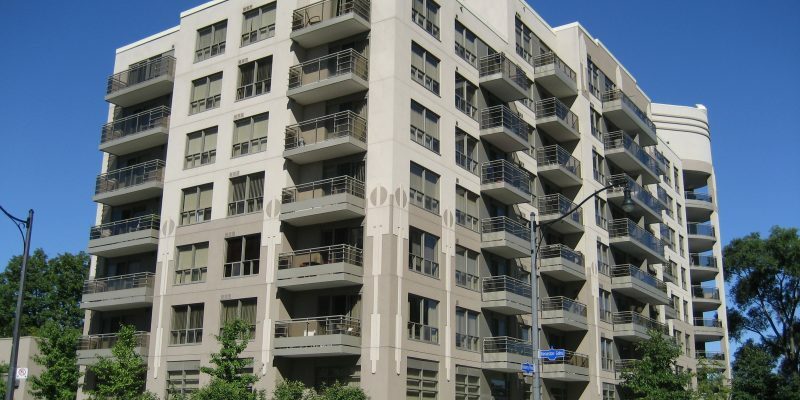 This condo was built in 1978 and has suites ranging from 710 to 924 square feet. Amenities include a Gym/Exercise Room, Parking Garage and Sauna. 150 Neptune Dr is located near the intersection of 401 and Allen Rd. 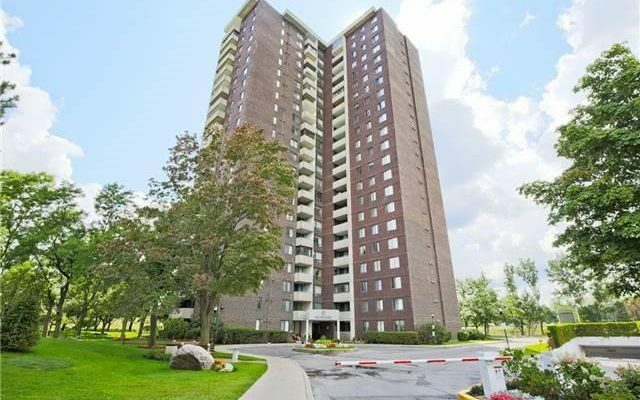 This condo was built in 1975 and has suites ranging from 1269 to 1270 square feet. Amenities include a Gym/Exercise Room, Parking Garage, Sauna, Pool, Meeting/Function Room, Party Room and Tennis Court. 130 Neptune Dr is located near the intersection of 401 and Allen Rd . 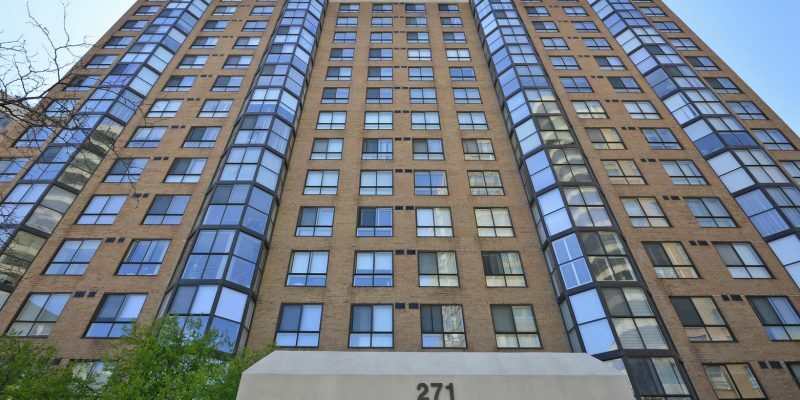 This condo was built in 1972 and has suites ranging from 878 to 1741 square feet. Amenities include a Gym/Exercise Room, Pool, Sauna and Parking Garage. The Hunt Club at Roselawn is located at 1111 Avenue Rd, near the intersection of Avenue and Eglinton. This condo was built in 2005 and has suites ranging from 986 to 2005 square feet. Amenities include a Gym/Exercise Room, Parking Garage, Party Room and Meeting/Function Room. THE HEMINGWAY is located at 1597 BATHURST St, near the intersection of Bathurst and St Clair. 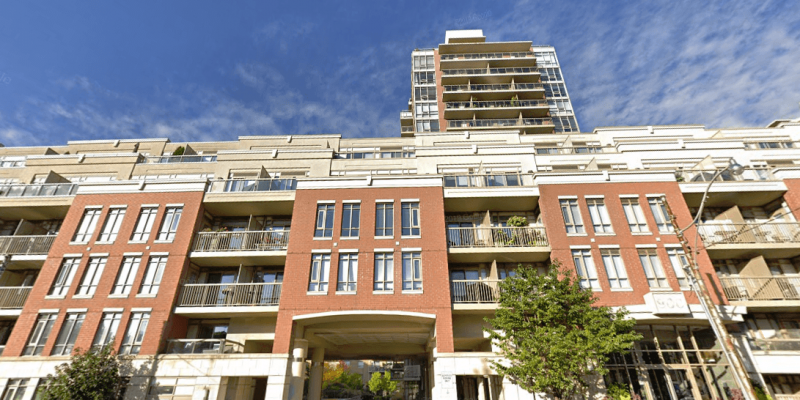 This condo was built in 2002 and has suites ranging from 1075 to 1171 square feet. Amenities include a Gym/Exercise Room and Parking Garage. 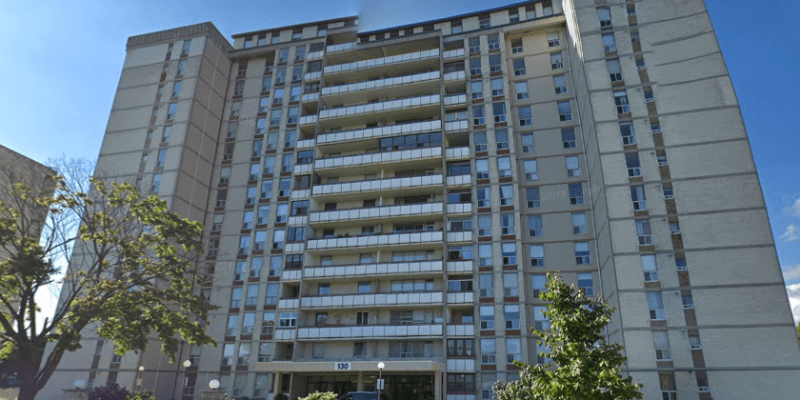 8 Kingsbridge Crt is located near the intersection of Bathurst and Finch. This North York condo was built in 1991. Monthly maintenance fees include Common Element Maintenance, Parking, Heat, Water and Building Insurance. 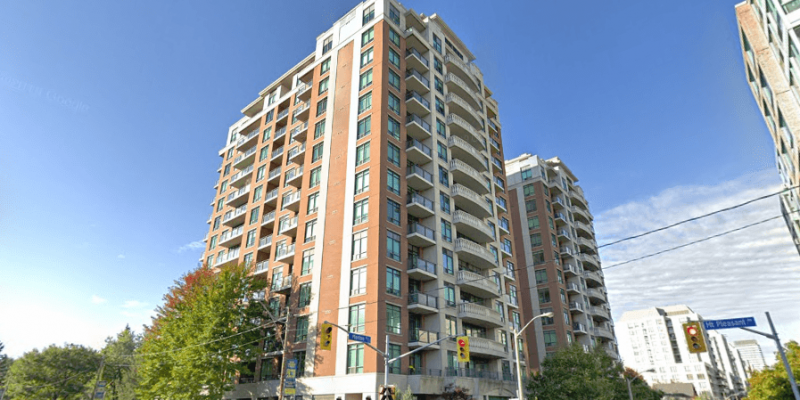 Residences of Avondale is located at 19 Avondale Ave, near the intersection of Yonge and Sheppard. 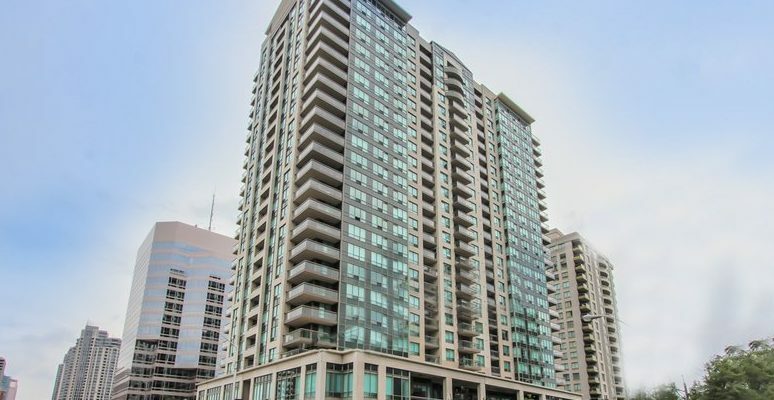 This North York condo was built in 2006 and has suites ranging from 344 to 1199 square feet. Amenities include a Gym/Exercise Room, Common Rooftop Deck, Concierge/Security Guard, Party Room, BBQs, Guest Suites, Meeting/Function Room, Parking Garage and Sauna. Twenty One Clairtrell is located at 21 Clairtrell Rd, near the intersection of Bayview and Sheppard. This North York condo was built in 2013 and has suites ranging from 518 to 2525 square feet. Amenities include a Gym/Exercise Room, Concierge/Security Guard, BBQs, Meeting/Function Room, Games/Recreation Room, Party Room, Bicycle Parking, Outdoor Patio/Garden, Common Rooftop Deck, Parking Garage and Guest Suites. Celsius is located at 68 Canterbury Pl, near the intersection of Yonge and Finch. 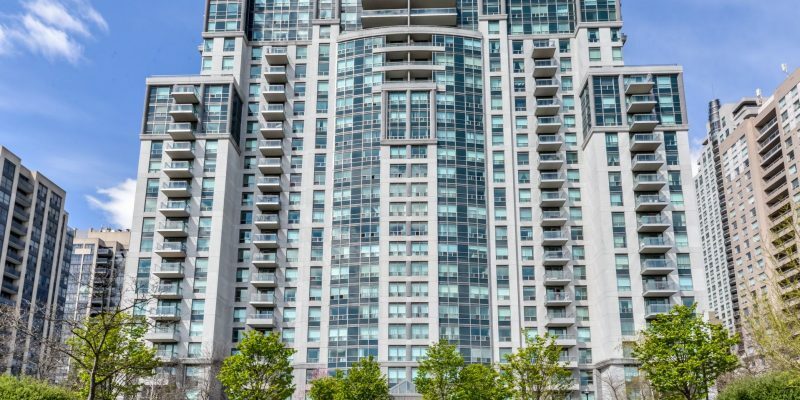 This North York condo was built in 2015 and has suites ranging from 375 to 829 square feet. Amenities include a Gym/Exercise Room, Common Rooftop Deck, Concierge/Security Guard, Party Room, BBQs, Bicycle Parking, Guest Suites, Media Room/Cinema, Meeting Room/Function Room, Outdoor Patio/Garden, Visitor Lounge and FibreStream Internet. 222 Finch Ave W is located near the intersection of Bathurst and Finch. This North York condo was built in 2013 and has suites ranging from 394 to 1114 square feet. Amenities include a Party Room and Meeting/Function Room. Gibson Square North Tower is located at 5168 Yonge St, near the intersection of Yonge and Sheppard. This North York condo was built in 2015 and has suites ranging from 567 to 2076 square feet. Amenities include a Gym/Exercise Room, Concierge/Security Guard, Parking Garage, Media Room/Cinema, Pool, Meeting/Function Room, Common Rooftop Deck, Party Room, Guest Suites, Outdoor Patio/Garden, Sauna and Visitor Lounge. Gibson Square South Tower is located at 5162 Yonge St, near the intersection of Yonge and Sheppard. This North York condo was built in 2015 and has suites ranging from 514 to 2088 square feet. Amenities include a Gym/Exercise Room, Concierge/Security Guard, Guest Suites, Outdoor Patio/Garden, Pool, Party Room, Media Room/Cinema, Common Rooftop Deck, Parking Garage, Meeting/Function Room, Games/Recreation Room and Visitor Lounge. 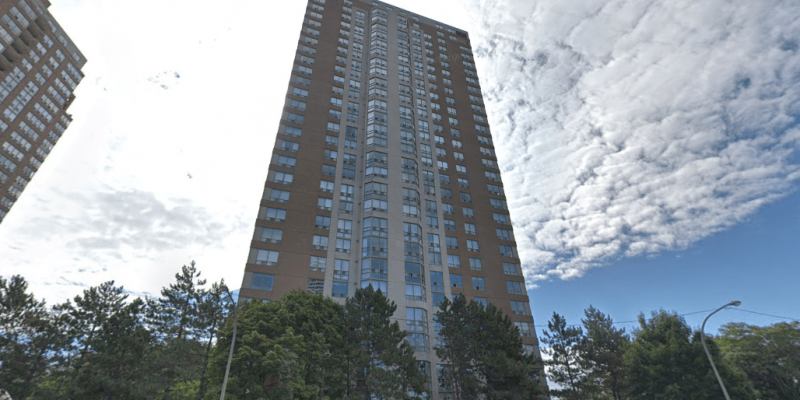 55 Carscadden Dr is located near the intersection of Finch and Bathurst. 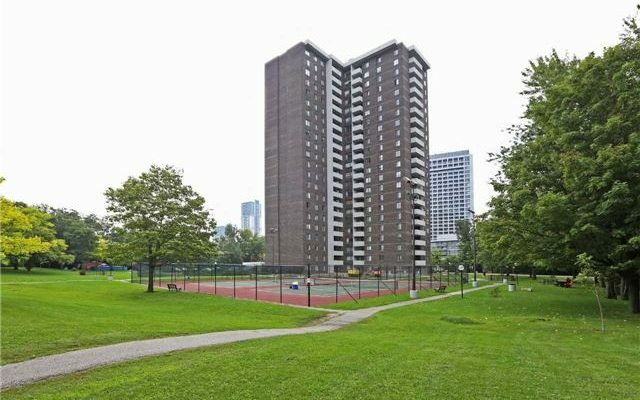 This North York condo was built in 1978 and has suites ranging from 1065 to 1775 square feet. Amenities include a Gym/Exercise Room, Pool, Party Room, BBQs, Meeting/Function Room and Sauna. 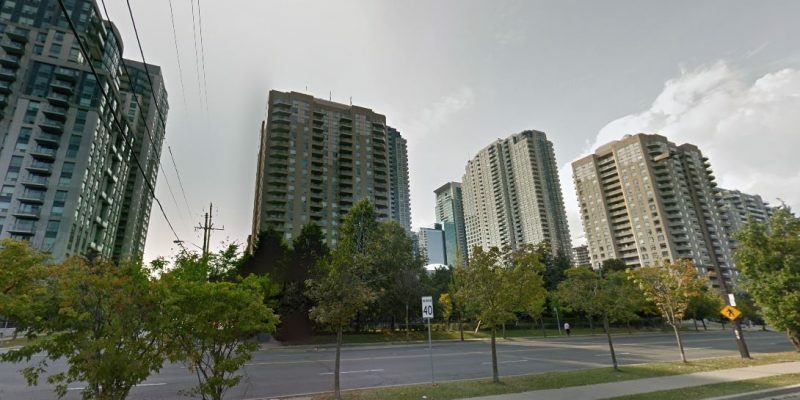 5940 Yonge St is located near the intersection of Yonge and Finch. This North York condo was built in 2015 and has suites ranging from 505 to 903 square feet. Amenities include a Concierge/Security Guard, Party Room, Meeting/Function Room and Parking Garage. 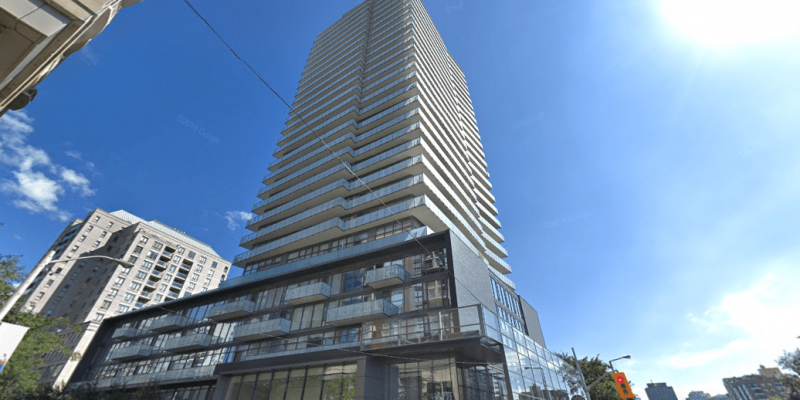 Vogue Condominiums is located at 7 Bishop Ave, near the intersection of Yonge and Finch. This North York condo was built in 2014 and has suites ranging from 496 to 1879 square feet. Amenities include a Gym/Exercise Room, Pool, Sauna, Squash/Racquet Court, Parking Garage and Concierge/Security Guard. 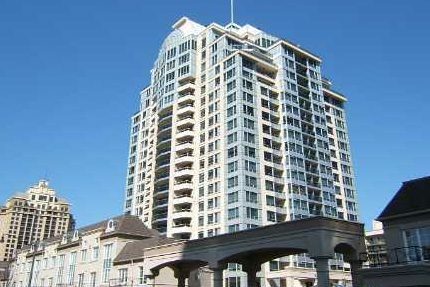 Dream Tower at Emerald City is located at 76 Forest Manor Rd, near the intersection of Don Mills and Sheppard. 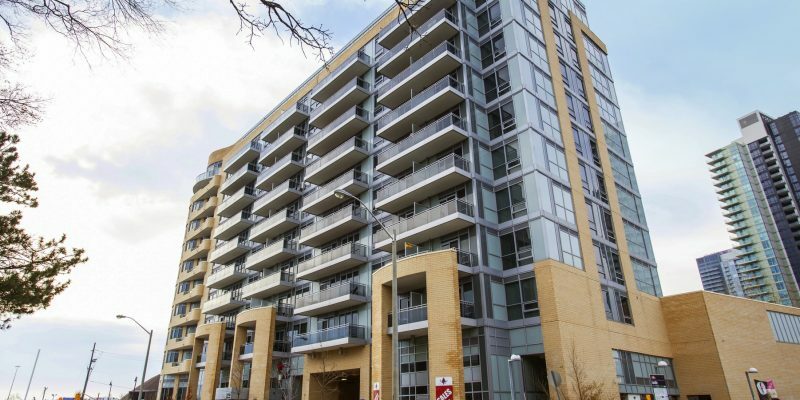 This North York condo was built in 2006 and has suites ranging from 523 to 1265 square feet. Amenities include a Gym/Exercise Room, BBQs, Media Room/Cinema, Outdoor Patio/Garden, Pool, Party Room, Guest Suites, Meeting/Function Room, Spa, Concierge/Security Guard, Parking Garage, Hot Tub/Jacuzzi, Outdoor Child Play Area, Games/Recreation Room and FibreStream Internet. 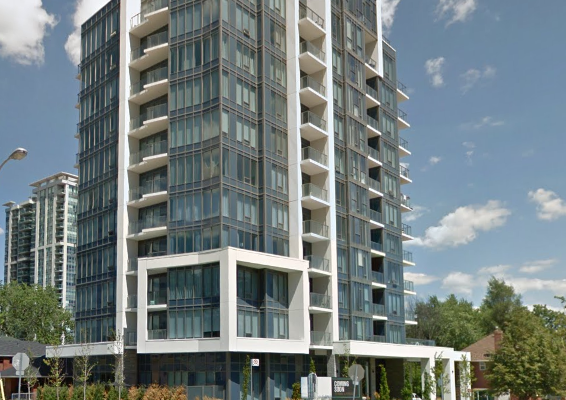 Dream Tower at Emerald City is located at 60 Forest Manor Rd, near the intersection of Don Mills and Sheppard. 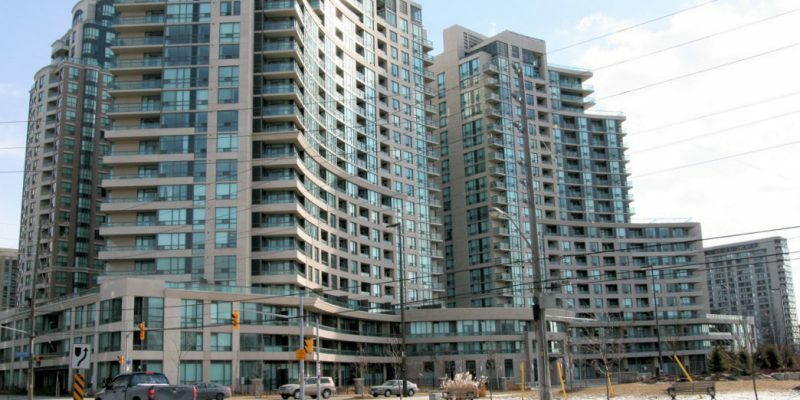 This North York condo was built in 2008 and has suites ranging from 523 to 1265 square feet. Amenities include a Gym/Exercise Room, BBQs, Media Room/Cinema, Outdoor Patio/Garden, Pool, Party Room, Guest Suites, Meeting/Function Room, Spa, Concierge/Security Guard, Parking Garage, Hot Tub/Jacuzzi, Outdoor Child Play Area, Games/Recreation Room and FibreStream Internet. 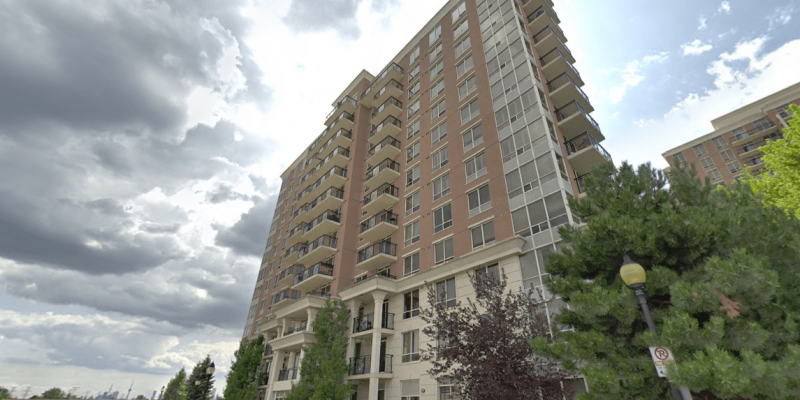 Legacy at Heron’s Hill is located at 2035 Sheppard Ave E, near the intersection of Sheppard and 404. 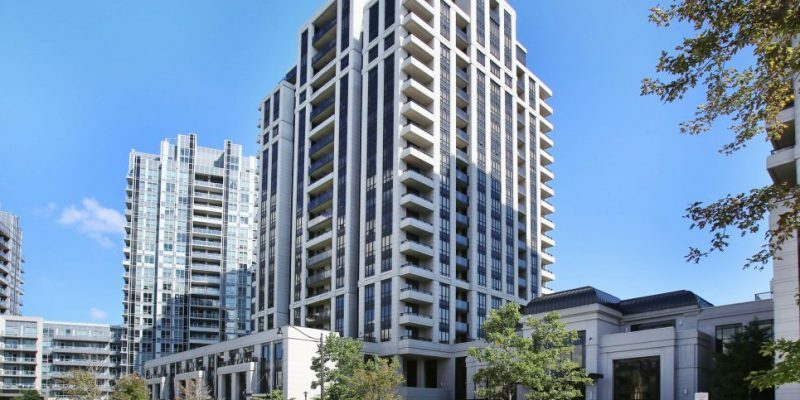 This North York condo was built in 2007 and has suites ranging from 402 to 991 square feet. Amenities include a Gym/Exercise Room, Party Room, Meeting/Function Room, Sauna, Pool, Parking Garage, Concierge/Security Guard and Guest Suites. Legacy at Heron’s Hill is located at 30 Heron’s Hill Way, near the intersection of Sheppard and 404. 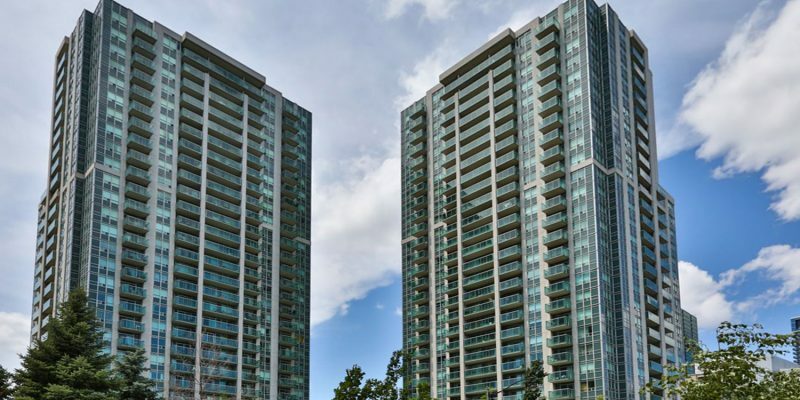 This North York condo was built in 2007 and has suites ranging from 402 to 991 square feet. Amenities include a Gym/Exercise Room, Party Room, Meeting/Function Room, Sauna, Pool, Parking Garage, Concierge/Security Guard and Guest Suites. Yorkland at Heron’s Hill is located at 275 Yorklands Rd, near the intersection of Sheppard and 404. This North York condo was built in 2014 and has suites ranging from 396 to 875 square feet. Amenities include a Gym/Exercise Room, Concierge/Security Guard, Meeting/Function Room, Concierge/Security Guard, Visitor Lounge, Pool, Party Room, Guest Suites, Common Rooftop Deck, Media Room/Cinema and Spa. Emerald City II is located at 66 Forest Manor Rd, near the intersection of Don Mills and Sheppard. This North York condo was built in 2014 and has suites ranging from 539 to 1005 square feet. Amenities include a Gym/Exercise Room, Concierge/Security Guard, Parking Garage, Guest Suites, Meeting/Function Room, FibreStream Internet, Pool, BBQs, Hot Tub/Jacuzzi, Outdoor Patio/Garden, Games/Recreation Room, Common Rooftop Deck, Party Room, Media Room/Cinema, Sauna and Yoga Studio. Emerald City I is located at 70 Forest Manor Rd, near the intersection of Don Mills and Sheppard. This North York condo was built in 2014 and has suites ranging from 522 to 1113 square feet. Amenities include a Gym/Exercise Room, Concierge/Security Guard, Parking Garage, Guest Suites, Media Room/Cinema, FibreStream Internet, Pool, BBQs, Indoor Child Play Area, Meeting/Function Room, Visitor Lounge, Common Rooftop Deck, Party Room, Hot Tub/Jacuzzi, Outdoor Patio/Garden and Games/Recreation Room. 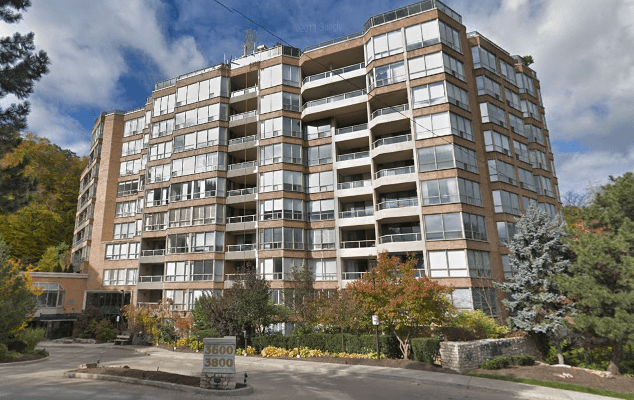 Biaritz Terrace is located at 335 Lonsdale Rd, near the intersection of St Clair and Spadina. This condo was built in 2010 and has suites ranging from 460 to 1324 square feet. 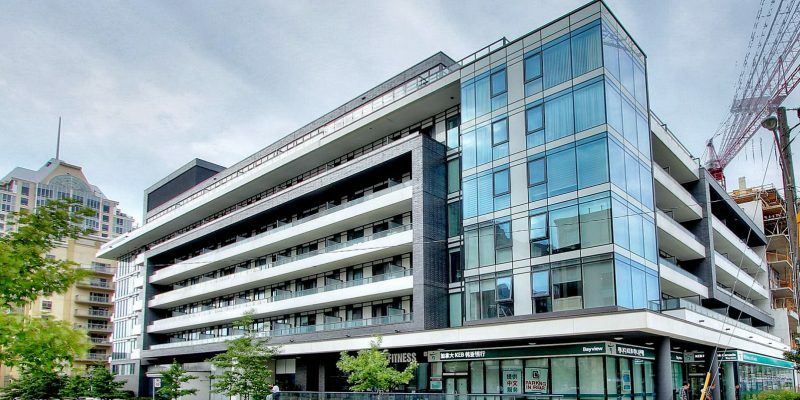 Amenities include a Gym/Exercise Room, Parking Garage, Common Rooftop Deck, BBQs, Concierge/Security Guard, and Car Wash.
Lonsdale House is located at 350 LONSDALE RD, near the intersection of St Clair and Spadina. 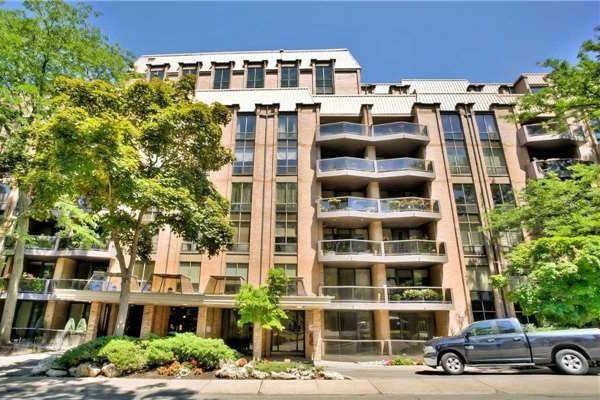 This condo was built in 1974 and has suites ranging from 1012 to 1800 square feet. Amenities include a Gym/Exercise Room, Pool, Sauna, Parking Garage and Concierge/Security Guard. 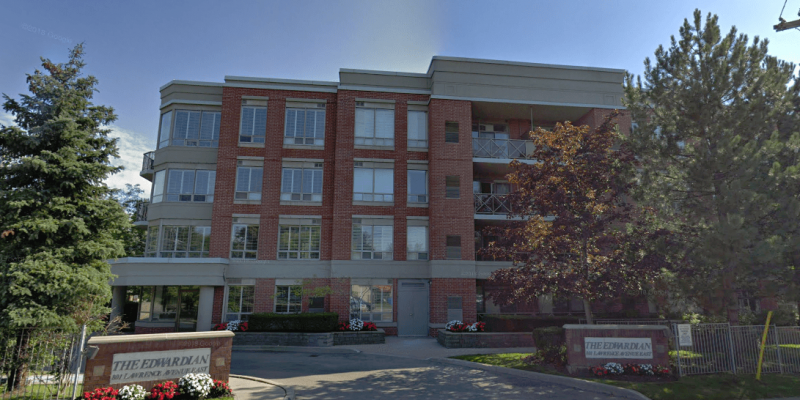 Alto & Parkside at Atria is located at 55 Ann O’Reilly Rd, near the intersection of Victoria Park and Sheppard. This North York condo was built in 2017 and has suites ranging from 499 to 1185 square feet. Amenities include a Gym/Exercise Room, Concierge/Security Guard, BBQs, Meeting/Function Room, Pool, Party Room, Bicycle Parking, Common Rooftop Deck, Parking Garage and Media Room/Cinema. Soul Fairview is located at 150 Fairview Mall Dr, near the intersection of Don Mills and Sheppard. 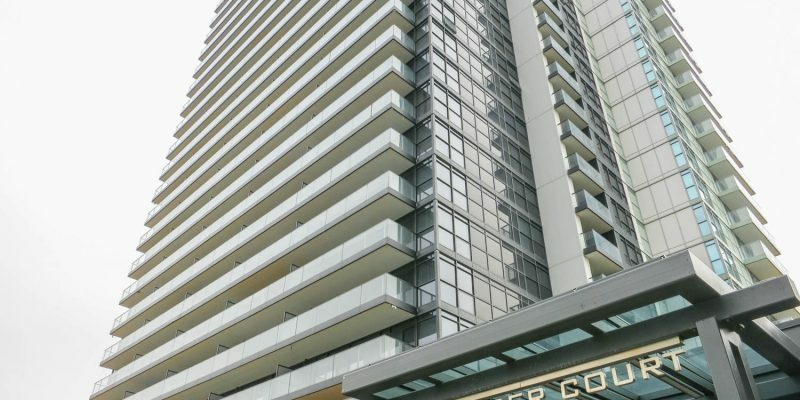 This North York condo was built in 2018 and has suites ranging from 364 to 643 square feet. Amenities include a Gym/Exercise Room, Parking Garage, Meeting/Function Room, Concierge/Security Guard, Guest Suites, Outdoor Patio/Garden, Party Room, Media Room/Cinema and Games/Recreation Room. 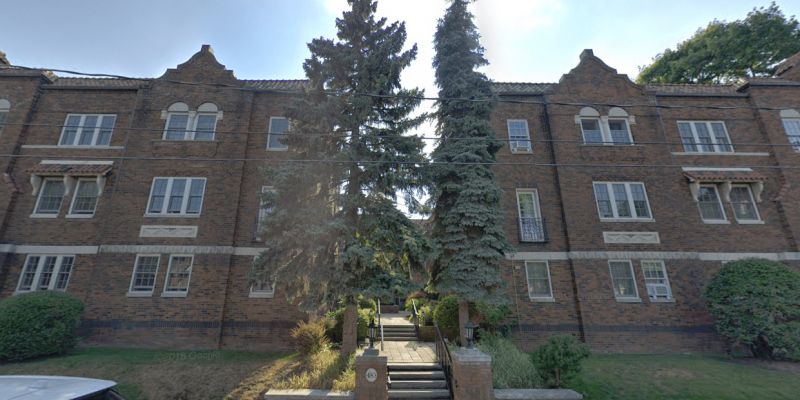 St Gabriel Manor is located at 676 Sheppard Ave E, near the intersection of Bayview and Sheppard. 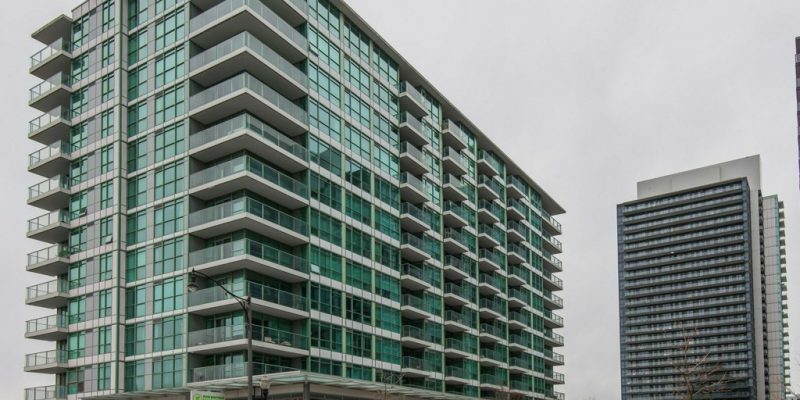 This North York condo was built in 2011 and has suites ranging from 670 to 1155 square feet. Amenities include a Gym/Exercise Room, Meeting/Function Room, Common Rooftop Deck, Outdoor Patio/Garden, Parking Garage and Games/Recreation Room. NY2 is located at 18 Rean Dr, near the intersection of Bayview and Sheppard. This North York condo was built in 2014 and has suites ranging from 372 to 1148 square feet. Amenities include a Gym/Exercise Room, BBQs, Common Rooftop Deck, Party Room, Meeting/Function Room, Games/Recreation Room, Visitor Lounge, Concierge/Security Guard, Parking Garage and Outdoor Patio/Garden. Opus is located at 1001 Sheppard Ave E, near the intersection of Leslie and Sheppard. 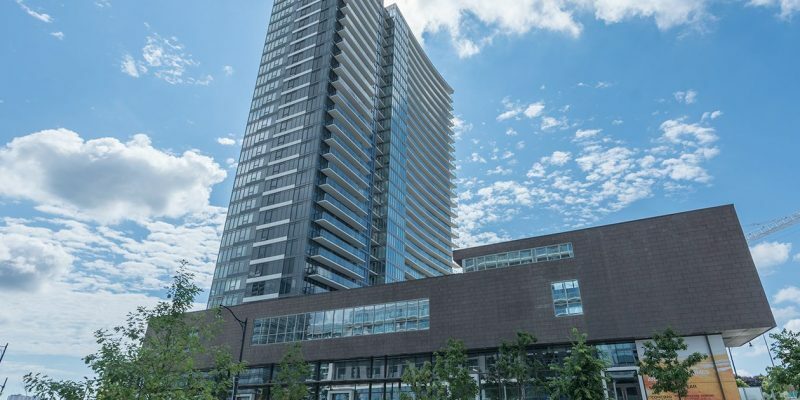 This North York condo was built in 2018 and has suites ranging from 475 to 1068 square feet. Amenities include a Squash/Racquet Court, Tennis Court and Yoga Studio. 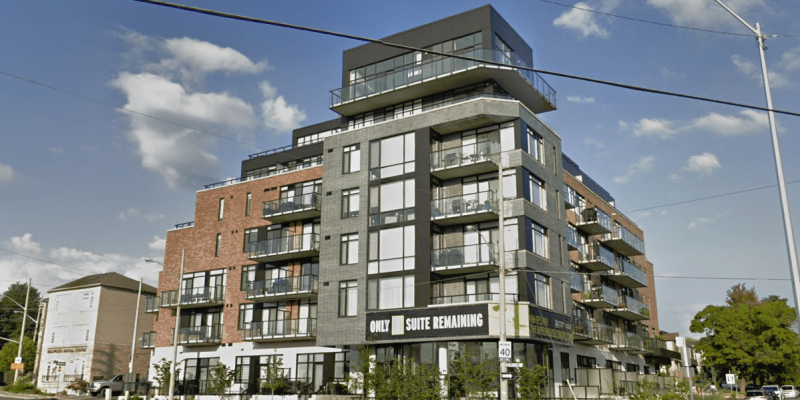 Leslie Boutique Residences is located at 2756 Old Leslie St, near the intersection of Leslie and Sheppard. 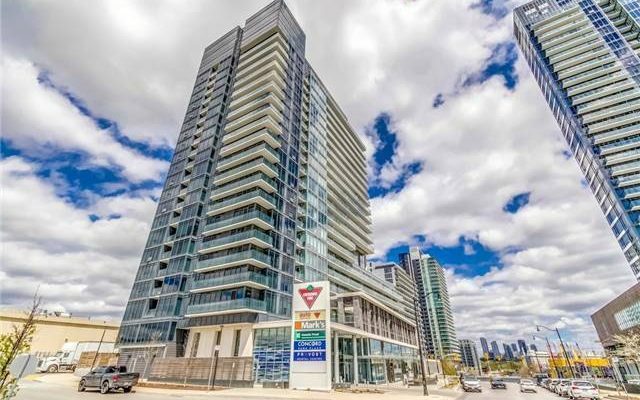 This North York condo was built in and has suites ranging from 503 to 1077 square feet. Amenities include a Gym/Exercise Room, Concierge/Security Guard, Pool, Party Room, Common Rooftop Deck and BBQs. York Mills Place is located at 3900 Yonge St, near the intersection of Yonge and Wilson. This condo was built in 1983 and has suites ranging from 783 to 3067 square feet. Amenities include a Gym/Exercise Room, Concierge/Security Guard, Parking Garage, Meeting/Function Room, Sauna, Visitor Lounge, Pool, Common Rooftop Deck, Party Room, and Hot Tub/Jacuzzi. Ridley Boulevard I is located at 271 Ridley Blvd, near the intersection of Avenue and Wilson. This condo was built in 1989 and has suites ranging from 927 to 1216 square feet. Amenities include a Gym/Exercise Room, Pool, Sauna, Parking Garage, and Concierge/Security Guard. Ridley Boulevard II is located at 268 Ridley Blvd, near the intersection of Avenue and Wilson. This condo was built in 1990 and has suites ranging from 767 to 1825 square feet. Amenities include a Gym/Exercise Room, Pool, Sauna, Parking Garage, and Concierge/Security Guard. One Glen Park is located at 1 Glen Park Ave, near the intersection of Bathurst and Lawrence. This condo was built in 2003 and has suites ranging from 450 to 3190 square feet. Amenities include a Gym/Exercise Room, Concierge/Security Guard, Sauna, Pool, Meeting/Function Room, Party Room, and Parking Garage. Crystal Towers is located at 2 Covington Rd, near the intersection of Bathurst and Lawrence. This condo was built in 1997 and has suites ranging from 555 to 1646 square feet. Amenities include a Gym/Exercise Room, Parking Garage, Pool, Sauna, and Concierge/Security Guard. Encore at Crystal Towers is located at 8 Covington Rd, near the intersection of Bathurst and Lawrence. This condo was built in 2000 and has suites ranging from 728 to 2098 square feet. Amenities include a Gym/Exercise Room, Parking Garage, Concierge/Security Guard, Pool, Party Room, Guest Suites, Meeting/Function Room, and Sauna. Quantum South Tower is located at 2181 Yonge St, near the intersection of Yonge and Eglinton. This condo was built in 2007 and has suites ranging from 570 to 3668 square feet. Amenities include a Gym/Exercise Room, Party Room, Meeting/Function Room, Sauna, Pool, Business Centre, Parking Garage, Concierge/Security Guard, and Guest Suites. Quantum North Tower is located at 2191 Yonge St, near the intersection of Yonge and Eglinton. This condo was built in 2008 and has suites ranging from 631 to 4171 square feet. Amenities include a Gym/Exercise Room, Party Room, Guest Suites, Pool, Parking Garage, Meeting/Function Room, Sauna, Concierge/Security Guard, and Business Centre. 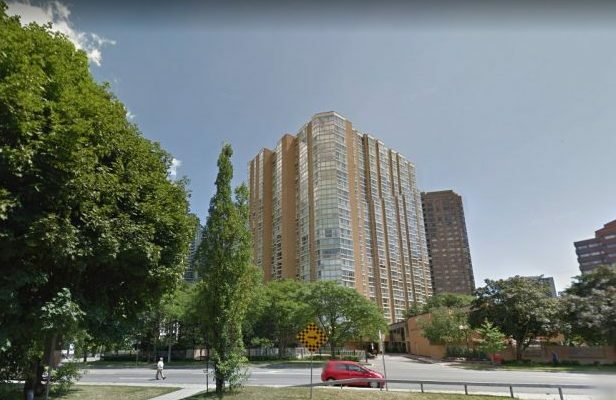 The Movado is located at 2 Edith Dr, near the intersection of Yonge and Eglinton. This condo was built in 2002 and has suites ranging from 599 to 1725 square feet. Amenities include a Gym/Exercise Room, Party Room, Meeting/Function Room, Concierge/Security Guard, and Parking Garage. The Forest Hill is located at 500 St Clair Ave W, near the intersection of Bathurst and St Clair. This condo was built in 2010 and has suites ranging from 566 to 1382 square feet. Amenities include a Gym/Exercise Room, Concierge/Security Guard, Guest Suites, Parking Garage, Pool, Party Room, Media Room/Cinema, Common Rooftop Deck, Meeting/Function Room, and Sauna. 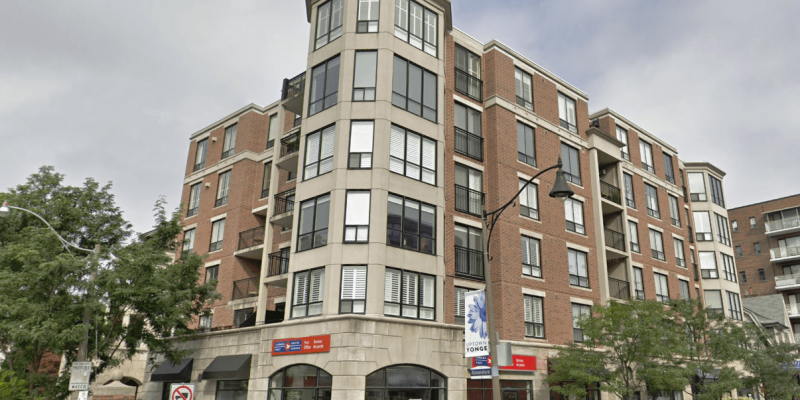 Village Terraces is located at 260 HEATH ST W, near the intersection of St Clair and Spadina. This condo was built in 1981 and has suites ranging from 751 to 1972 square feet. Amenities include a Gym/Exercise Room, Concierge/Security Guard, Sauna, Pool, and Parking Garage. 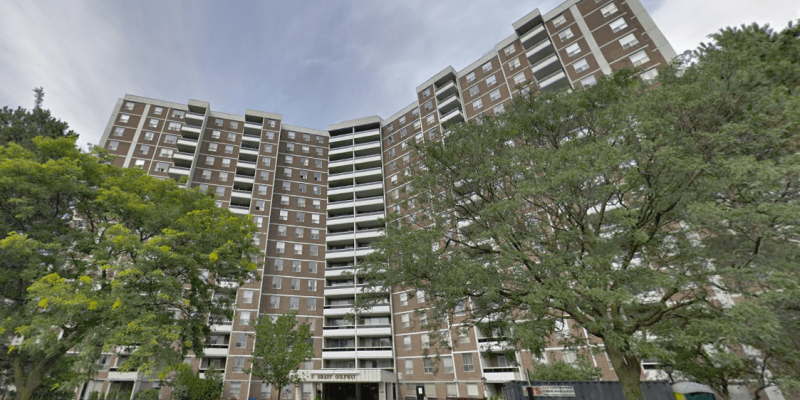 Village Park is located at 240 Heath St W, near the intersection of St Clair and Spadina. 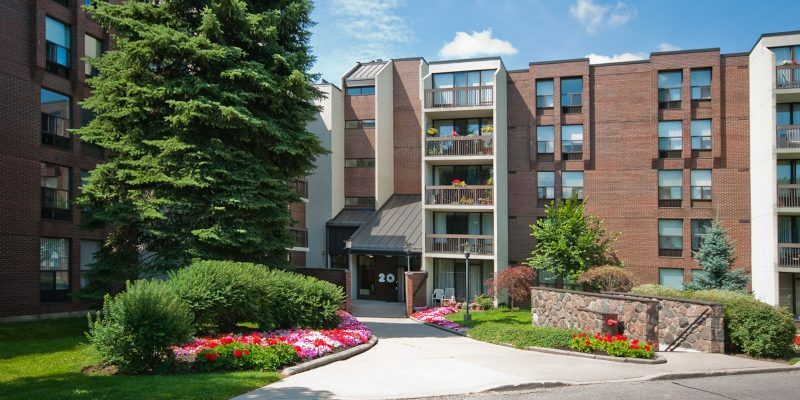 This condo was built in 1980 and has suites ranging from 1744 to 1745 square feet. Amenities include a Gym/Exercise Room, Parking Garage, Concierge/Security Guard, Pool, and Sauna. Tango is located at 121 McMahon Dr, near the intersection of Leslie and Sheppard. This North York condo was built in 2015 and has suites ranging from 369 to 2330 square feet. Amenities include a Gym/Exercise Room, Concierge/Security Guard, BBQs, Meeting/Function Room, Pool, Party Room, Guest Suites, Outdoor Patio/Garden, Games/Recreation Room, Common Rooftop Deck, Parking Garage and Media Room/Cinema. Tango 2 is located at 72 Esther Shiner Blvd, near the intersection of Leslie and Sheppard. This North York condo was built in 2015 and has suites ranging from 361 to 995 square feet. Amenities include a Gym/Exercise Room, Party Room, Outdoor Patio/Garden, Games/Recreation Room, Visitor Lounge, Common Rooftop Deck, Guest Suites, Parking Garage, Concierge/Security Guard, FibreStream Internet, BBQs and Meeting/Function Room. 80 ANTIBES DR is located near the intersection of Bathurst and Finch. 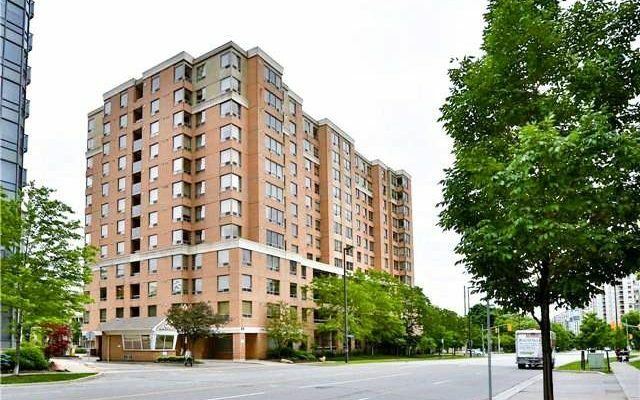 This North York condo was built in 1987 and has suites ranging from 1213 to 1388 square feet. Amenities include a Gym/Exercise Room, Meeting/Function Room, Sauna, Tennis Court, Pool, Parking Garage, Concierge/Security Guard and Party Room. 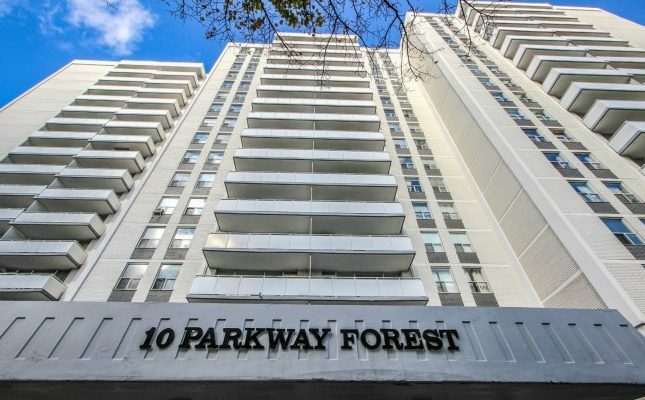 10 PARKWAY FOREST DR is located near the intersection of Don Mills and Sheppard. 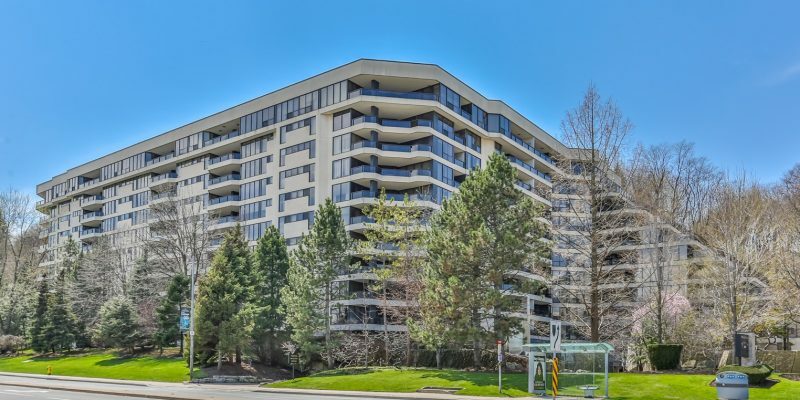 This North York condo was built in 1977 and has suites ranging from 865 to 1250 square feet. Amenities include a Gym/Exercise Room, Tennis Court, Pool, Sauna and Parking Garage. 5 OLD SHEPPARD AVE is located near the intersection of the 404 and Sheppard. 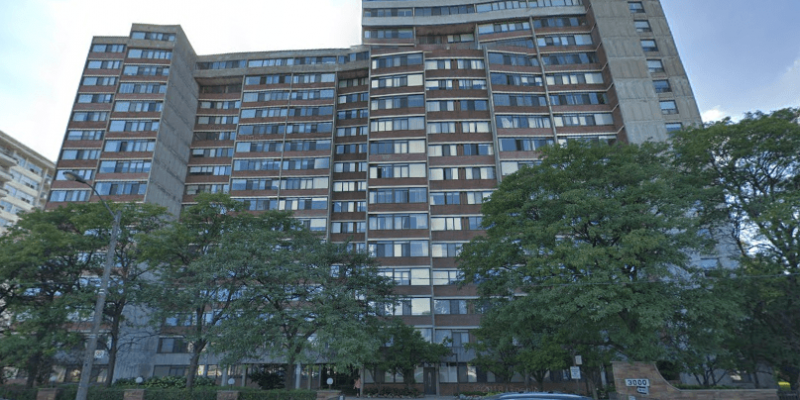 This North York condo was built in 1974 and has suites ranging from 749 to 1150 square feet. Amenities include a Gym/Exercise Room, Parking Garage, Pool, Sauna, Tennis Court and Concierge/Security Guard. 135 ANTIBES DR is located near the intersection of Bathurst and Finch. 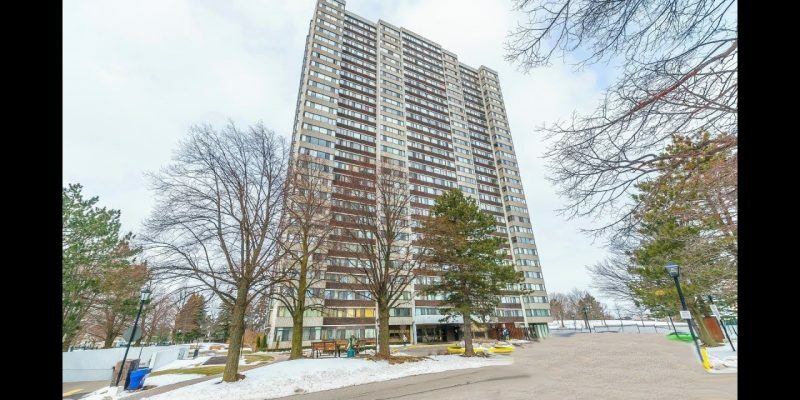 This North York condo was built in 1972 and has suites ranging from 823 to 2749 square feet. Amenities include a Gym/Exercise Room, Parking Garage and Sauna. 115 ANTIBES DR is located near the intersection of Bathurst and Finch. 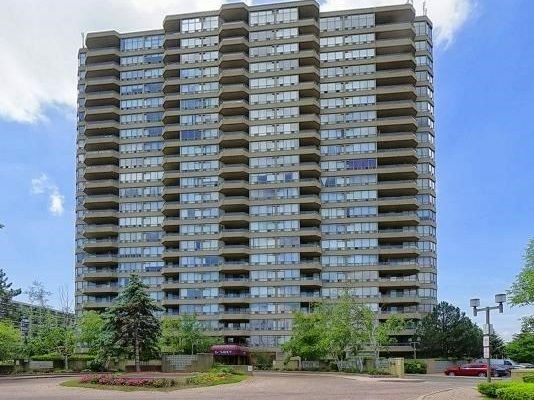 This North York condo was built in 1972 and has suites ranging from 823 to 2749 square feet. Amenities include a Gym/Exercise Room, Parking Garage and Sauna. 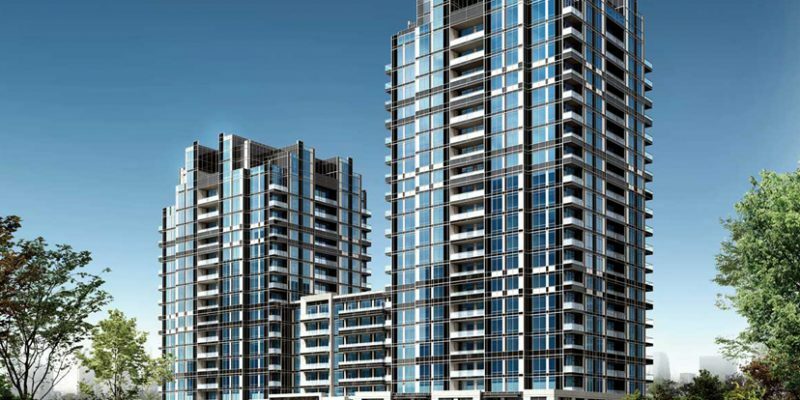 The Palm Residences is located at 5740 Yonge St, near the intersection of Yonge and Finch. This North York condo was built in 2013 and has suites ranging from 549 to 1721 square feet. Amenities include a Gym/Exercise Room, Concierge/Security Guard, Parking Garage, Meeting/Function Room, Games/Recreation Room, Pool, BBQs, Internet, Outdoor Patio/Garden, Sauna, Visitor Lounge, Common Rooftop Deck, Party Room, Business Centre, Media Room/Cinema. The Monarchy is located at 205 HILDA AVE, near the intersection of Yonge and Steeles. 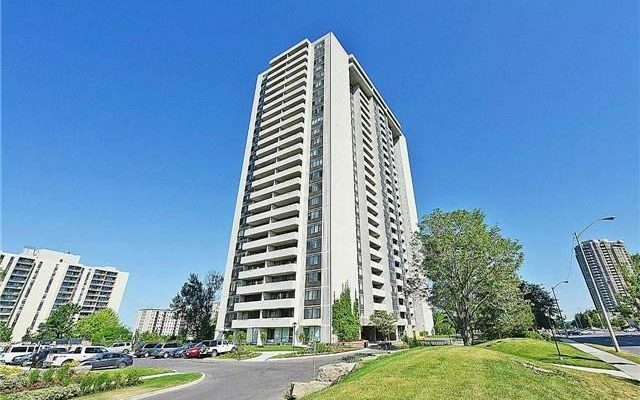 This North York condo was built in 1975 and has suites ranging from 926 to 1459 square feet. Amenities include a Gym/Exercise Room, Pool, Sauna, Tennis Court, Parking Garage and Concierge/Security Guard. The Courtlands is located at 1201 STEELES AVE W, near the intersection of Bathurst and Steeles. 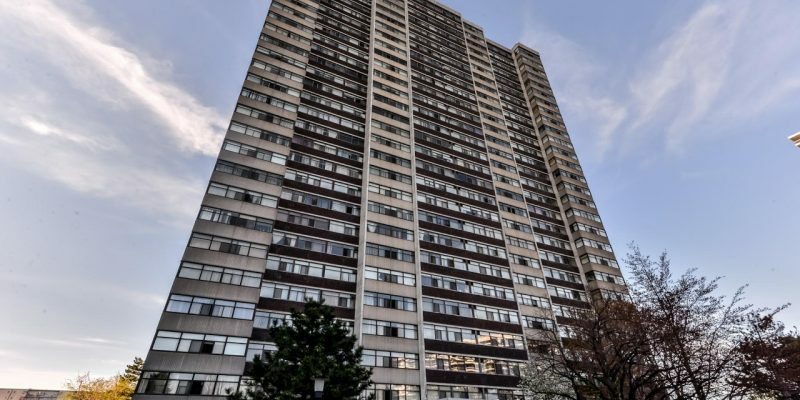 This North York condo was built in 1976 and has suites ranging from 724 to 1370 square feet. Amenities include a Pool, Meeting/Function Room, Concierge/Security Guard, Party Room, Games/Recreation Room, Parking Garage, Sauna and Tennis Court. The Courtlands II is located at 90 FISHERVILLE RD, near the intersection of Bathurst and Steeles. 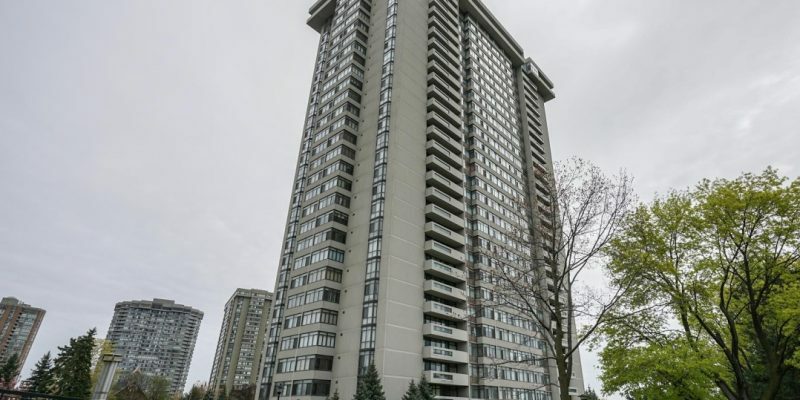 This North York condo was built in 1978 and has suites ranging from 697 to 2072 square feet. Amenities include a Pool, Meeting/Function Room, Sauna, Tennis Court, Party Room, Parking Garage and Concierge/Security Guard. 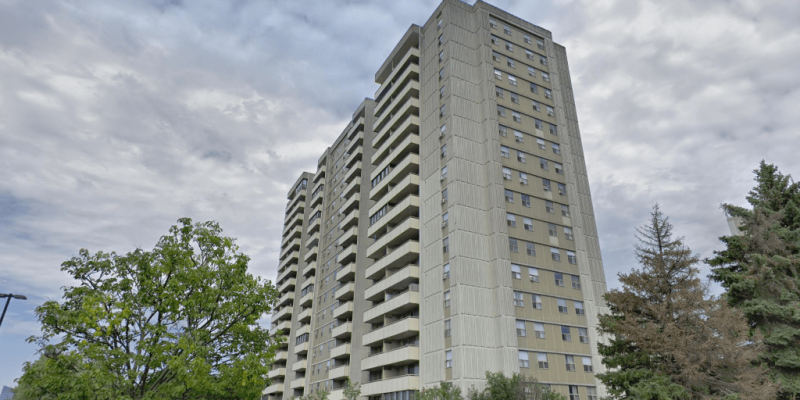 Sovereign Court is located at 1111 STEELES AVE W, near the intersection of Bathurst and Steeles. 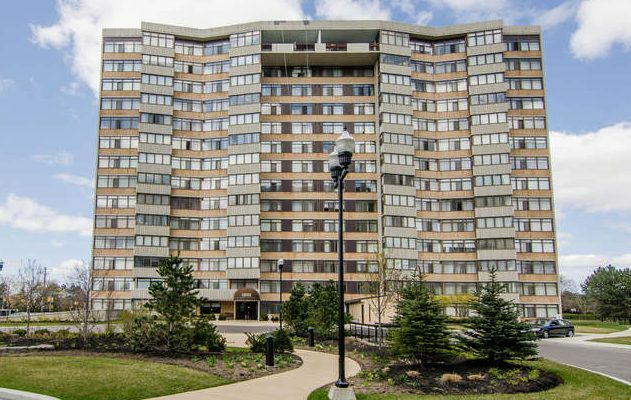 This North York condo was built in 1979 and has suites ranging from 570 to 1076 square feet. Monthly maintenance fees include Air Conditioning, Hydro, Water, Common Element Maintenance, Building Insurance, Heat and Parking. Skymark II is located at 1555 FINCH AVE E, near the intersection of Don Mills and Finch. 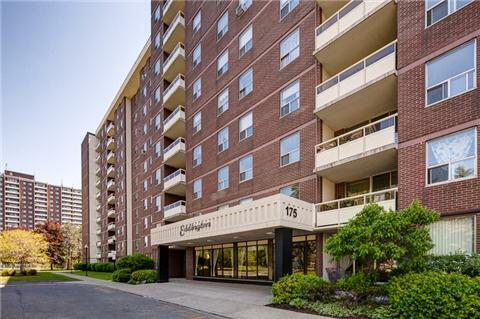 This North York condo was built in 1979 and has suites ranging from 883 to 3059 square feet. Amenities include a Gym/Exercise Room, Meeting/Function Room, Concierge/Security Guard, Pool, Party Room and Games/Recreation Room. 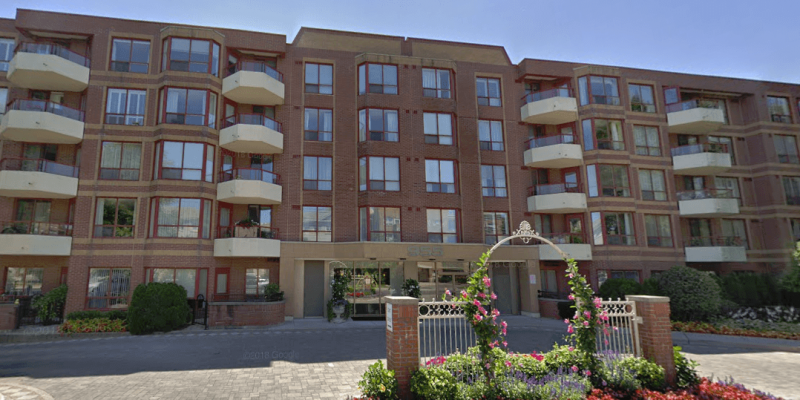 NY Place is located at 17 Kenaston Gdns, near the intersection of Bayview and Sheppard. This North York condo was built in 2012 and has suites ranging from 475 to 866 square feet. Amenities include a Gym/Exercise Room, Guest Suites, Parking Garage, Party Room, Media Room/Cinema and Meeting/Function Room. High Point is located at 3300 DON MILLS RD, near the intersection of Don Mills and Finch. 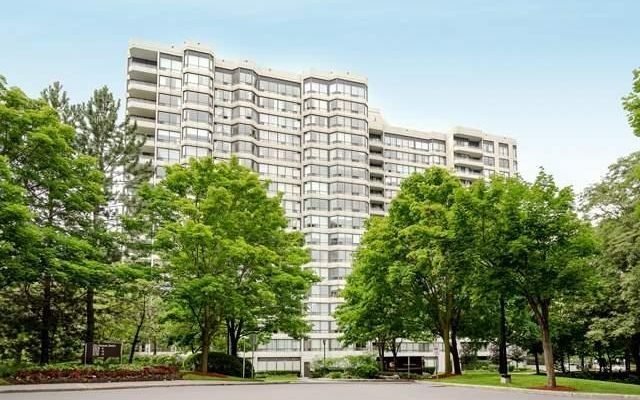 This North York condo was built in 1978 and has suites ranging from 758 to 1328 square feet. Amenities include a Gym/Exercise Room, Parking Garage, Sauna, Tennis Court, Pool, Concierge/Security Guard, Party Room and Games/Recreation Room. 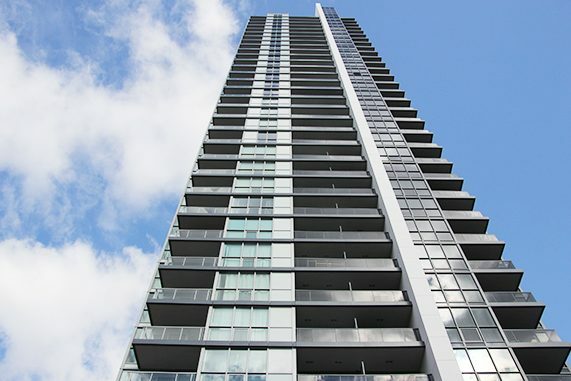 Emerald Park – West Tower is located at 11 Bogert Ave, near the intersection of Yonge and Sheppard. This North York condo was built in 2015 and has suites ranging from 579 to 1957 square feet. Amenities include a Gym/Exercise Room, Concierge/Security Guard, Guest Suites, Pool, Party Room, Hot Tub/Jacuzzi, Games/Recreation Room, Common Rooftop Deck, Outdoor Patio/Garden and Sauna. 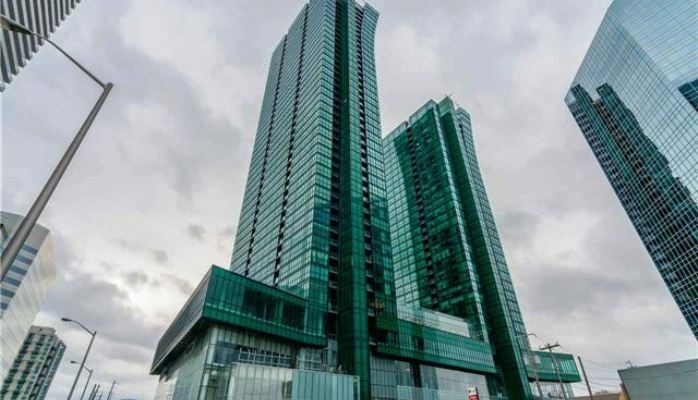 Emerald Park – East Tower is located at 9 Bogert Ave, near the intersection of Yonge and Sheppard. This North York condo was built in 2015 and has suites ranging from 579 to 1957 square feet. Amenities include a Gym/Exercise Room, Concierge/Security Guard, Guest Suites, Pool, Party Room, Hot Tub/Jacuzzi, Games/Recreation Room, Common Rooftop Deck, Outdoor Patio/Garden and Sauna. 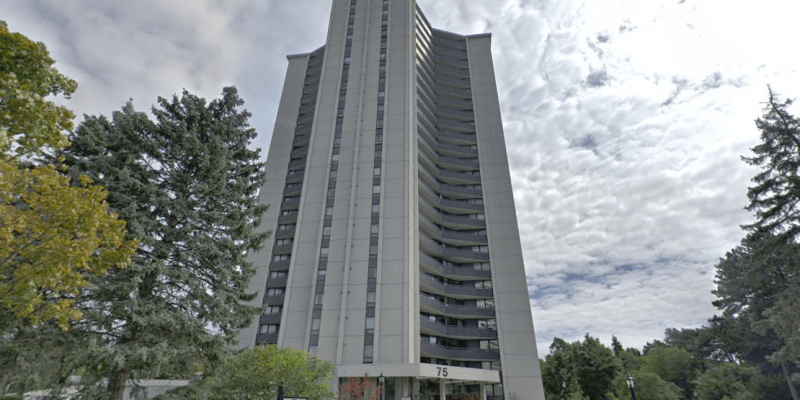 Eddington is located at 175 HILDA AVE, near the intersection of Yonge and Steeles. 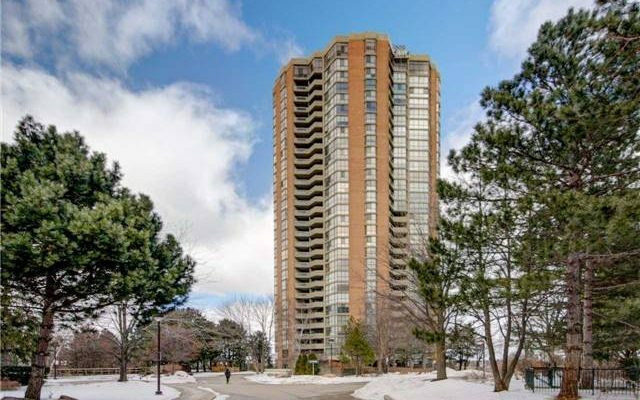 This North York condo was built in 1973 and has suites ranging from 860 to 938 square feet. Amenities include a Gym/Exercise Room, Pool, Sauna, Tennis Court, Parking Garage and Concierge/Security Guard. Discovery is located at 33 Singer Crt, near the intersection of Leslie and Sheppard. This North York condo was built in 2012 and has suites ranging from 445 to 1721 square feet. Amenities include a Gym/Exercise Room, Party Room, Meeting/Function Room, Concierge/Security Guard, Pool, Parking Garage and Guest Suites. Discovery is located at 29 Singer Crt, near the intersection of Leslie and Sheppard. This North York condo was built in 2012 and has suites ranging from 445 to 1721 square feet. Amenities include a Gym/Exercise Room, Party Room, Meeting/Function Room, Concierge/Security Guard, Pool, Parking Garage and Guest Suites. Discovery is located at 19 Singer Crt, near the intersection of Leslie and Sheppard. This North York condo was built in 2012 and has suites ranging from 445 to 1721 square feet. Amenities include a Gym/Exercise Room, Party Room, Meeting/Function Room, Concierge/Security Guard, Pool, Parking Garage and Guest Suites. Discovery is located at 15 Singer Crt, near the intersection of Leslie and Sheppard. This North York condo was built in 2012 and has suites ranging from 445 to 1721 square feet. Amenities include a Gym/Exercise Room, Party Room, Meeting/Function Room, Concierge/Security Guard, Pool, Parking Garage and Guest Suites. Crestview Place is located at 350 SENECA HILL DR, near the intersection of Don Mills and Finch. 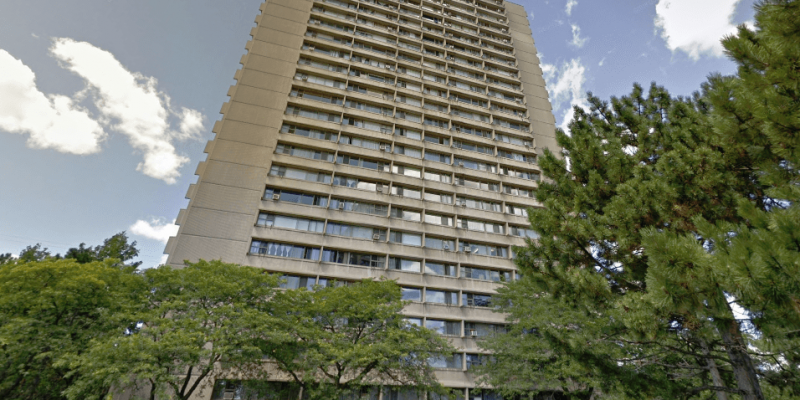 This North York condo was built in 1975 and has suites ranging from 656 to 1161 square feet. Amenities include a Gym/Exercise Room, Parking Garage, Sauna, Tennis Court, Pool, Meeting/Function Room, Party Room, Games/Recreation Room and Squash/Racquet Court. 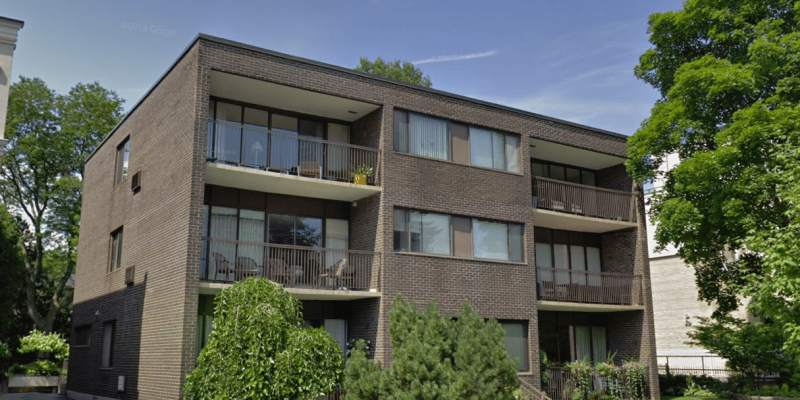 Crestview Place is located at 260 SENECA HILL DR, near the intersection of Don Mills and Finch. 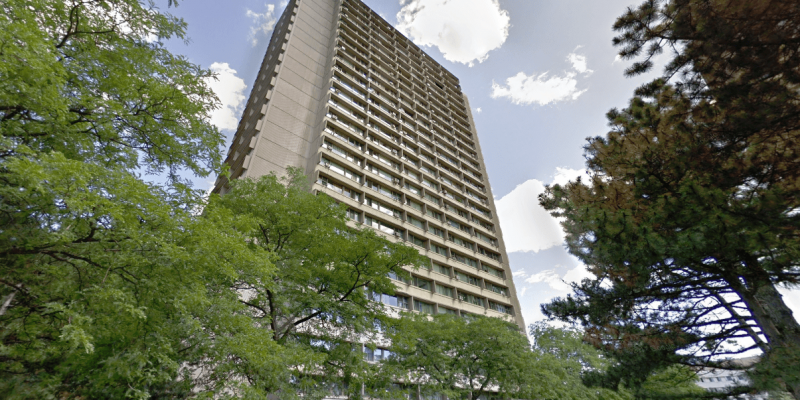 This North York condo was built in 1975 and has suites ranging from 656 to 1161 square feet. Amenities include a Gym/Exercise Room, Parking Garage, Sauna, Tennis Court, Pool, Meeting/Function Room, Party Room, Games/Recreation Room and Squash/Racquet Court. Crestview Place is located at 177 LINUS RD, near the intersection of Don Mills and Finch. 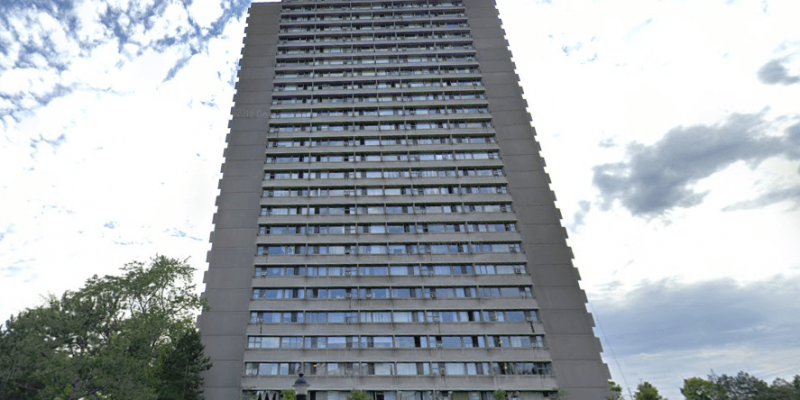 This North York condo was built in 1975 and has suites ranging from 656 to 1161 square feet. Amenities include a Gym/Exercise Room, Parking Garage, Sauna, Tennis Court, Pool, Meeting/Function Room, Party Room, Games/Recreation Room and Squash/Racquet Court. 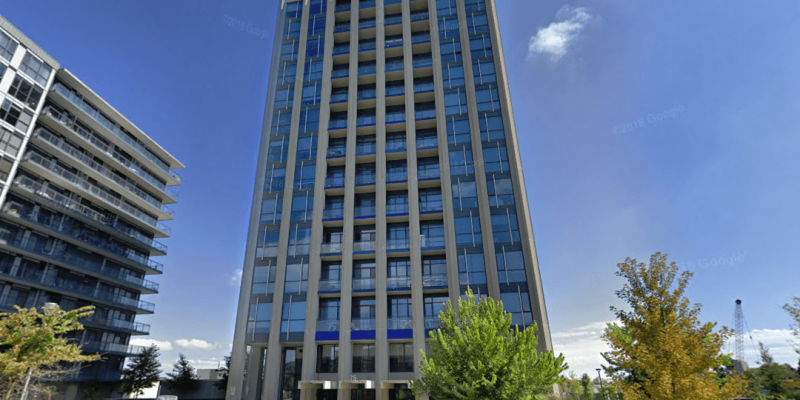 Carrington Tower is located at 10 TANGREEN CRT, near the intersection of Yonge and Steeles. 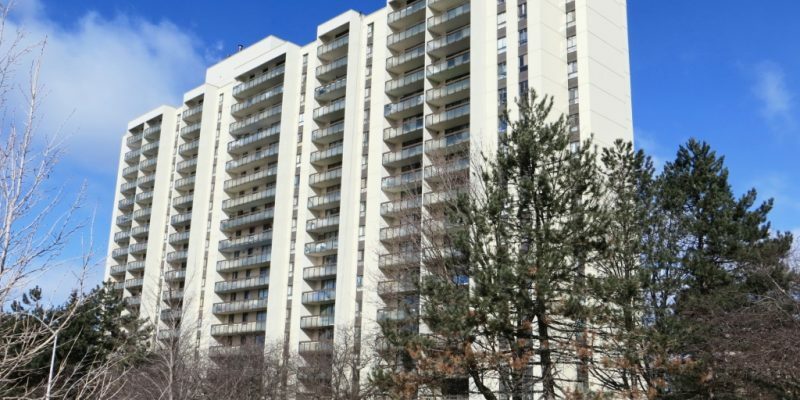 This North York condo was built in 1977 and has suites ranging from 1065 to 1200 square feet. Amenities include a Gym/Exercise Room, Pool, Sauna, Tennis Court, Parking Garage and Concierge/Security Guard. 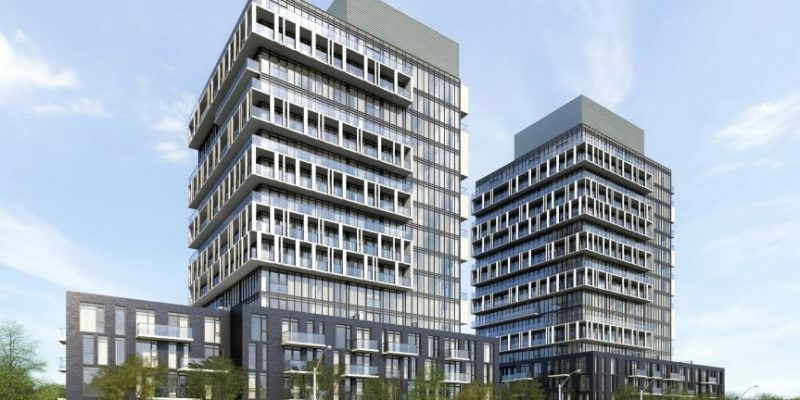 Merci Condos is located at 27 REAN DR, near the intersection of Bayview and Sheppard. 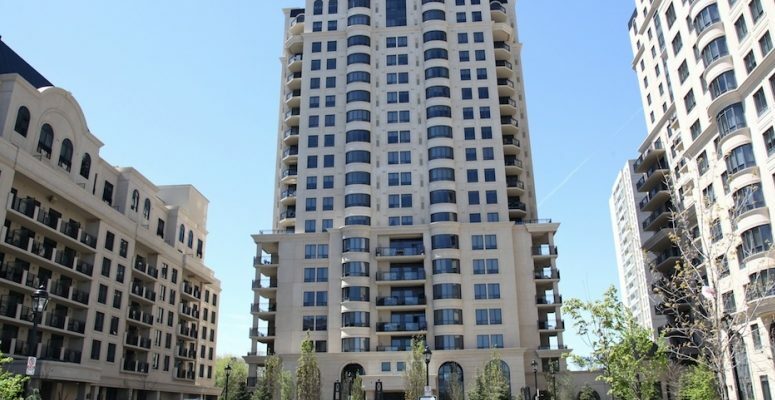 This North York condo was built in 2009 and has suites ranging from 350 to 1034 square feet. Amenities include a Gym/Exercise Room, Party Room, Parking Garage, Common Rooftop Deck, Concierge/Security Guard and Meeting/Function Room. Pulse II is located at 5508 YONGE ST, near the intersection of Yonge and Finch. 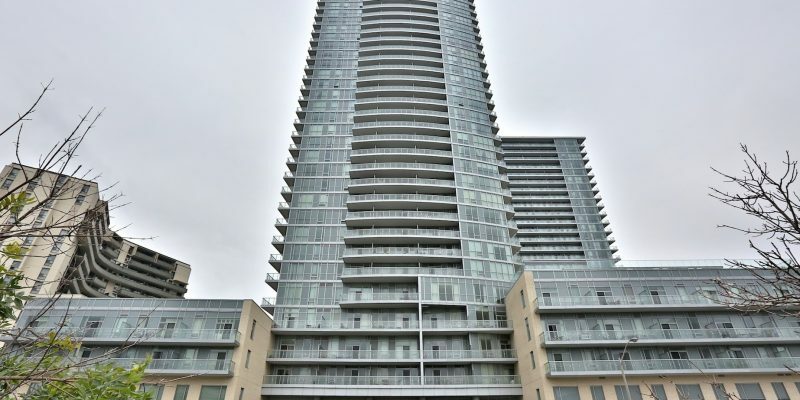 This North York condo was built in 2009 and has suites ranging from 530 to 1520 square feet. Amenities include a Gym/Exercise Room, Parking Garage, Meeting/Function Room, Concierge/Security Guard, Guest Suites, Party Room and Media Room/Cinema. 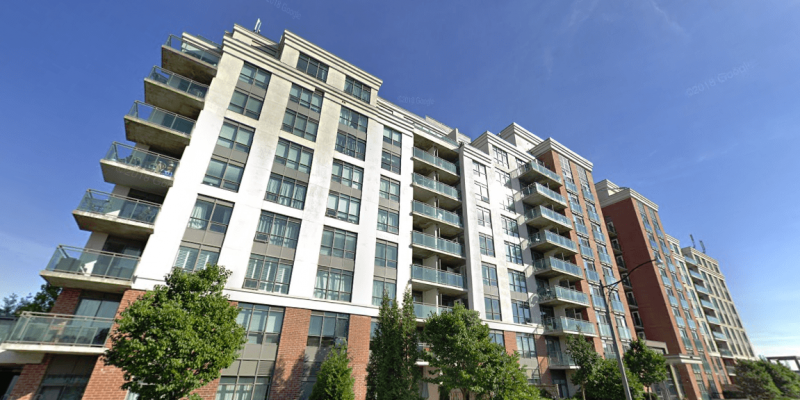 St. Gabriel Terraces is located at 650 SHEPPARD AVE, near the intersection of Bayview and Sheppard. 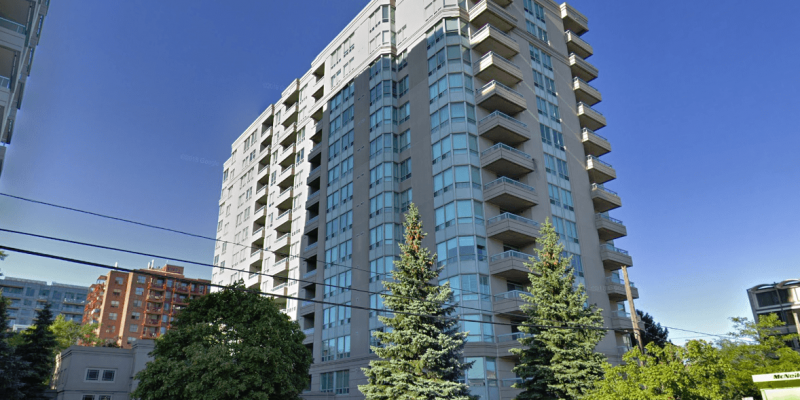 This North York condo was built in 2009 and has suites ranging from 430 to 1350 square feet. Amenities include a Gym/Exercise Room, Concierge/Security Guard, Meeting/Function Room, Party Room, Common Rooftop Deck and Sauna. Pulse is located at 5500 YONGE ST, near the intersection of Yonge and Finch. 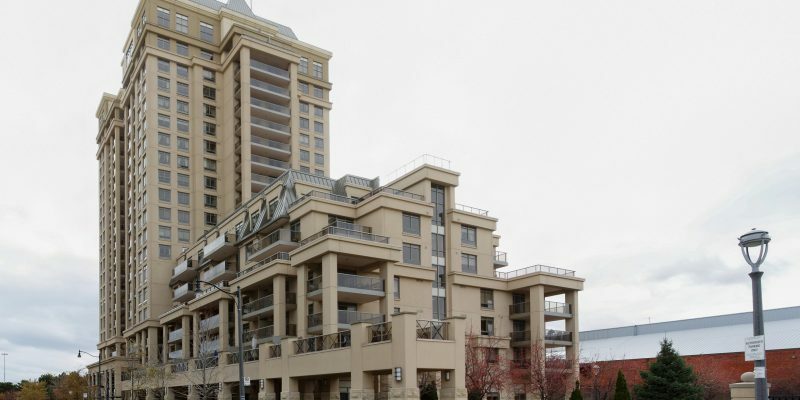 This North York condo was built in 2009 and has suites ranging from 530 to 950 square feet. Amenities include a Gym/Exercise Room, Party Room, Meeting/Function Room, Concierge/Security Guard, Parking Garage and Guest Suites. 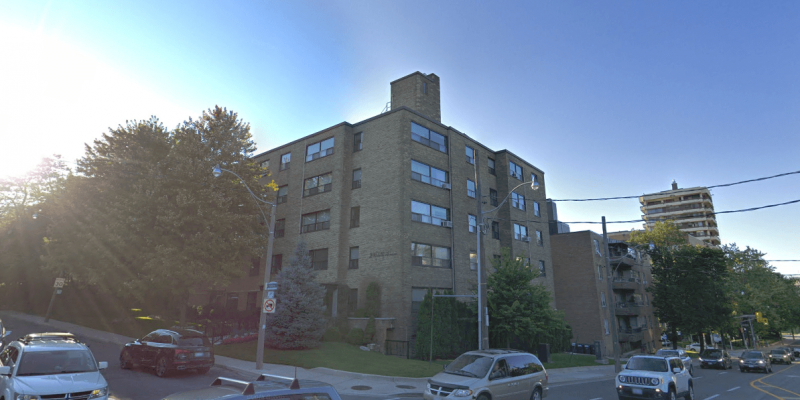 St. Gabriel Village is located at 662 SHEPPARD AVE, near the intersection of Bayview and Sheppard. 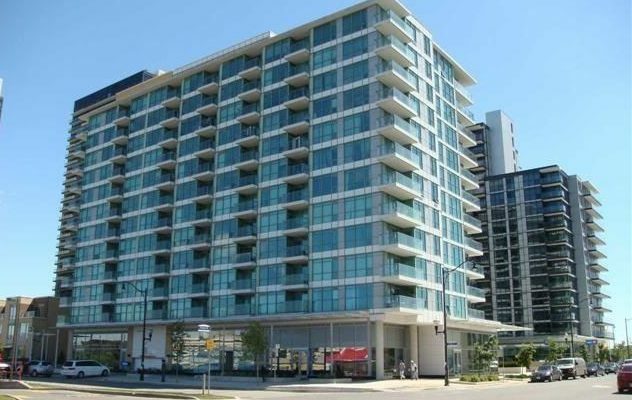 This North York condo was built in 2009 and has suites ranging from 1010 to 4330 square feet. Amenities include a Gym/Exercise Room, Party Room, Guest Suites, Pool, Parking Garage, Meeting/Function Room, Concierge/Security Guard, BBQs. St. Gabriel Village is located at 660 SHEPPARD AVE, near the intersection of Bayview and Sheppard. 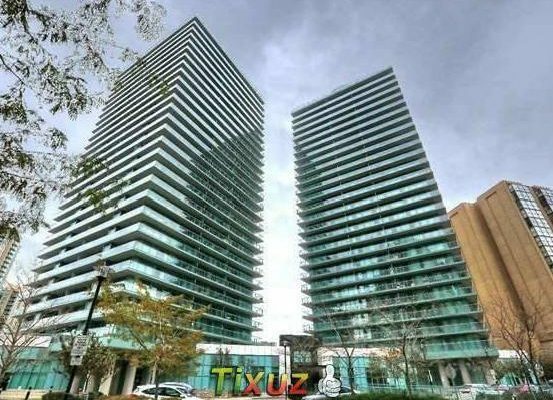 This North York condo was built in 2009 and has suites ranging from 1010 to 4330 square feet. Amenities include a Gym/Exercise Room, Party Room, Guest Suites, Pool, Parking Garage, Meeting/Function Room, Concierge/Security Guard and BBQs. 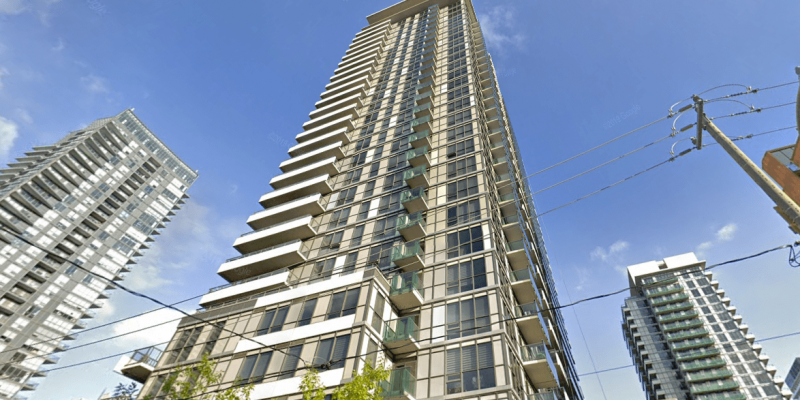 Meridian II is located at 25 GREENVIEW AVE, near the intersection of Yonge and Finch. 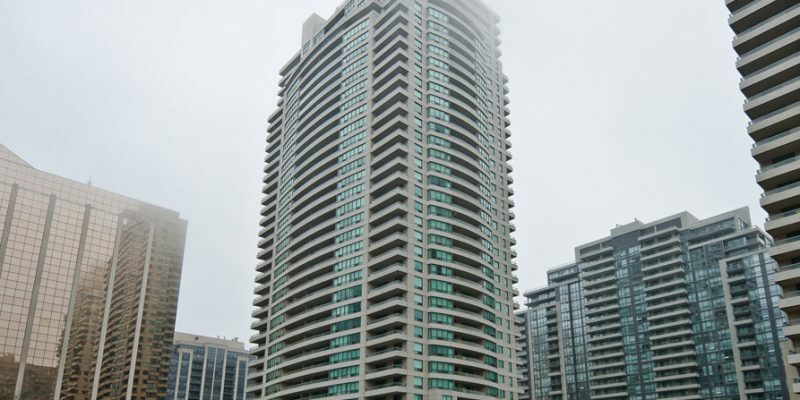 This North York condo was built in 2008 and has suites ranging from 591 to 1638 square feet. Amenities include a Gym/Exercise Room, Party Room, Meeting/Function Room, Sauna, Pool, Parking Garage, Concierge/Security Guard and Guest Suites. 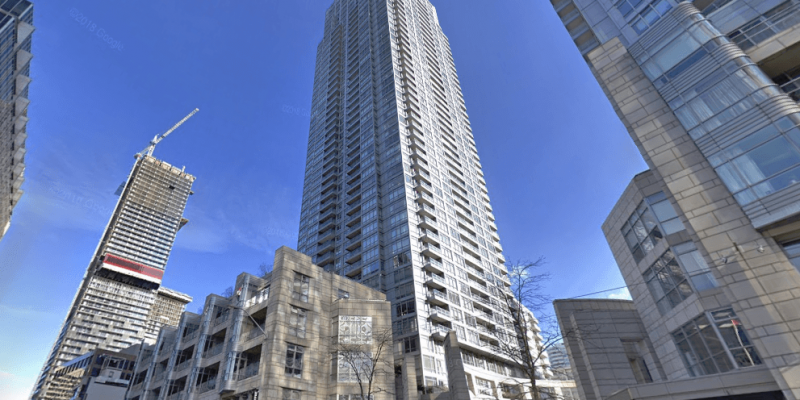 Dia Condominiums is located at 30 CANTERBURY PL, near the intersection of Yonge and Finch. 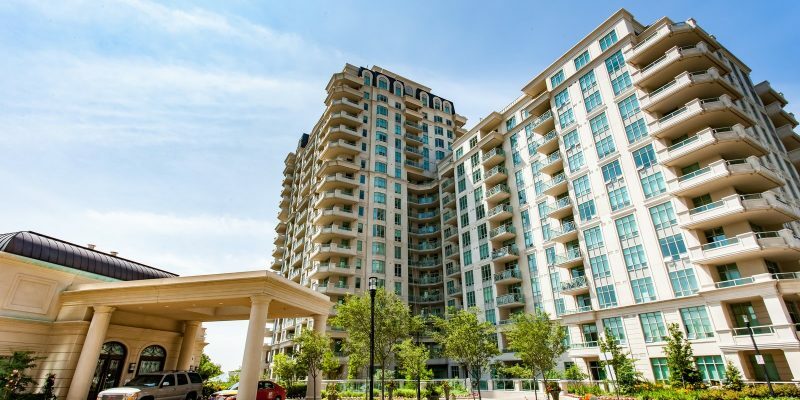 This North York condo was built in 2008 and has suites ranging from 489 to 2594 square feet. Amenities include a Gym/Exercise Room, Parking Garage, Meeting/Function Room, Sauna, Concierge/Security Guard BBQs, Party Room and Guest Suites. The Continental is located at 509 BEECROFT RD, near the intersection of Yonge and Finch. 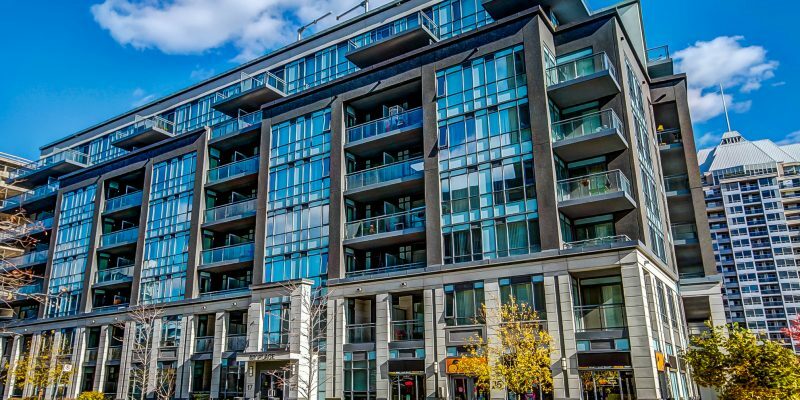 This North York condo was built in 2007 and has suites ranging from 507 to 1301 square feet. Amenities include a Gym/Exercise Room, Party Room, Meeting/Function Room, Sauna, Pool, Parking Garage, Concierge/Security Guard and Guest Suites. 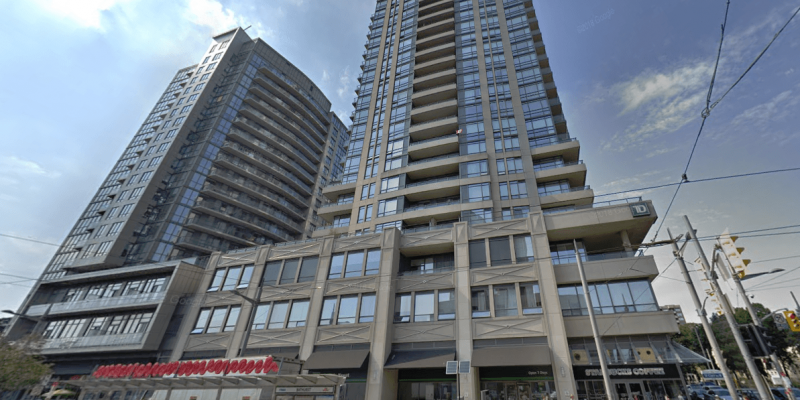 Meridian is located at 15 GREENVIEW AVE, near the intersection of Yonge and Finch. 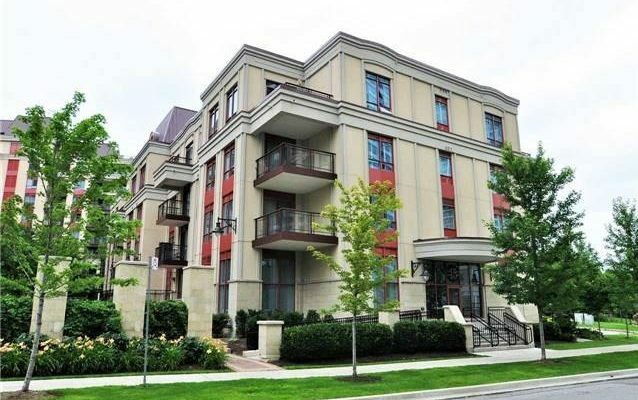 This North York condo was built in 2007 and has suites ranging from 535 to 1927 square feet. Amenities include a Gym/Exercise Room, Party Room, Meeting/Function Room, Sauna, Pool, Parking Garage, Concierge/Security Guard and Guest Suites . Claridges is located at 12 REAN DR, near the intersection of Bayview and Sheppard. 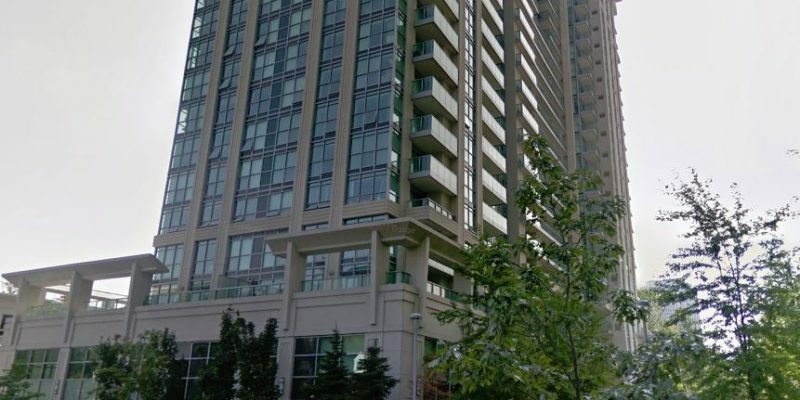 This North York condo was built in 2007 and has suites ranging from 449 to 3136 square feet. Amenities include a Gym/Exercise Room, Party Room, Meeting/Function Room, Pool and Parking Garage. Rockefeller on Bayview is located at 18 KENASTON GDNS, near the intersection of Bayview and Sheppard. 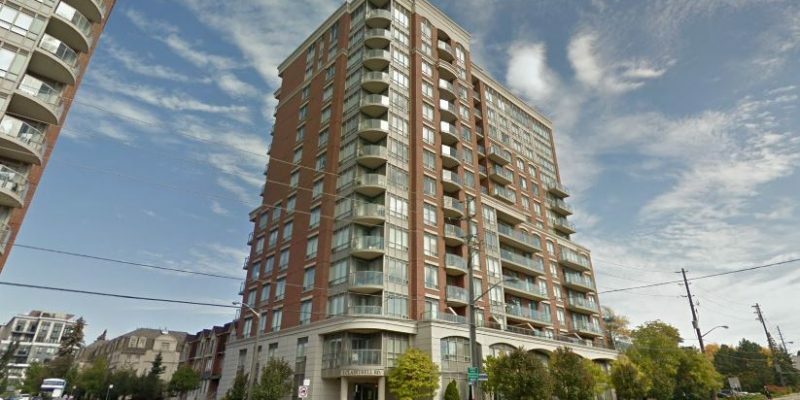 This North York condo was built in 2006 and has suites ranging from 529 to 1280 square feet. Amenities include a Gym/Exercise Room, Parking Garage, Concierge/Security Guard, Pool, Party Room, Media Room/Cinema, Meeting/Function Room, Sauna and FibreStream Internet. 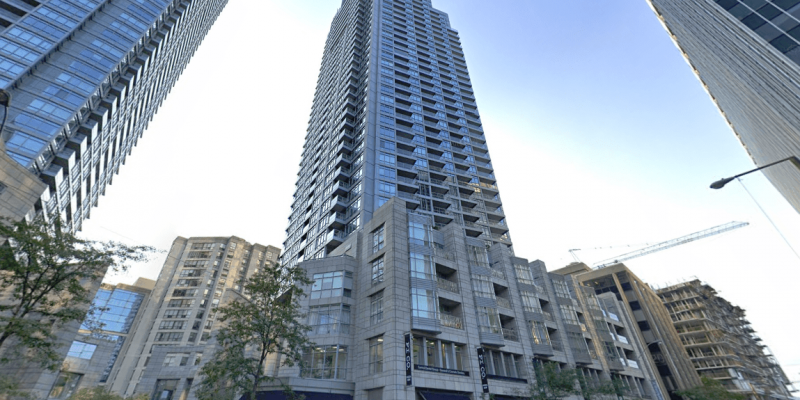 Ultima at Broadway North Tower is located at 4978 YONGE ST, near the intersection of Yonge and Sheppard. 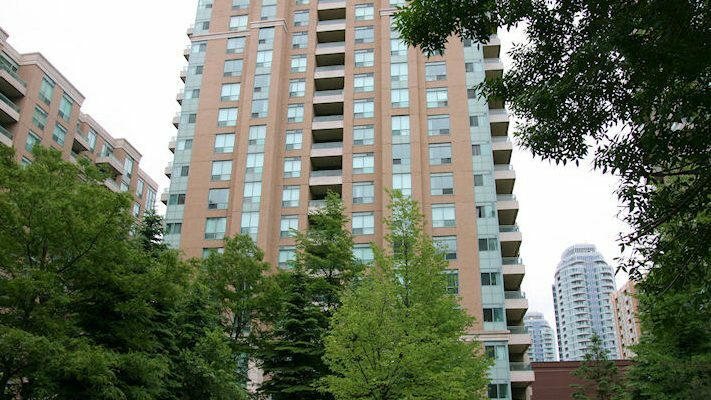 This North York condo was built in 2005 and has suites ranging from 500 to 2002 square feet. Amenities include a Gym/Exercise Room, Parking Garage, Concierge/Security Guard, Pool, Party Room, Guest Suites, Meeting/Function Room and Sauna. Kenaston Gardens is located at 17 BARBERRY PL, near the intersection of Bayview and Sheppard. 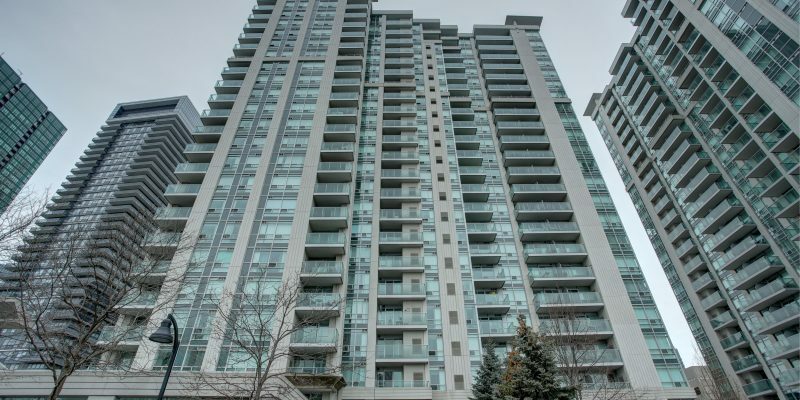 This North York condo was built in 2005 and has suites ranging from 511 to 1748 square feet. Amenities include a Gym/Exercise Room, Parking Garage, Concierge/Security Guard, Pool, Party Room, Guest Suites, Meeting/Function Room and Sauna. 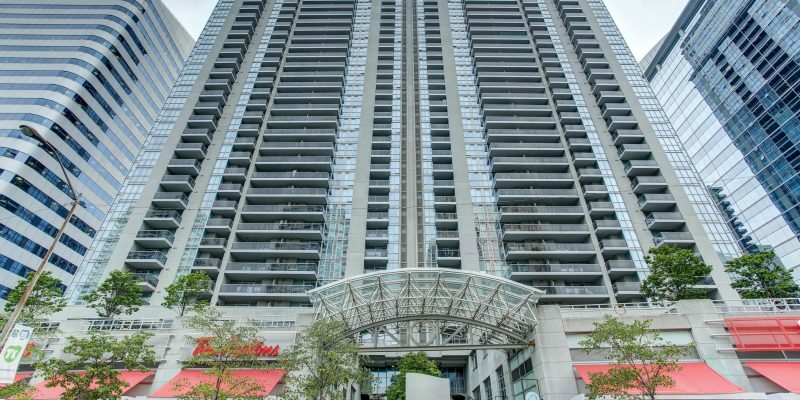 Marquis at Northtown is located at 8 MCKEE AVE, near the intersection of Yonge and Finch. 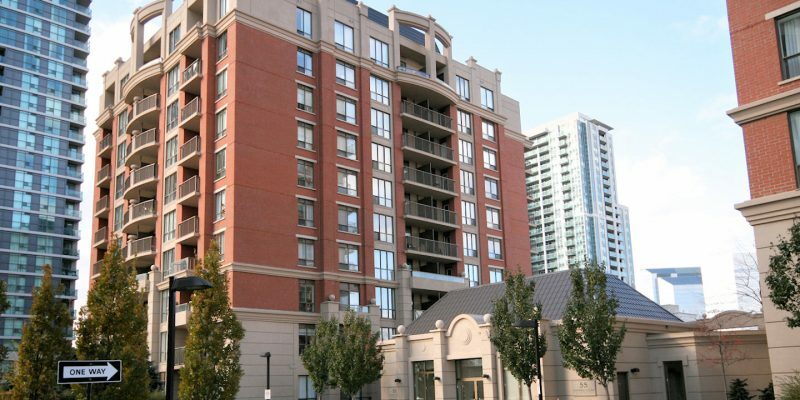 This North York condo was built in 2004 and has suites ranging from 1006 to 1550 square feet. Amenities include a Gym/Exercise Room, Meeting/Function Room, Sauna, Pool, Party Room, Parking Garage, Concierge/Security Guard and Guest Suites. 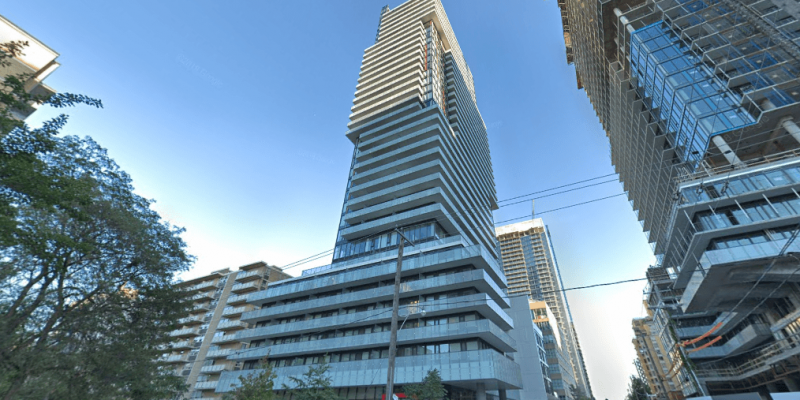 The Majestic II is located at 18 PARKVIEW AVE, near the intersection of Yonge and Finch. 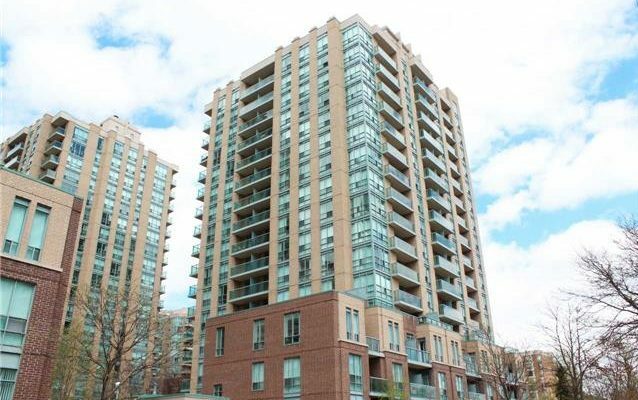 This North York condo was built in 2004 and has suites ranging from 304 to 1528 square feet. Amenities include a Gym/Exercise Room, Party Room, Meeting/Function Room, Sauna, Concierge/Security Guard and Parking Garage. The Chelsea is located at 19 Barberry Pl, near the intersection of Bayview and Sheppard. 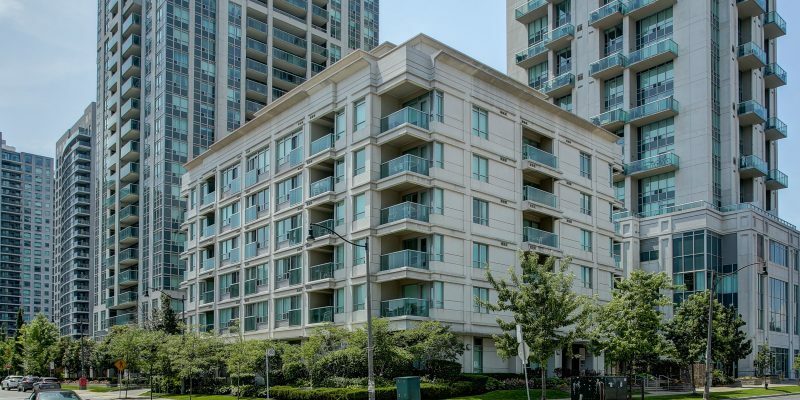 This North York condo was built in 2004 and has suites ranging from 480 to 1408 square feet. Amenities include a Gym/Exercise Room, Parking Garage, Meeting/Function Room, Party Room and Media Room/Cinema. 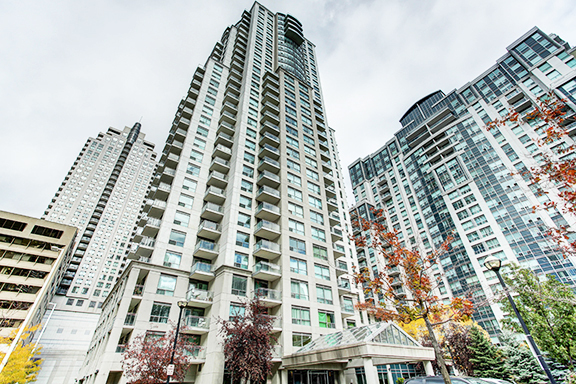 Sonata is located at 7 LORRAINE DR, near the intersection of Yonge and Finch. 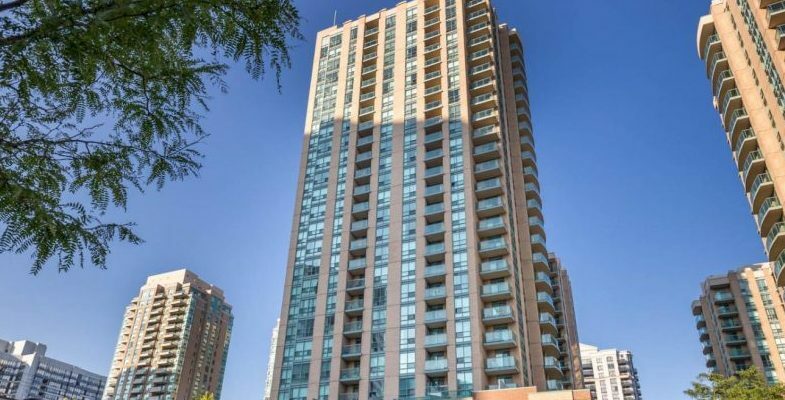 This North York condo was built in 2003 and has suites ranging from 453 to 1518 square feet. Amenities include a Gym/Exercise Room, Parking Garage, Concierge/Security Guard, Pool, Party Room, Meeting/Function Room and Sauna. 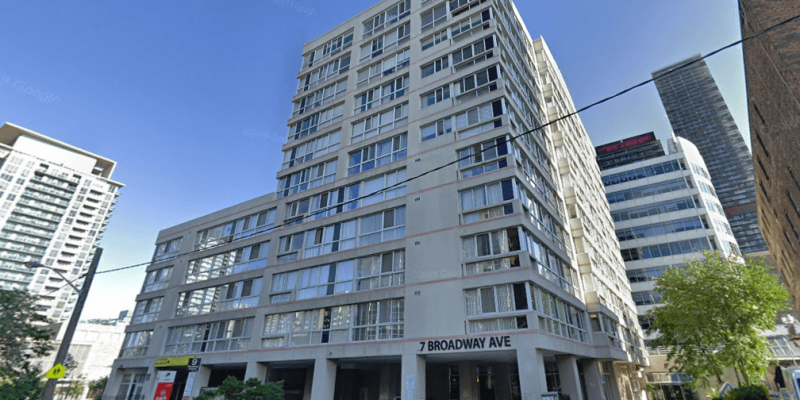 NY Towers – The Waldorf is located at 8 REAN DR, near the intersection of Bayview and Sheppard. 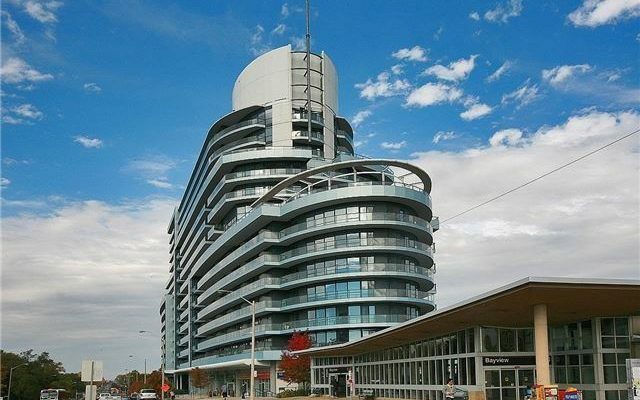 This North York condo was built in 2003 and has suites ranging from 579 to 2538 square feet. Amenities include a Gym/Exercise Room, Guest Suites, Pool, Party Room, Meeting/Function Room, Sauna, Concierge/Security Guard and Parking Garage. 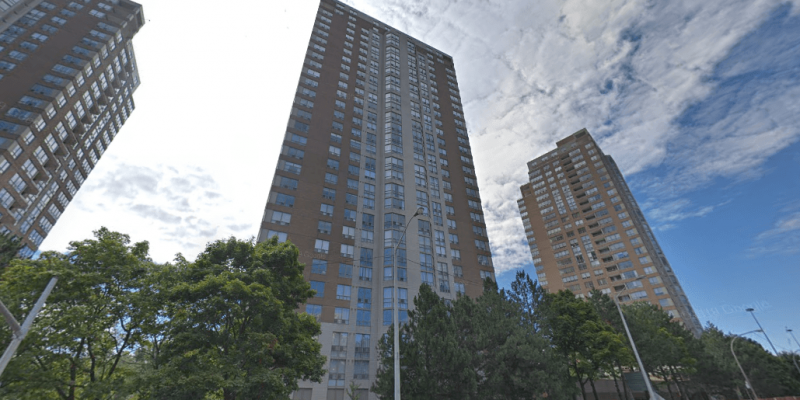 NY Towers – The Waldorf is located at 2 REAN DR, near the intersection of Bayview and Sheppard. 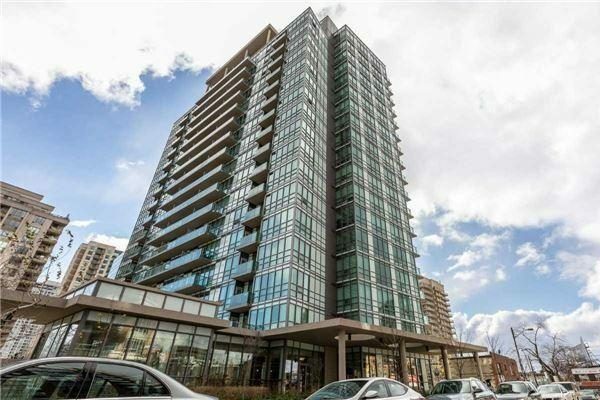 This North York condo was built in 2003 and has suites ranging from 579 to 2538 square feet. Amenities include a Gym/Exercise Room, Guest Suites, Pool, Party Room, Meeting/Function Room, Sauna, Concierge/Security Guard and Parking Garage. 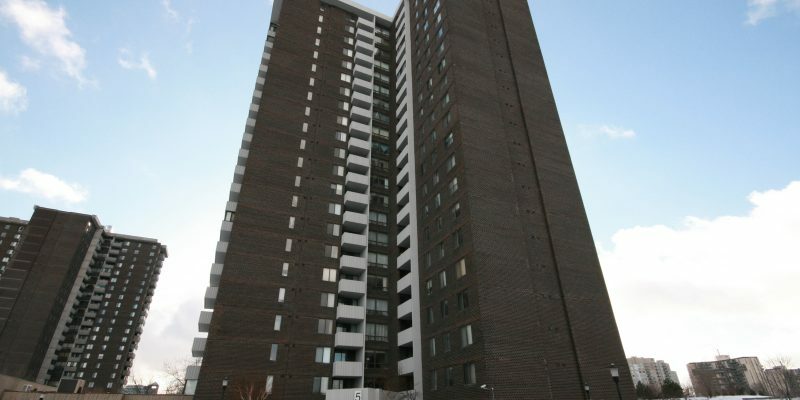 NY Towers – The Chrysler is located at 3 REAN DR, near the intersection of Bayview and Sheppard. 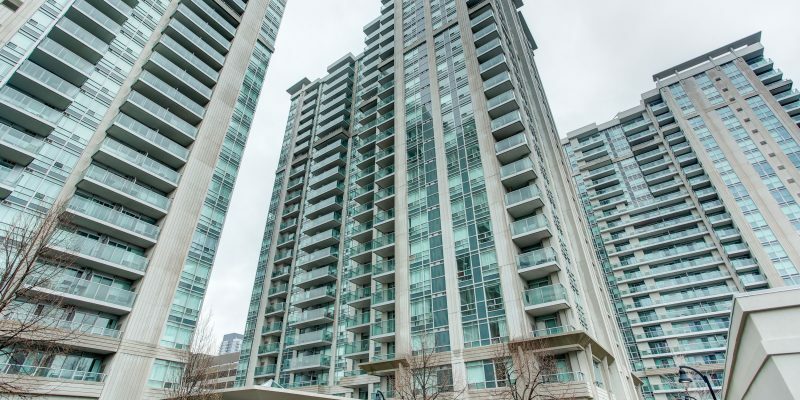 This North York condo was built in 2003 and has suites ranging from 587 to 2117 square feet. Amenities include a Gym/Exercise Room, Meeting/Function Room, Sauna, Pool, Party Room, Parking Garage, Concierge/Security Guard. 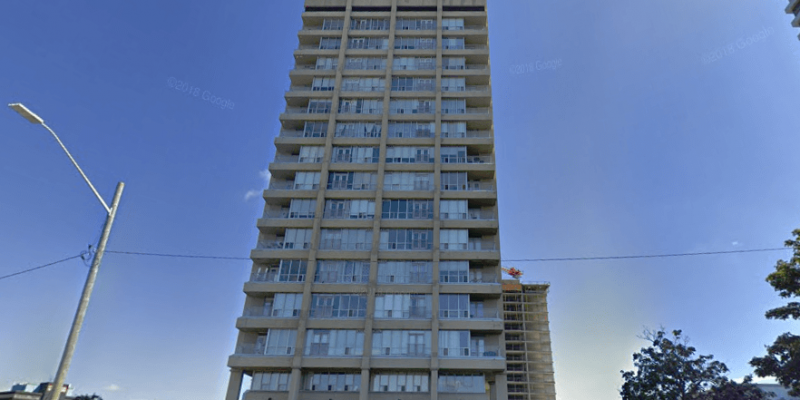 NY Towers – The Chrysler is located at 1 REAN DR, near the intersection of Bayview and Sheppard. 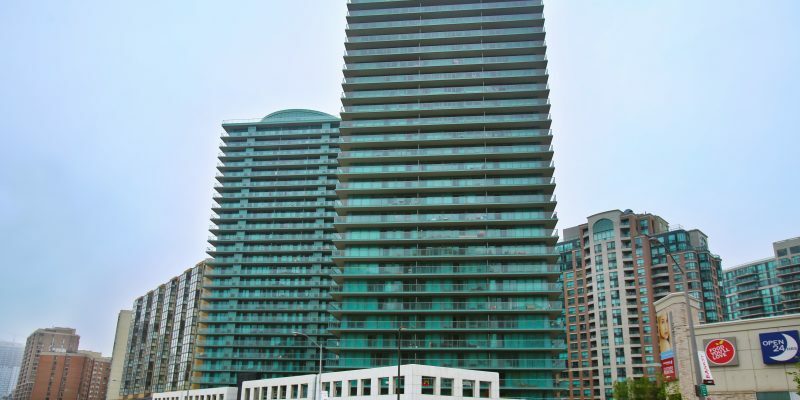 This North York condo was built in 2003 and has suites ranging from 587 to 2117 square feet. Amenities include a Gym/Exercise Room, Meeting/Function Room, Sauna, Pool, Party Room, Parking Garage and Concierge/Security Guard. 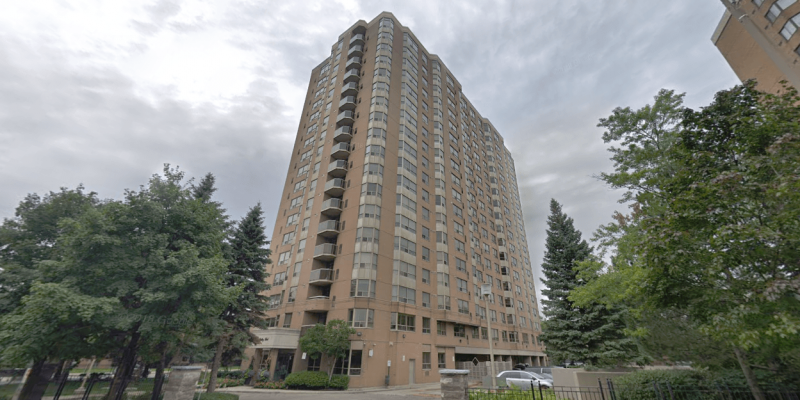 Primrose Towers III is located at 1131 STEELES AVE, near the intersection of Bathurst and Steeles. 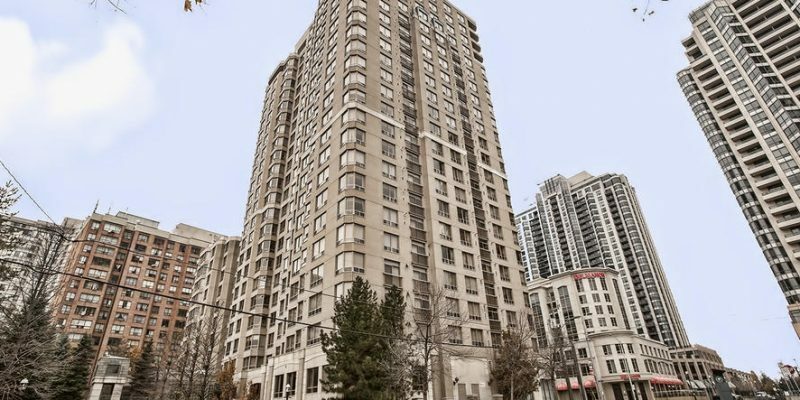 This North York condo was built in 1990 and has suites ranging from 985 to 2400 square feet. Amenities include a Gym/Exercise Room, Sauna, Tennis Court, Pool, Concierge/Security Guard and Parking Garage. 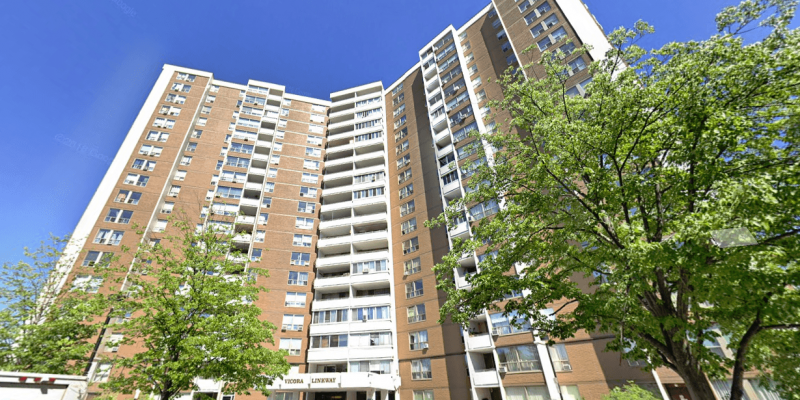 Primrose Towers II is located at 1121 STEELES AVE, near the intersection of Bathurst and Steeles. 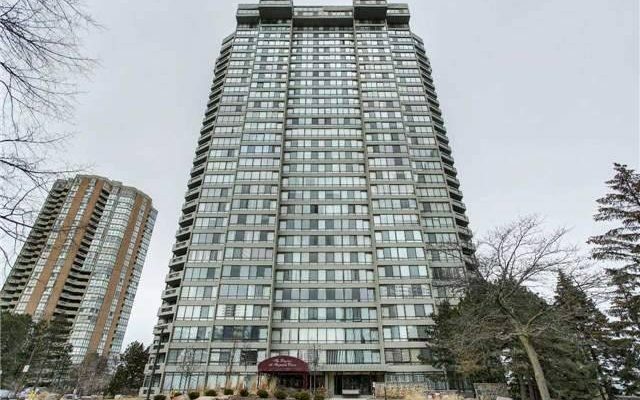 This North York condo was built in 1989 and has suites ranging from 1047 to 1433 square feet. Amenities include a Gym/Exercise Room, Sauna, Pool, Concierge/Security Guard and Parking Garage. Place Nouveau II is located at 5765 YONGE ST, near the intersection of Yonge and Finch. 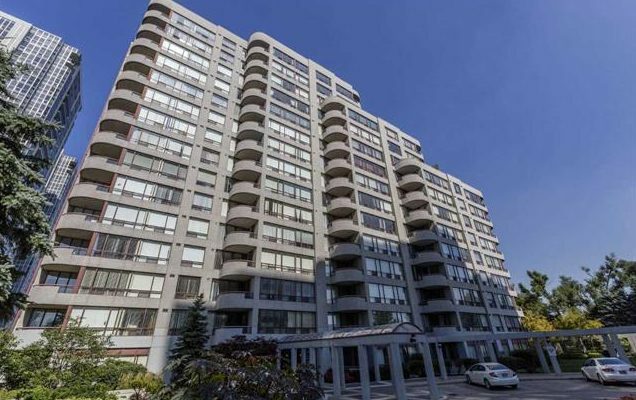 This North York condo was built in 1989 and has suites ranging from 744 to 2910 square feet. Amenities include a Gym/Exercise Room, Pool, Sauna, Parking Garage and Concierge/Security Guard. The Savoy is located at 10 TORRESDALE AVE, near the intersection of Bathurst and Finch. 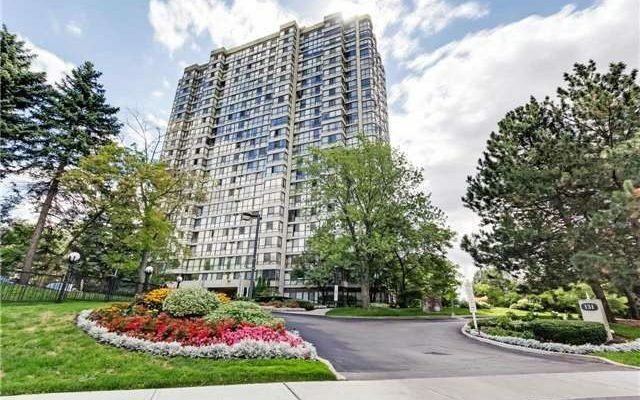 This North York condo was built in 1989 and has suites ranging from 859 to 2317 square feet. Amenities include a Gym/Exercise Room, Pool, Sauna, Tennis Court, Parking Garage and Concierge/Security Guard. 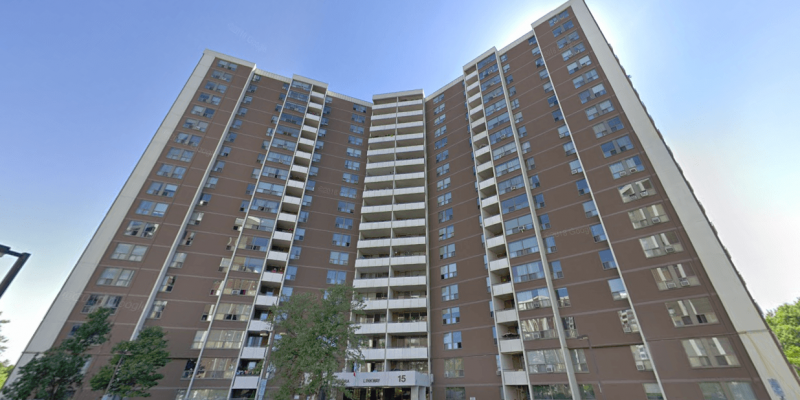 Primrose Towers I is located at 1101 STEELES AVE, near the intersection of Bathurst and Steeles. 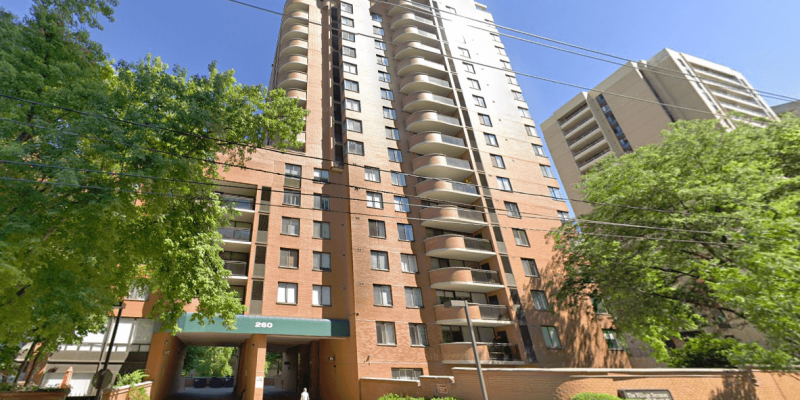 This North York condo was built in 1989 and has suites ranging from 1005 to 1455 square feet. Amenities include a Gym/Exercise Room, Sauna, Tennis Court, Pool, Concierge/Security Guard and Parking Garage. 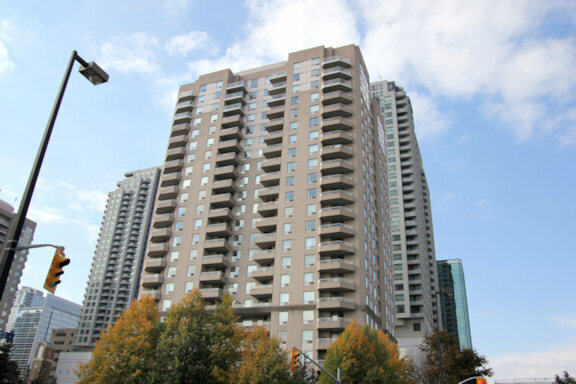 Turnberry Court is located at 5795 YONGE ST, near the intersection of Yonge and Finch. 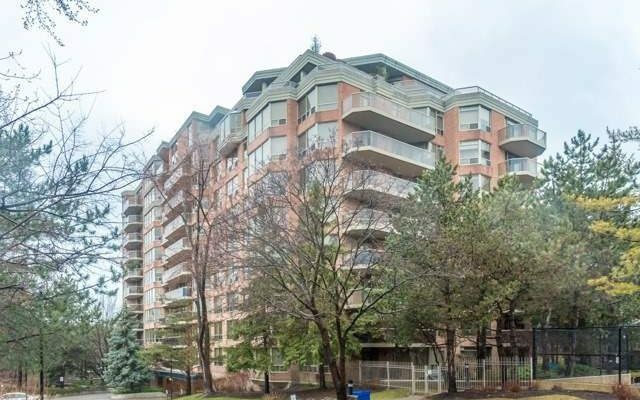 This North York condo was built in 1989 and has suites ranging from 704 to 1450 square feet. Amenities include a Gym/Exercise Room, Pool, Sauna, Squash/Racquet Court, Parking Garage, and Concierge/Security Guard. Place Nouveau I is located at 5785 YONGE ST, near the intersection of Yonge and Finch. 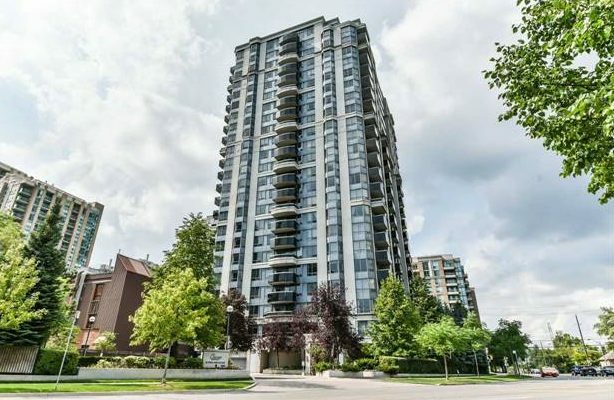 This North York condo was built in 1990 and has suites ranging from 684 to 1559 square feet. Amenities include a Gym/Exercise Room, Parking Garage, Concierge/Security Guard, Pool and Sauna. 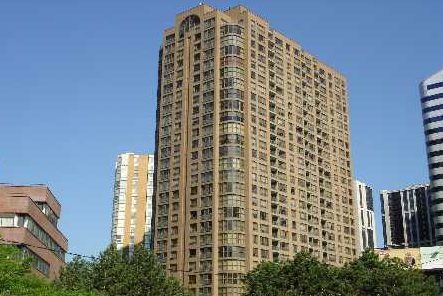 Dynasty Tower is located at 5460 YONGE ST, near the intersection of Yonge and Finch. 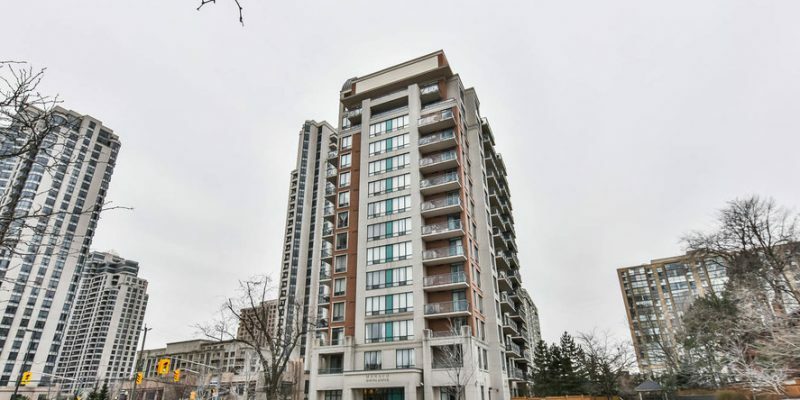 This North York condo was built in 1988 and has suites ranging from 1083 to 1362 square feet. Amenities include a Gym/Exercise Room, Parking Garage, Concierge/Security Guard, Pool, Sauna and Squash/Racquet Court. Residences of the Madison Centre is located at 100 UPPER MADISON AVE, near the intersection of Yonge and Sheppard. 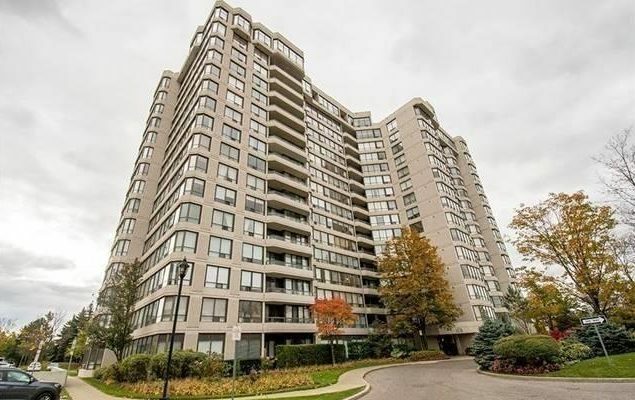 This North York condo was built in 1988 and has suites ranging from 941 to 2356 square feet. Amenities include a Gym/Exercise Room, Parking Garage, Concierge/Security Guard, Pool, Sauna and Squash/Racquet Court. Skyview is located at 5444 YONGE ST, near the intersection of Yonge and Finch. 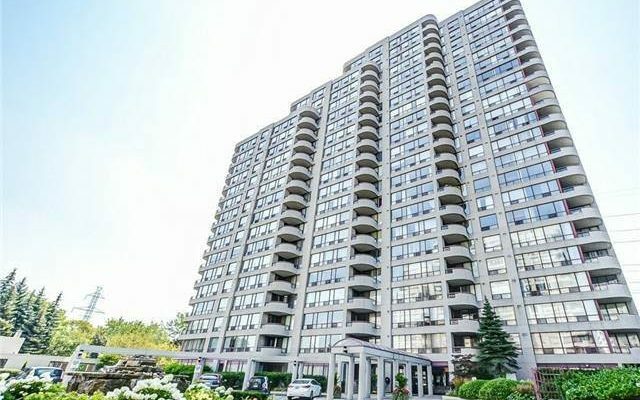 This North York condo was built in 1986 and has suites ranging from 839 to 2420 square feet. Amenities include a Gym/Exercise Room, Parking Garage, Concierge/Security Guard, Pool and Sauna. Hemisphere II is located at 131 TORRESDALE AVE, near the intersection of Bathurst and Finch. 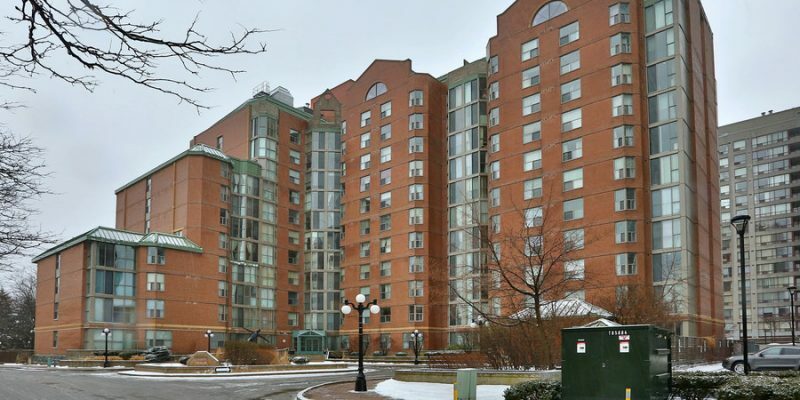 This North York condo was built in 1982 and has suites ranging from 810 to 1620 square feet. Amenities include a Gym/Exercise Room, Party Room, Parking Garage, Concierge/Security Guard, Pool, Meeting/Function Room and Sauna. Hemisphere is located at 133 TORRESDALE AVE, near the intersection of Bathurst and Finch. 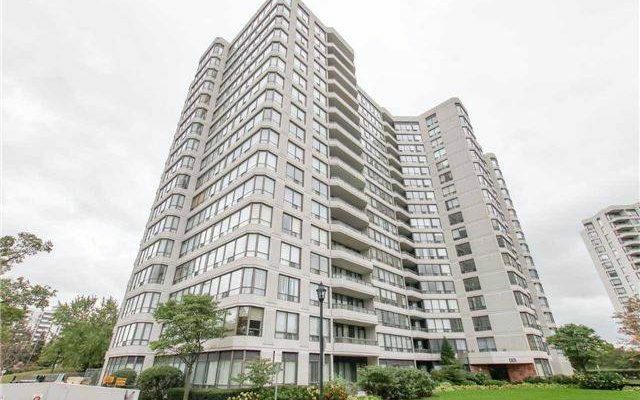 This North York condo was built in 1981 and has suites ranging from 1175 to 1398 square feet. Amenities include a Gym/Exercise Room, Party Room, Pool, Parking Garage, Games/Recreation Room, Concierge/Security Guard, Meeting/Function Room and Sauna. The Atrium is located at 33 ELMHURST AVE, near the intersection of Yonge and Sheppard. 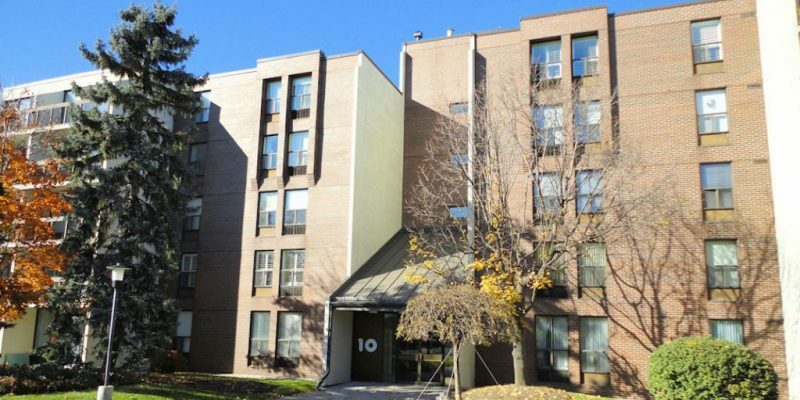 This North York condo was built in 1981 and has suites ranging from 1290 to 1569 square feet. Amenities include a Gym/Exercise Room, Parking Garage, Concierge/Security Guard, Sauna and Squash/Racquet Court. Zenith is located at 55 SKYMARK DR, near the intersection of Don Mills and Finch. 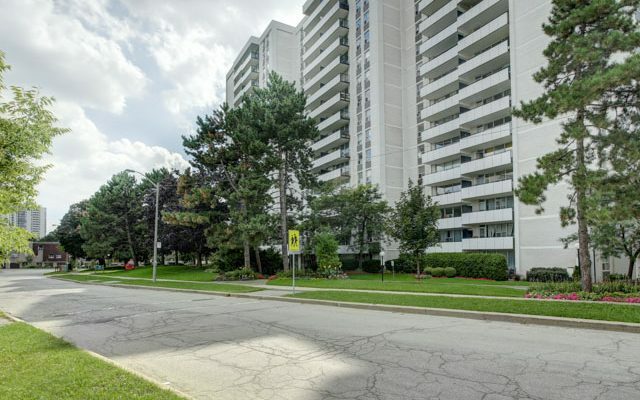 This North York condo was built in 1981 and has suites ranging from 1199 to 1946 square feet. Amenities include a Gym/Exercise Room, Parking Garage, Concierge/Security Guard, Tennis Court, Pool, Games/Recreation Room, Party Room, Sauna and Squash/Racquet Court. Symphony Square is located at 23 LORRAINE DR, near the intersection of Yonge and Finch. 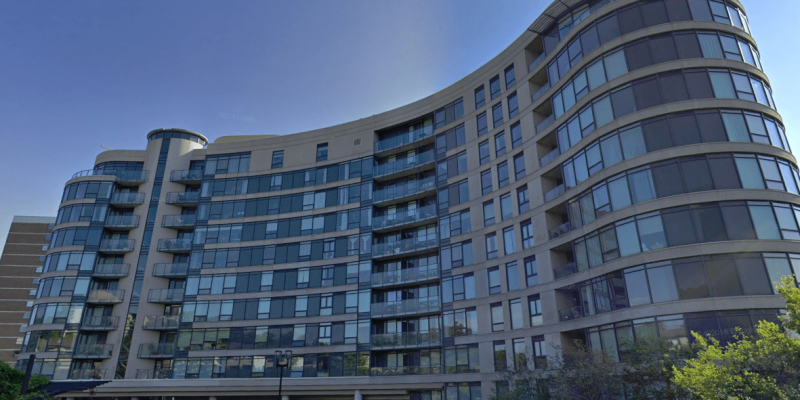 This North York condo was built in 2000 and has suites ranging from 600 to 3115 square feet. Amenities include a Gym/Exercise Room, Sauna, Pool, Parking Garage and Concierge/Security Guard. 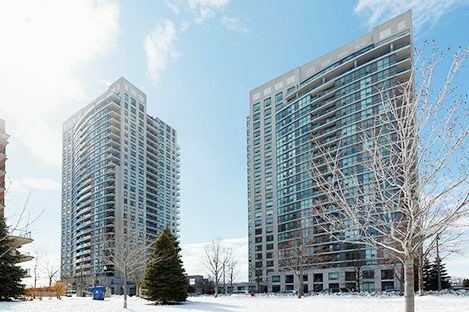 Sommerset at Northtown is located at 18 SOMMERSET WAY, near the intersection of Yonge and Finch. 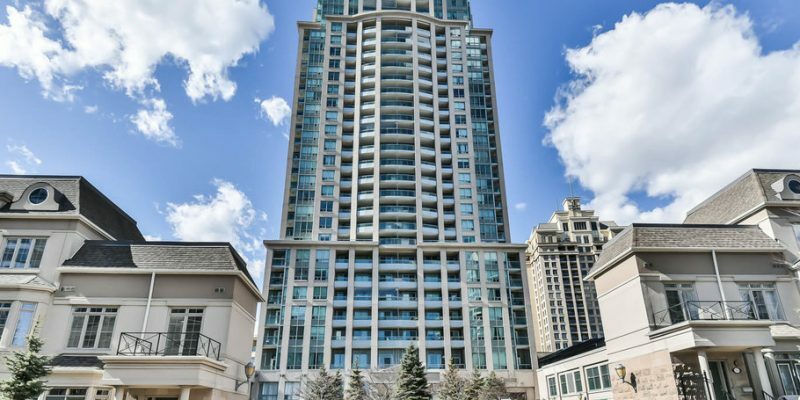 This North York condo was built in 1999 and has suites ranging from 589 to 1447 square feet. Amenities include a Gym/Exercise Room, Parking Garage, Concierge/Security Guard, Pool and Sauna. The Excellence is located at 89 Skymark Dr, near the intersection of Don Mills and Finch. 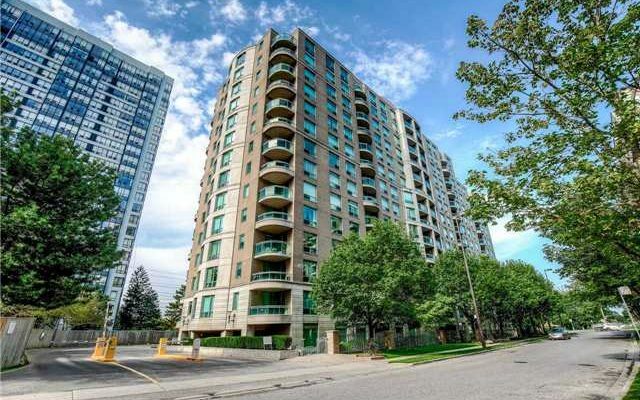 This North York condo was built in 1991 and has suites ranging from 1227 to 3625 square feet. Amenities include a Gym/Exercise Room, Parking Garage, Pool and Concierge/Security Guard. Royal Arms is located at 5418 Yonge St, near the intersection of Yonge and Finch. 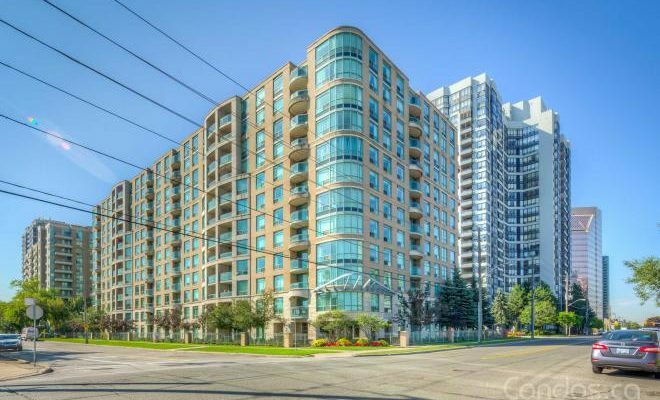 This North York condo was built in 1998 and has suites ranging from 606 to 3410 square feet. Amenities include a Gym/Exercise Room. Parking Garage, Concierge/Security Guard, Pool and Sauna. The Paramount is located at 39 Pemberton Ave, near the intersection of Yonge and Finch. 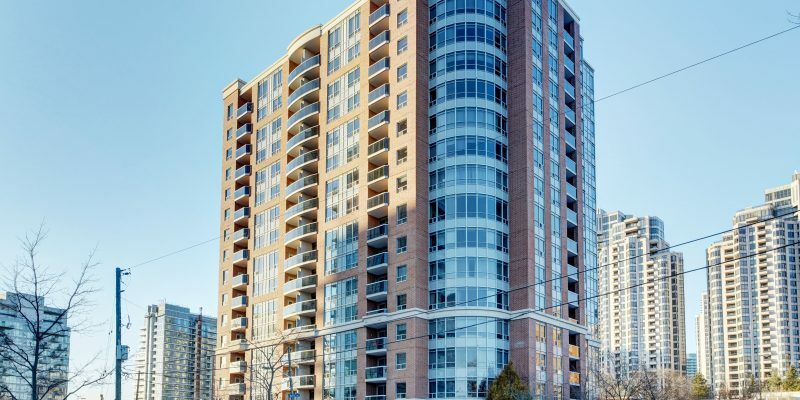 This North York condo was built in 1997 and has suites ranging from 587 to 1570 square feet. Amenities include a Gym/Exercise Room, Parking Garage and Concierge/Security Guard. 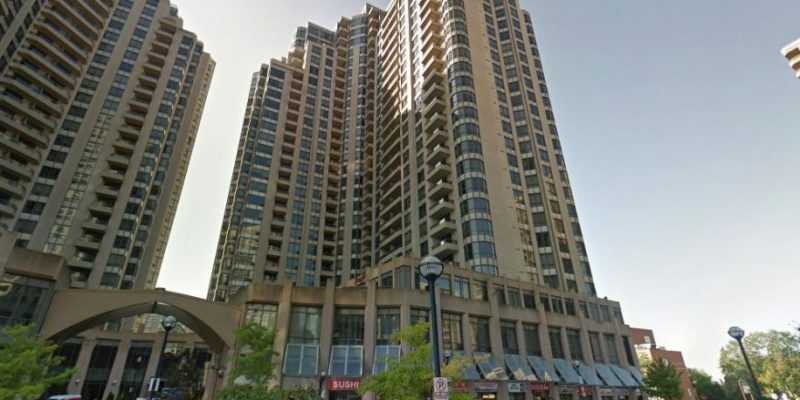 The Plaza is located at 29 Pemberton Ave, near the intersection of Yonge and Finch. 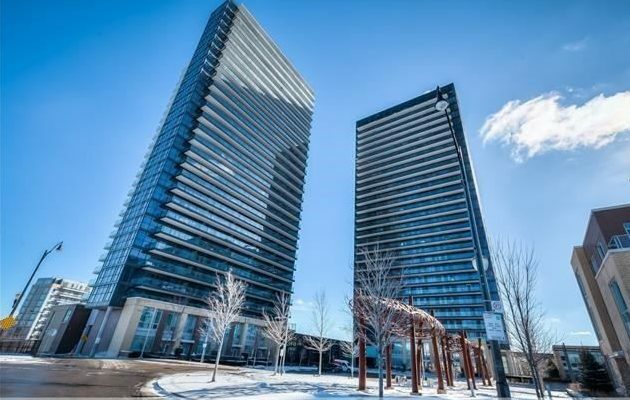 This North York condo was built in 1997 and has suites ranging from 484 to 982 square feet. Amenities include a Gym/Exercise Room, Concierge/Security Guard and Parking Garage. 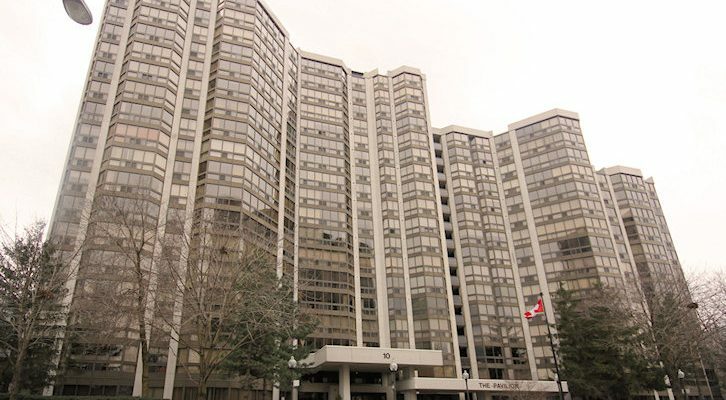 Park Palace III is located at 28 Pemberton AVE, near the intersection of Yonge and Finch. 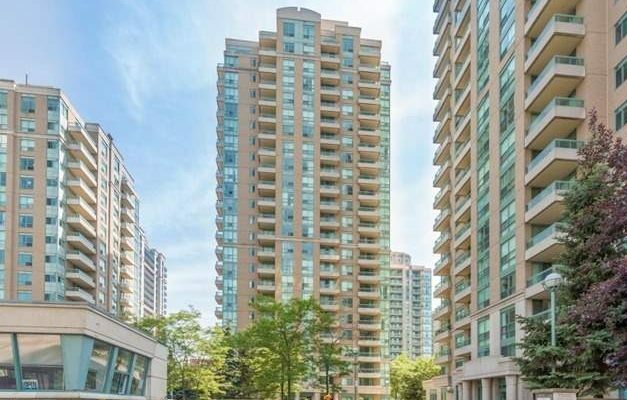 This North York condo was built in 1996 and has suites ranging from 557 to 1318 square feet. Amenities include a Gym/Exercise Room, Parking Garage and Concierge/Security Guard. 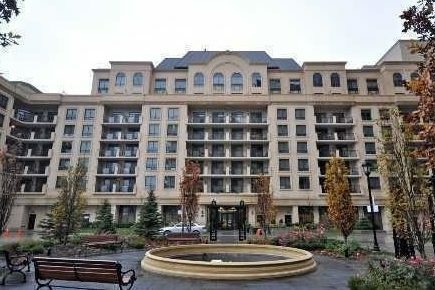 Park Palace II is located at 18 PEMBERTON AVE, near the intersection of Yonge and Finch. 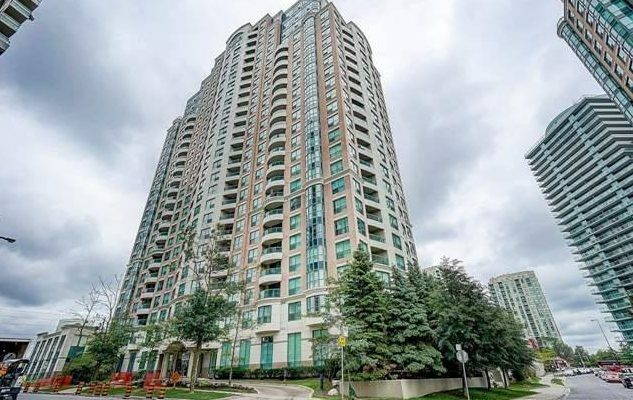 This North York condo was built in 1996 and has suites ranging from 584 to 1213 square feet. 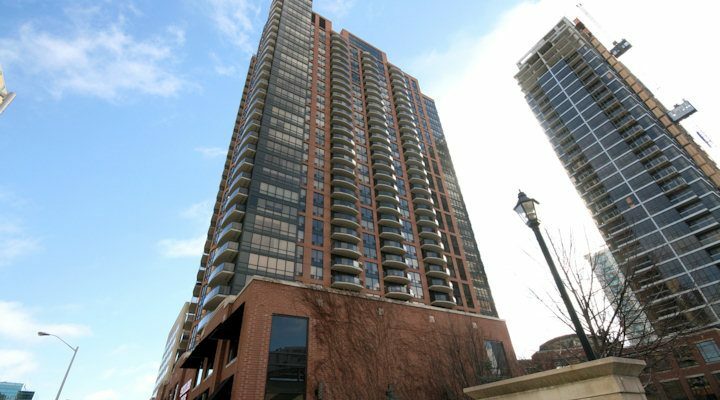 Amenities include a Gym/Exercise Room, Concierge/Security Guard and Parking Garage. 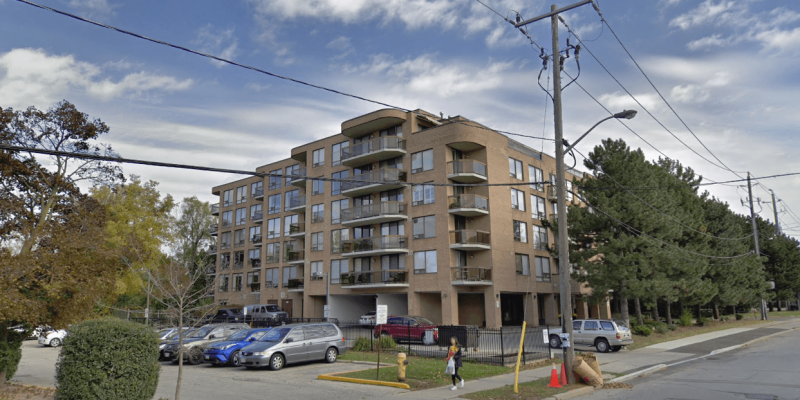 70 OLD SHEPPARD AVE is located near the intersection of the 404 and Sheppard Ave E. This North York condo was built in 1992 and has suites ranging from 644 to 860 square feet. Monthly maintenance fees include Cable TV, Hydro, Common Element Maintenance, Building Insurance, Heat and Water. 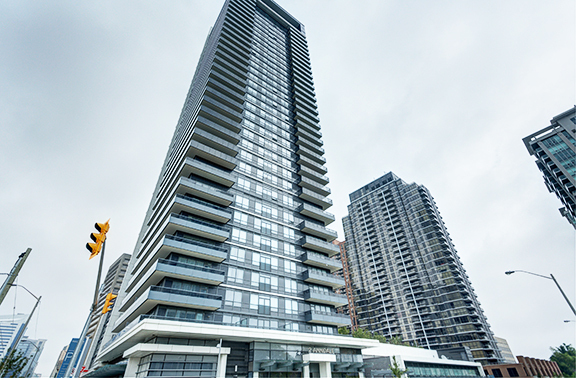 Park Lane II is located at 3 Pemberton AVE, near the intersection of Yonge and Finch. 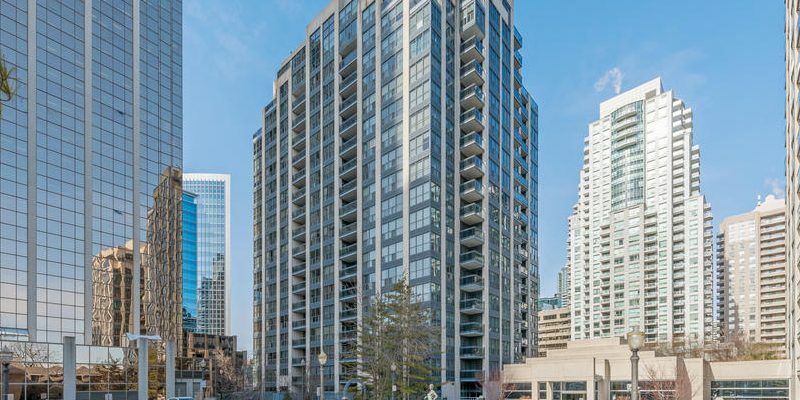 This North York condo was built in 1999 and has suites ranging from 557 to 1112 square feet. Amenities include a Gym/Exercise Room, Parking Garage, Meeting/Function Room, Sauna, Party Room and Concierge/Security Guard. 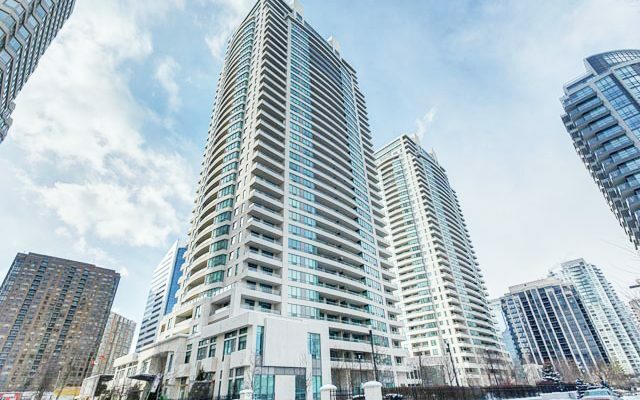 Park Lane I is located at 1 PEMBERTON AVE, near the intersection of Yonge and Finch. 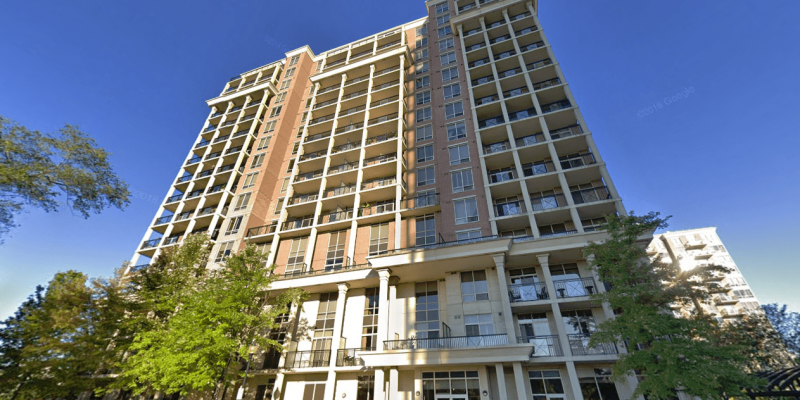 This North York condo was built in 1999 and has suites ranging from 536 to 1122 square feet. Amenities include a Gym/Exercise Room, Parking Garage and Concierge/Security Guard. Park Palace is located at 8 PEMBERTON AVE, near the intersection of Yonge and Finch. 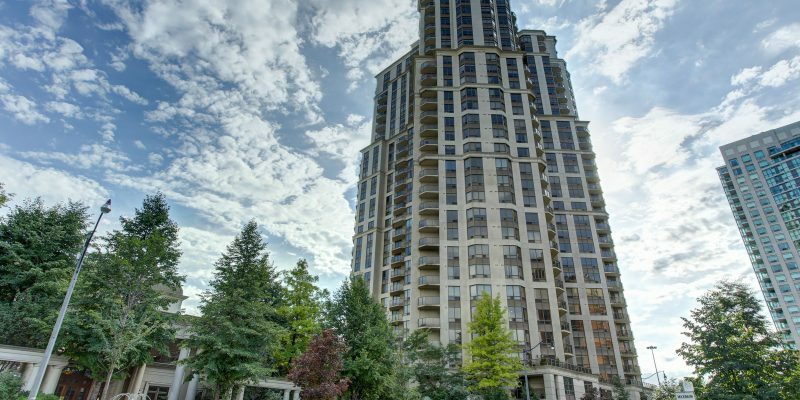 This North York condo was built in 1996 and has suites ranging from 482 to 951 square feet. Amenities include a Gym/Exercise Room, Parking Garage, Concierge/Security Guard and Sauna. 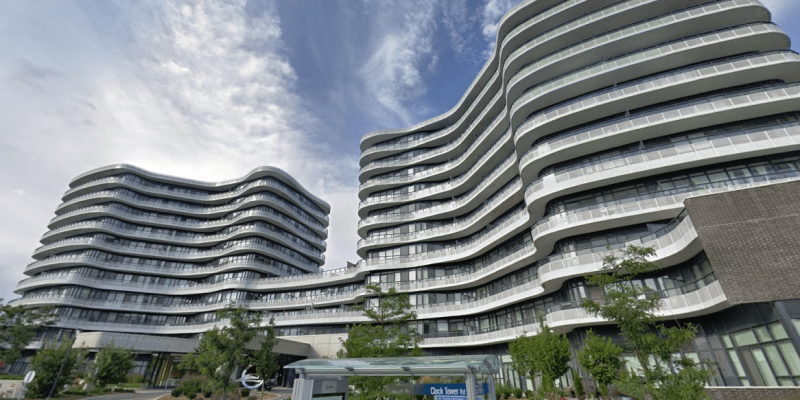 Watergarden Condos is located at 1 WATERGARDEN WAY, near the intersection of Bayview and Finch. 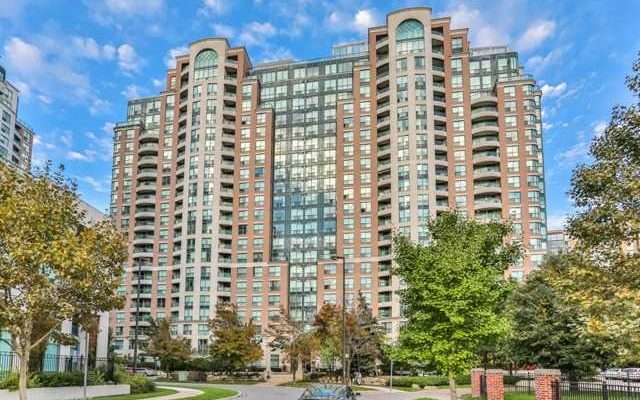 This North York condo was built in 1994 and has suites ranging from 711 to 3908 square feet. Amenities include a Gym/Exercise Room, Parking Garage, Concierge/Security Guard, Meeting/Function Room, Party Room and Sauna. 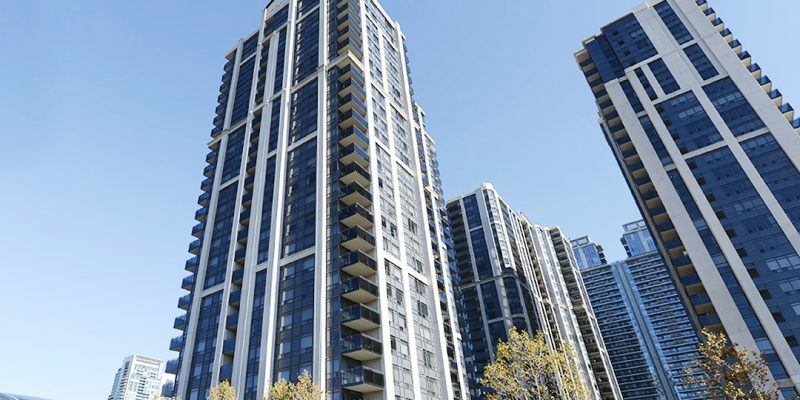 Chicago Residences is located at 35 Finch Ave E, near the intersection of Yonge and Finch. 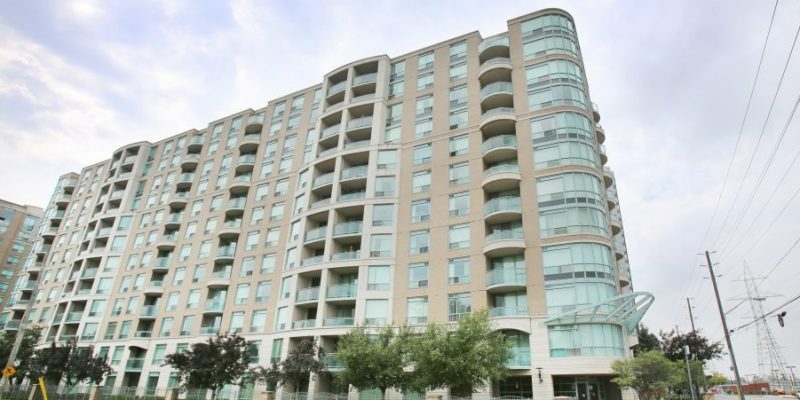 This North York condo was built in 2001 and has suites ranging from 593 to 1471 square feet. Amenities include a gym/exercise room, pool, guest suites, sauna, and fibrestream internet. ARC is located at 2885 Bayview Ave, near the intersection of Bayview and Sheppard. 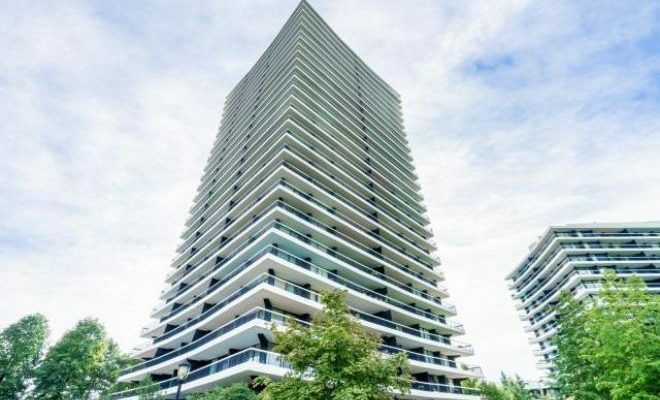 This North York condo was built in 2009 and has suites ranging from 405 to 2172 square feet. Amenities include a gym/exercise room, guest suites, pool, party room, media room/cinema, common rooftop deck, meeting/function room and sauna. 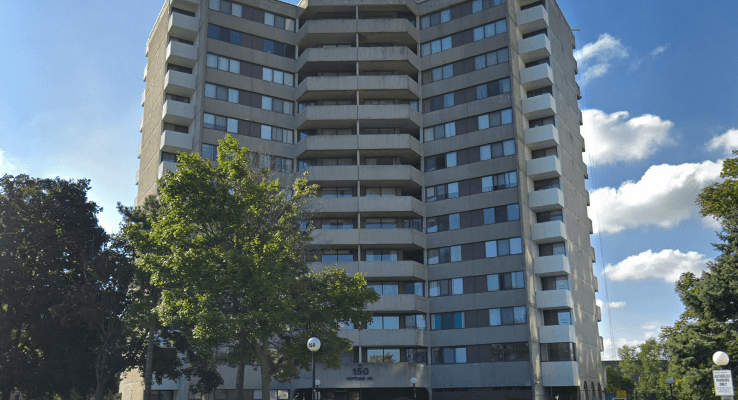 Crossroads is located at 10 Muirhead Rd, near the intersection of the 404 and Sheppard Ave E. This North York condo was built in 1974 and has suites ranging from 831 to 1278 square feet. Amenities include a gym/exercise room, pool, sauna and tennis court. Crossroads II is located at 1900 Sheppard Ave E, near the intersection of 404 and Sheppard . 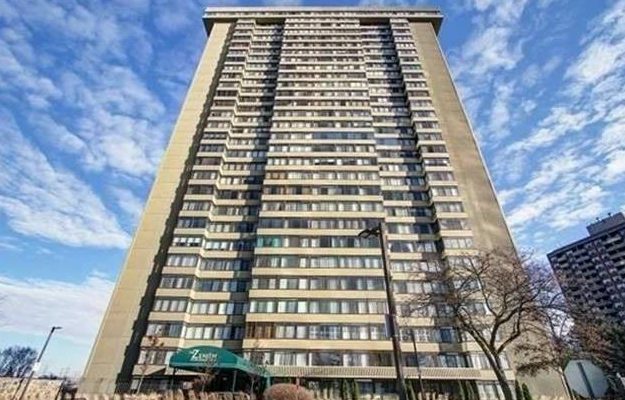 This North York condo was built in 1976 and has suites ranging from 861 to 1343 square feet. Amenities include a gym/exercise room, sauna, squash/racquet court, pool, meeting/function room, tennis court and party room. 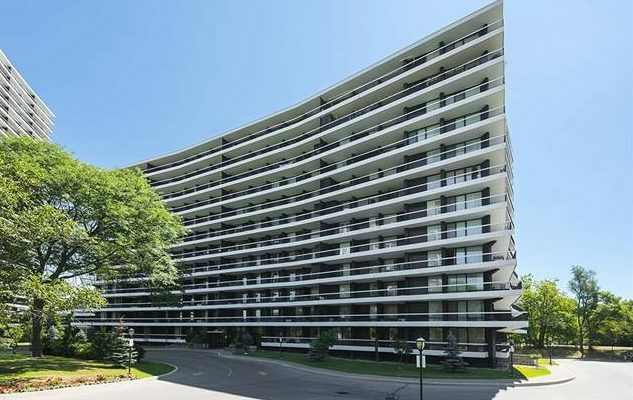 20 Forest Manor Rd is located near the intersection of Don Mills and Sheppard Ave E. This North York condo was built in 1970 and has suites ranging from 891 to 1289 square feet. Amenities include a gym/exercise room, tennis court, pool and sauna. Ultra at Heron’s Hill is located at 2015 Sheppard Ave E, near the intersection of Sheppard and 404. This North York condo was built in 2013 and has suites ranging from 343 to 929 square feet. Amenities include a gym/exercise room, guest suites, sauna, visitor lounge, pool, party room, media room/cinema, yoga studio, meeting/function room, and games/recreation room. The Elegance is located at 65 Skymark Dr near the intersection of Don Mills and Finch. 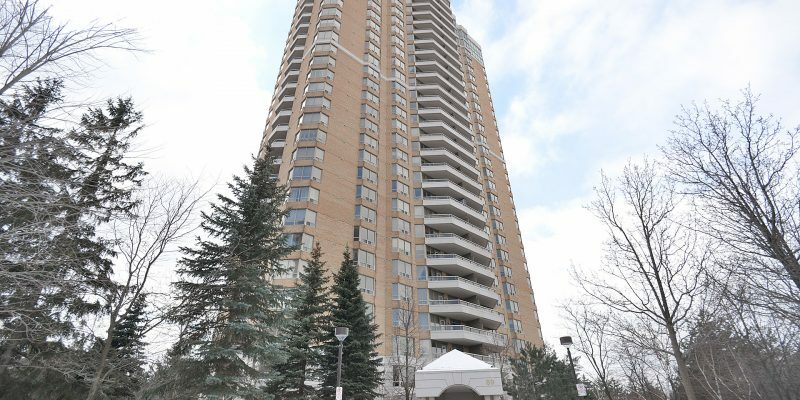 This North York condo was built in 1982 and has suites ranging from 1443 to 2602 square feet. Amenities include a gym/exercise room, pool and sauna. Classic is located at 85 Skymark Dr, near the intersection of Don Mills and Finch. 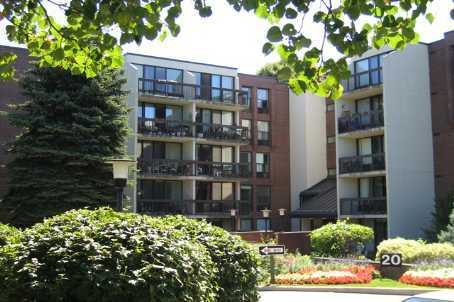 This North York condo was built in 1985 and has suites ranging from 1202 to 2817 square feet. Amenities include a gym/exercise room, pool and sauna. Willow Park at Bayview is located at 17 Ruddington Dr, near the intersection of Bayview and Finch. This North York condo was built in 2012 and has suites ranging from 642 to 1508 square feet. Amenities include a gym/exercise room, meeting/function room, games/recreation room, party room and guest suites. Palace Gate is located at 3181 Bayview Ave, near the intersection of Bayview and Finch. 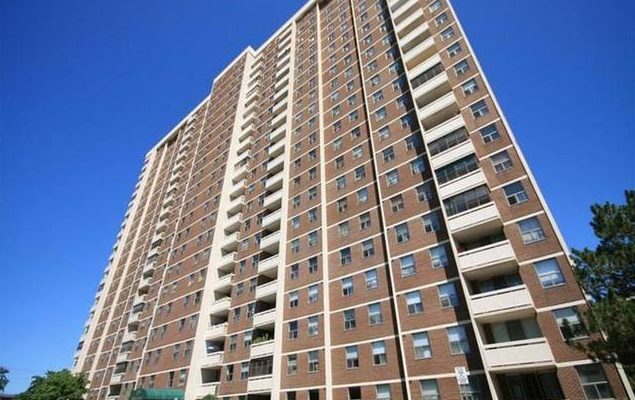 This North York condo was built in 1995 and has suites ranging from 1138 to 2925 square feet. Amenities include a gym/exercise room, pool and sauna. Luxe is located at 5791 Yonge St, near the intersection of Yonge and Finch. This North York condo was built in 2010 and has suites ranging from 545 to 1130 square feet. Amenities include a gym/exercise room, praty room, meeting/function room, sauna, pool, guest suites, and fibrestream internet. 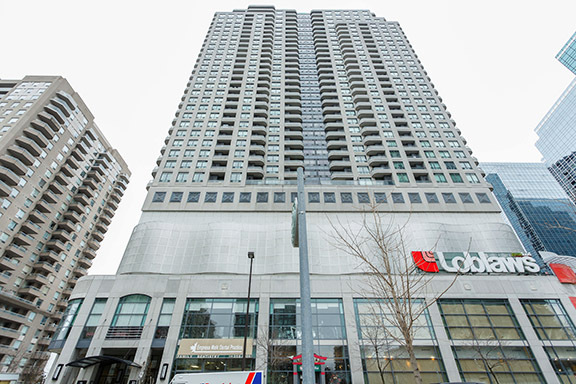 Luxe II is located at 5793 Yonge St, near the intersection of Yonge and Finch. This North York condo was built in 2010 and has suites ranging from 545 to 1129 square feet. Amenities include a gym/exercise room, party room, media room/cinema, pool, sauna, meeting/function room and guest suites. 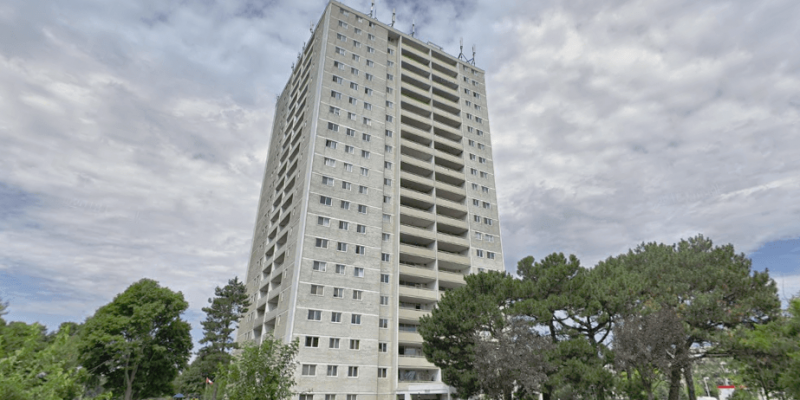 Antibes Court is located at 100 Antibes Dr, near the intersection of Bathurst and Finch. 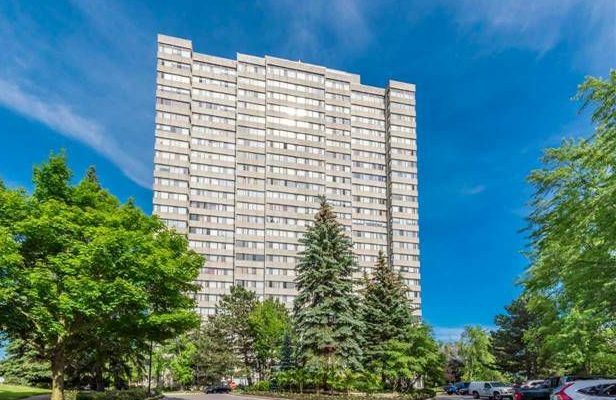 This North York condo was built in 1978 and has suites ranging from 1315 to 2572 square feet. Amenities include a Sauna, Pool and Gym/Exercise Room. 777 Steeles Ave W is located near the intersection of Steeles and Bathurst. 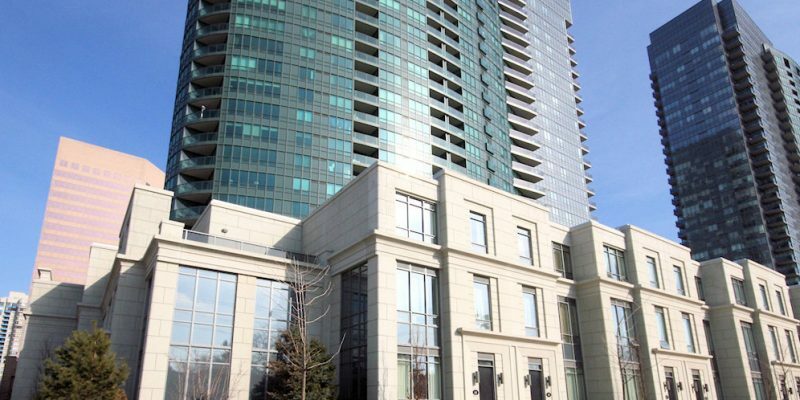 This North York condo was built in 2008 and has suites ranging from 609 to 1577 square feet. Amenities include a Gym/ Exercise Room, Party Room and Meeting Room. 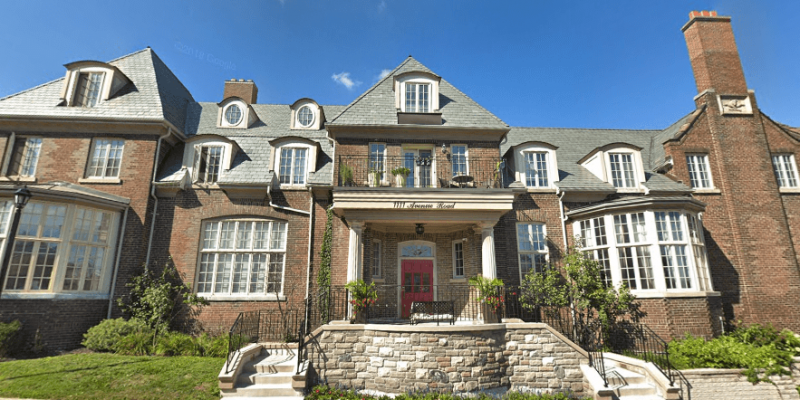 Bayview Mansions is located at 2 Clairtrell Rd, near the intersection of Bayview and Sheppard. 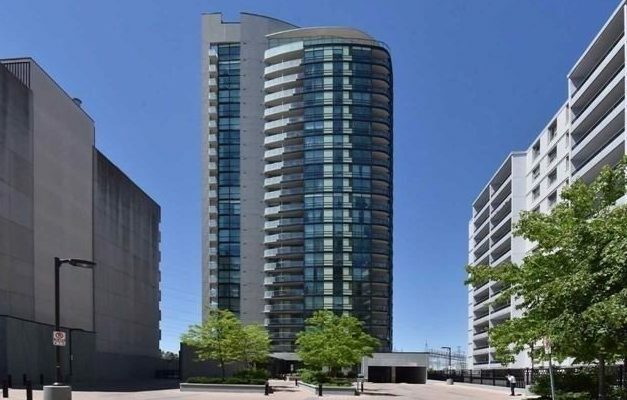 This North York condo was built in 2003 and has suites ranging from 481 to 1675 square feet. Amenities include a Gym/Exercise Room, Concierge and Sauna. Bayview Manor is located at 15 and 23 Rean Drive, near the intersection of Bayview and Sheppard. This North York condo was built in 2010 and has suites ranging from 636 to 2420 square feet. Amenities include a Gym/Exercise Room, Party Room, and a pool. 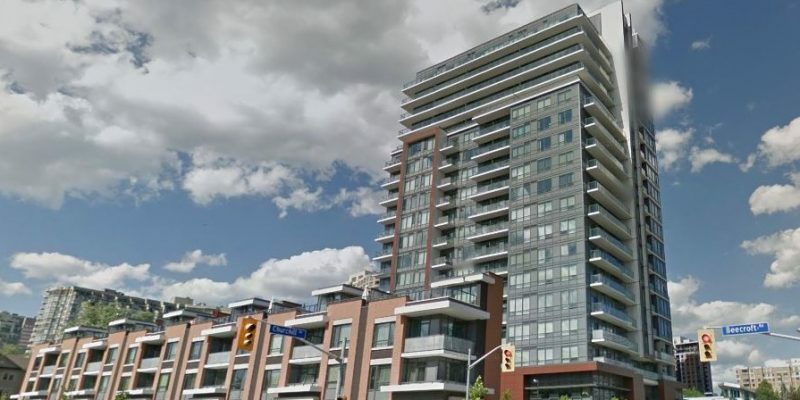 Aria is located at 10 and 20 Bloorview Place, near the intersection of Leslie and Sheppard. 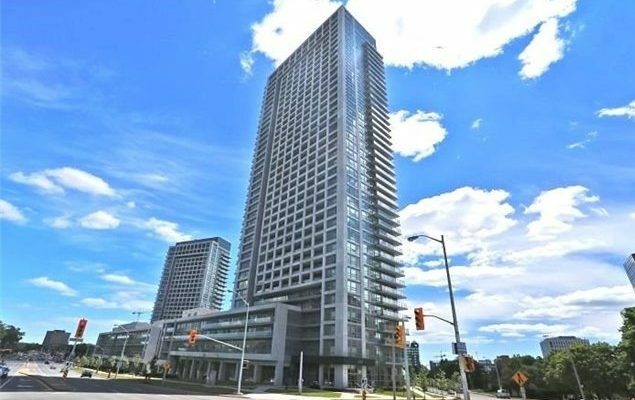 This North York condo was built in 2011 and has suites ranging from 570 to 3015 square feet. Amenities include a Gym/Exercise Room, Party Room, Media Room/Cinema, and Pool. Ultima at Broadway is located at 4968 Yonge St, near the intersection of Yonge and Sheppard. 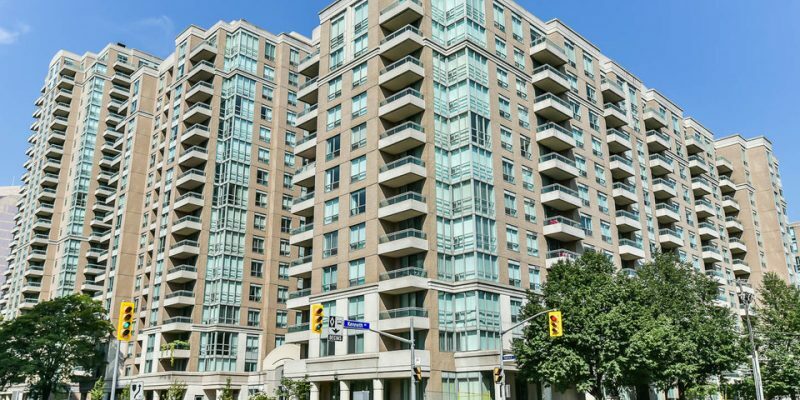 This North York condo was built in 2006 and has suites ranging from 505 to 1928 square feet. Amenities include a gym/exercise room, pool, sauna, meeting/function room, party room and guest suites. Atrium II is located at 65 Spring Garden Ave, near the intersection of Yonge and Sheppard. 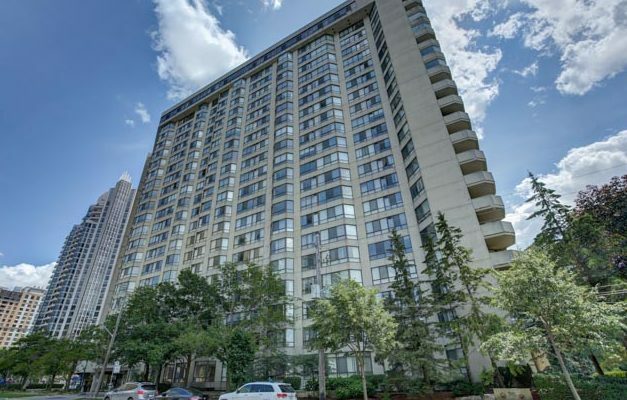 This North York condo was built in 1984 and has suites ranging from 1477 to 2206 square feet. Amenities include a gym/exercise room, pool, sauna, and squash/racquet court. Platinum Towers XO is located at 18 Spring Garden Ave, near the intersection of Yonge and Sheppard. 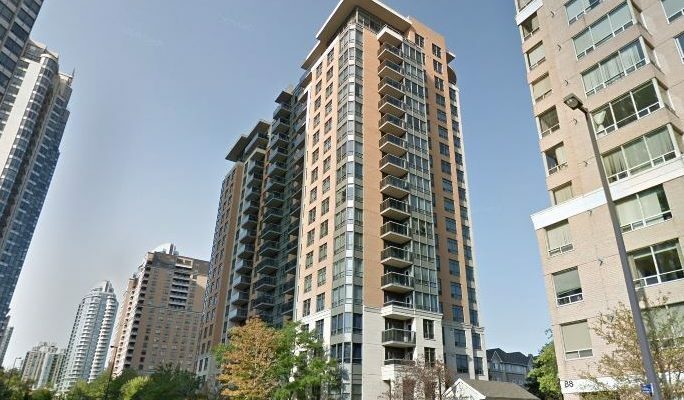 This North York condo was built in 2008 and has suites ranging from 585 to 1585 square feet. Amenities include gym/exercise room, party room, meeting/function room, pool, sauna and guest suites. 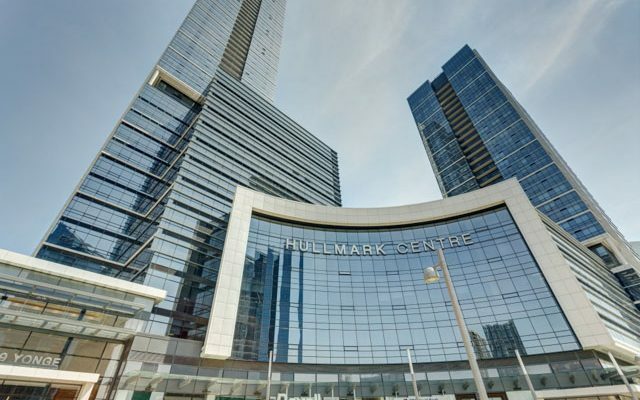 Hullmark Centre II is located at 5 Sheppard Ave E, near the intersection of Yonge and Sheppard. 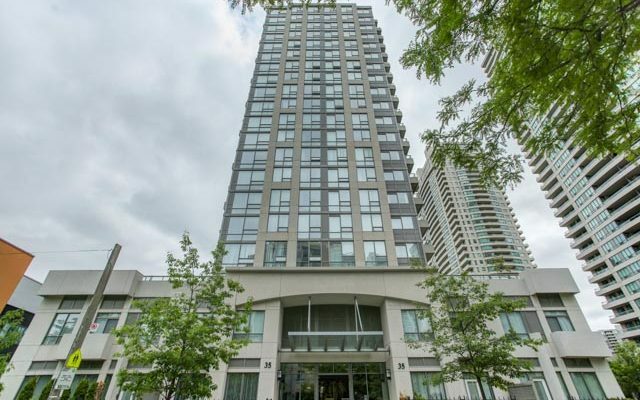 This North York condo was built in 2005 and has suites ranging from 462 to 2272 square feet. Amenities include a gym, games room, pool, sauna, party room, yoga studio and a common rooftop deck. These high-rise Toronto condos were built in 2002 by Tridel. Situated in North York’s hugely popular Willowdale East neighbourhood, the closest main intersection to Triomphe is Yonge and Finch. 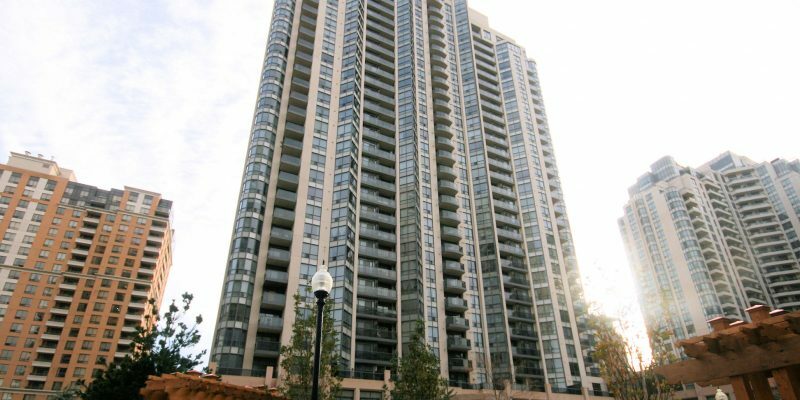 Located at 5 Northtown Way this North York condo has suites ranging from 526 to 2160 sqft. 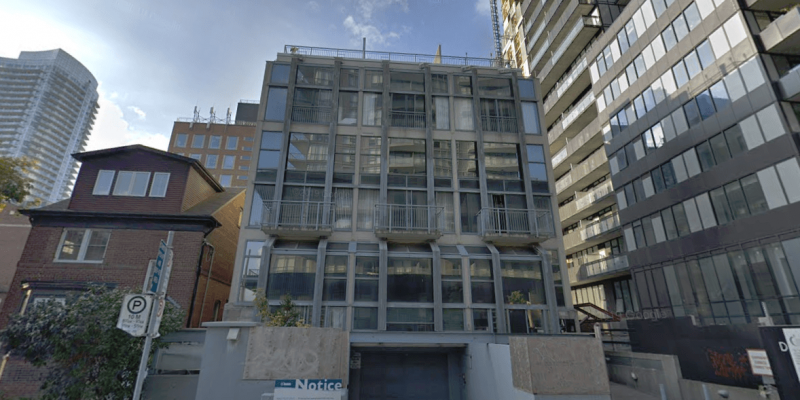 There are 339 units at Triomphe, with a variety of exposures and layouts over 29 levels. Amenities here include a Gym / Exercise Room, Pool, Concierge and Parking Garage as well as a Security Guard, Enter Phone System and a Tennis Court. 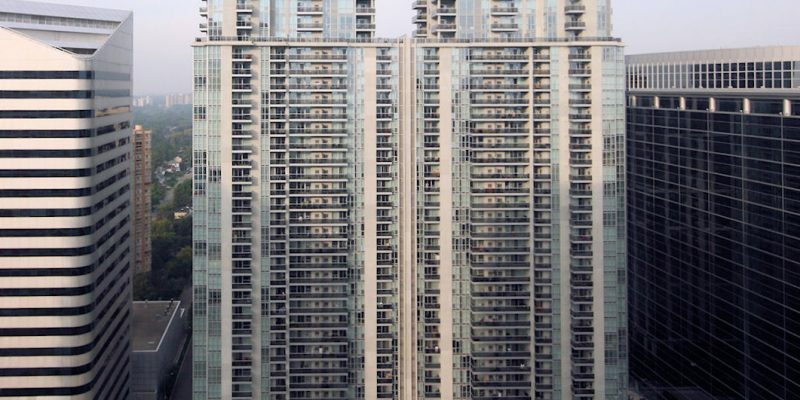 Included in your monthly condo maintenance fees are Air Conditioning, Common Element Maintenance, Heat, Hydro, Building Insurance and Water. 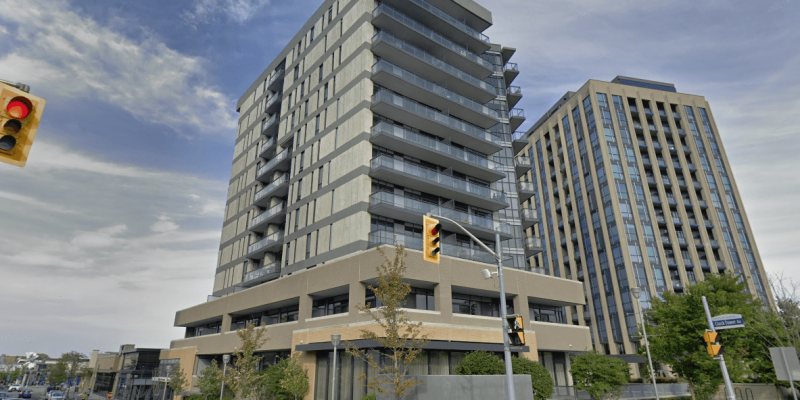 Jade Condos is located at 399 SPRING GARDEN AVE, near the intersection of Bayview and Sheppard. This North York condo was built in 2014 and has suites ranging from 494 to 1711 square feet. Amenities include a Gym/Exercise Room, BBQs, Meeting/Function Room, Common Rooftop Deck, Party Room, Guest Suites, Outdoor Patio/Garden, Games/Recreation Room, Visitor Lounge, Concierge/Security Guard, Parking Garage, and Media Room/Cinema. 21 Hillcrest is located at 21 Hillcrest Ave, near the intersection of Yonge and Sheppard. 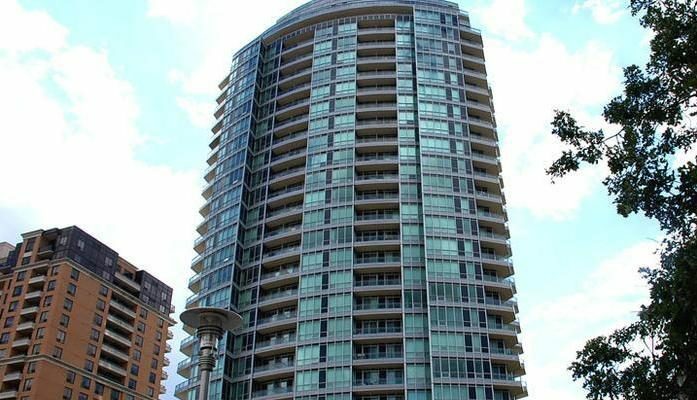 This North York condo was built in 2004 and has suites ranging from to square feet. Amenities include a Gym/Exercise Room, Meeting/Function Room, Sauna, Pool, Party Room, Parking Garage, Concierge/Security Guard. 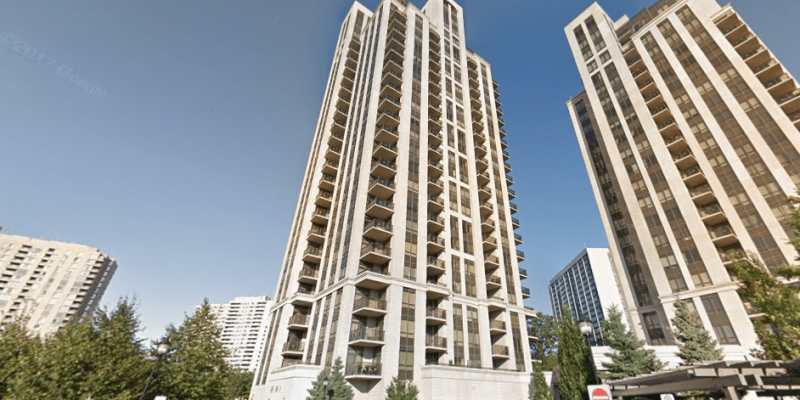 C Condos is located at 503 BEECROFT RD, near the intersection of Yonge and Finch. 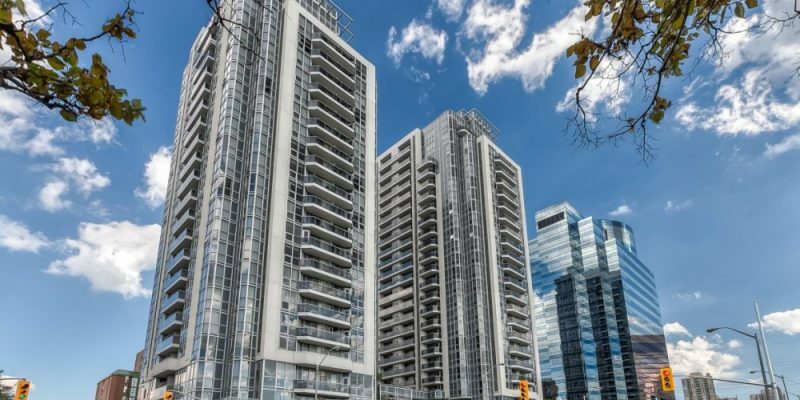 This North York condo was built in 2008 and has suites ranging from 538 to 1191 square feet. Amenities include a Gym/Exercise Room, Party Room, Media Room/Cinema, Pool, Meeting/Function Room, Sauna, Guest Suites, Parking Garage and Concierge/Security Guard. 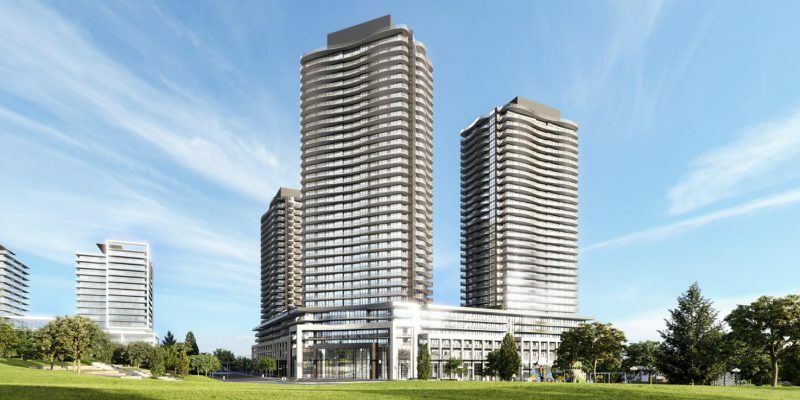 Broadway II Residences is located at 155 BEECROFT RD, near the intersection of Yonge and Sheppard. 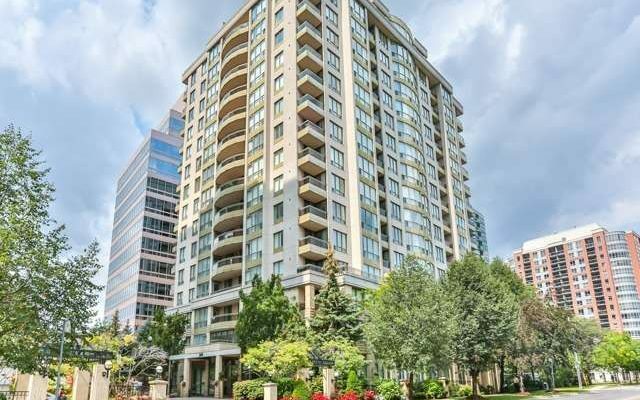 This North York condo was built in 2004 and has suites ranging from 490 to 1087 square feet. Amenities include a Gym/Exercise Room, Guest Suites, Pool, Party Room, Meeting/Function Room, Sauna, FibreStream Internet, Concierge/Security Guard and Parking Garage. Residences of Avondale is located at 1 Avondale Ave, near the intersection of Yonge and Sheppard . 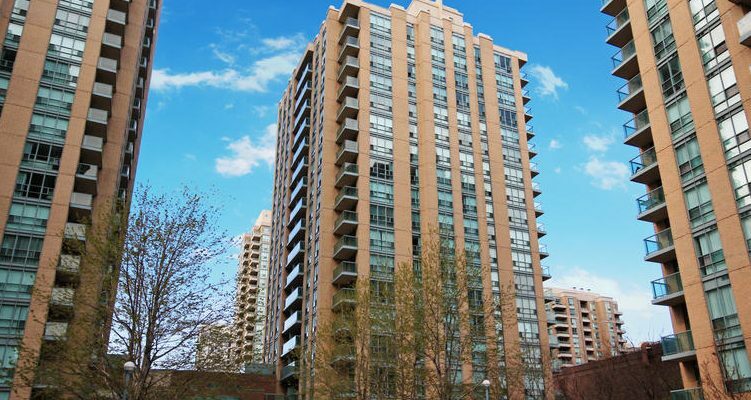 This North York condo was built in 2006 and has suites ranging from 344 to 1199 square feet. Amenities include a Gym/Exercise Room, Common Rooftop Deck, Concierge/Security Guard, Party Room, BBQs, Guest Suites, Meeting/Function Room, Parking Garage and Sauna. 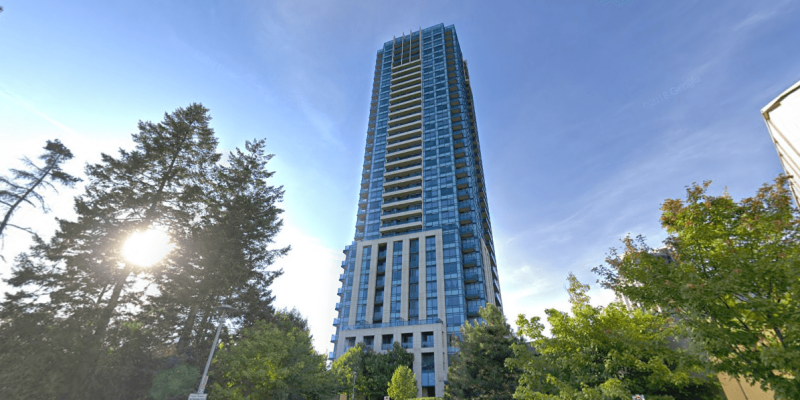 23 storey condo with unparalleled views. 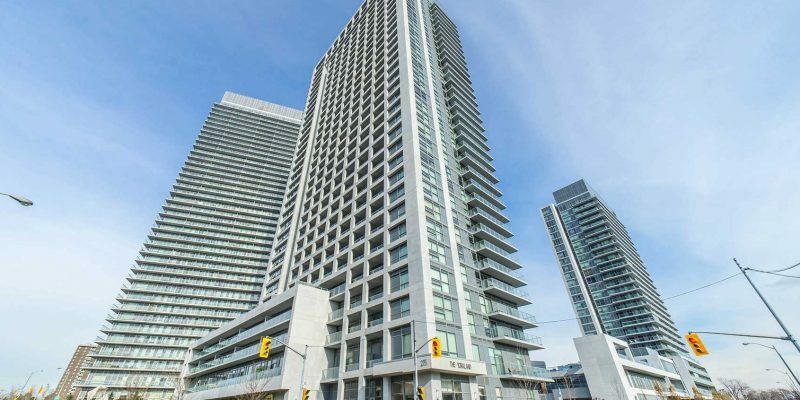 Located right around the corner from Yonge and Sheppard, this condo has suites ranging in size from 486 to 1300 square feet. 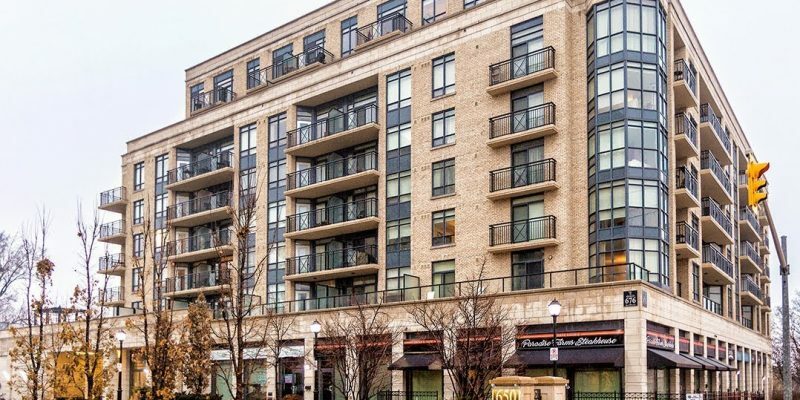 This condo has a walk score of 91, with plenty of restaurants, shops and entertainment nearby. The TTC right on your doorstep, and it also has easy access to the 401. There are also plenty of parks around with Willowdale Park, Glendora Park, and Earl Bales. Cosmo Two is located at 31 BALES AVE, near the intersection of Yonge and Sheppard. 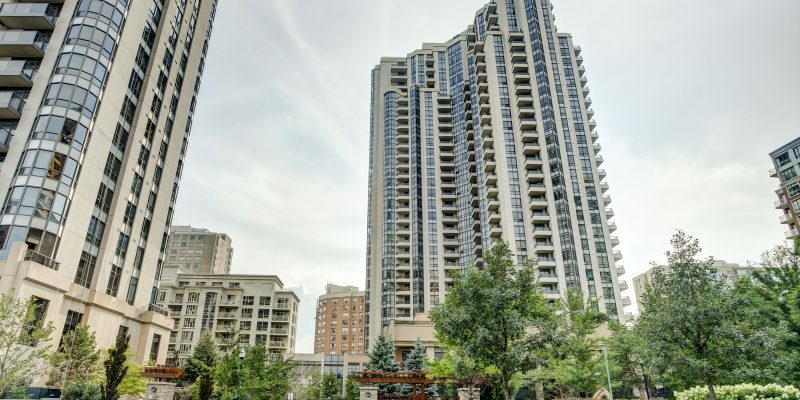 This North York condo was built in 2006 and has suites ranging from 410 to 1340 square feet. Amenities include a Gym/Exercise Room, Parking Garage, Concierge/Security Guard, Pool, Party Room, Guest Suites, Meeting/Function Room and Sauna. 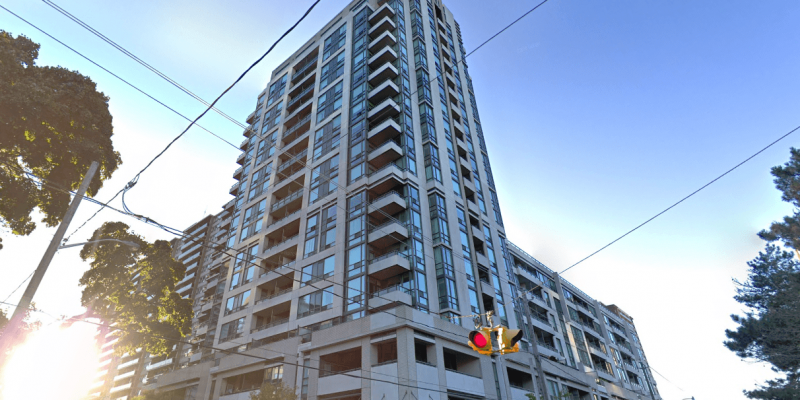 Flo Condos is located at 28 Avondale Ave, near the intersection of Yonge and Sheppard. 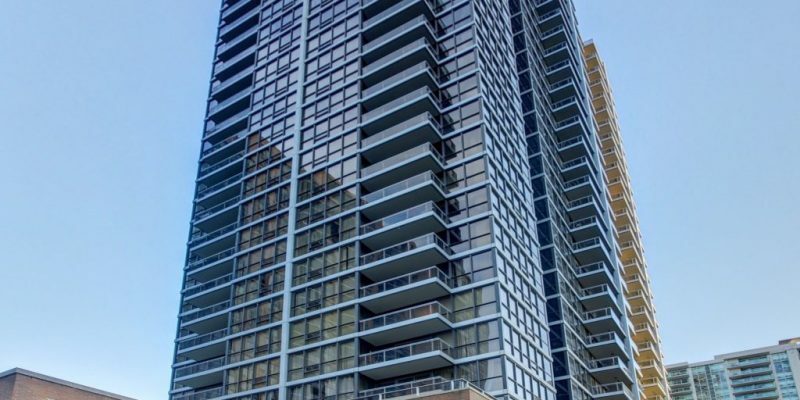 This North York condo was built in 2016 and has suites ranging from 459 to 802 square feet. Amenities include a Gym/Exercise Room, Common Rooftop Deck, Concierge/Security Guard, Party Room, Meeting/Function Room, Outdoor Patio/Garden and Parking Garage. Hullmark Centre is located at 2 Anndale Dr, near the intersection of Yonge and Sheppard . This North York condo was built in 2014 and has suites ranging from 462 to 2272 square feet. Amenities include a Gym/Exercise Room, Pool, Common Rooftop Deck, Concierge/Security Guard, Party Room, BBQs, Media Room/Cinema, Meeting/Function Room, Parking Garage, Games/Recreation Room and Sauna. Savvy is located at 19 Anndale Ave, near the intersection of Yonge and Sheppard. This North York condo was built in 2014 and has suites ranging from 480 to 2500 square feet. Amenities include a Gym/Exercise Room, Party Room, Media Room/Cinema, Pool, Parking Garage, Meeting/Function Room, Sauna, FibreStream Internet, Concierge/Security Guard and Guest Suites. Savvy is located at 17 Anndale Ave, near the intersection of Yonge and Sheppard. This North York condo was built in 2012 and has suites ranging from 480 to 2500 square feet. Amenities include a Gym/Exercise Room, Party Room, Media Room/Cinema, Pool, Parking Garage, Meeting/Function Room, Sauna, FibreStream Internet, Concierge/Security Guard and Guest Suites. Spring at Minto Gardens is located at 23 SHEPPARD AVE, near the intersection of Yonge and Sheppard. This North York condo was built in 2010 and has suites ranging from 517 to 1937 square feet. Amenities include a Gym/Exercise Room, Party Room, Media Room/Cinema, Pool, Parking Garage, Meeting/Function Room, FibreStream Internet, Concierge/Security Guard and Guest Suites.